So many more of the smaller things become visible when the leaves fall, like the tongue gall on these alder cones (strobiles.) 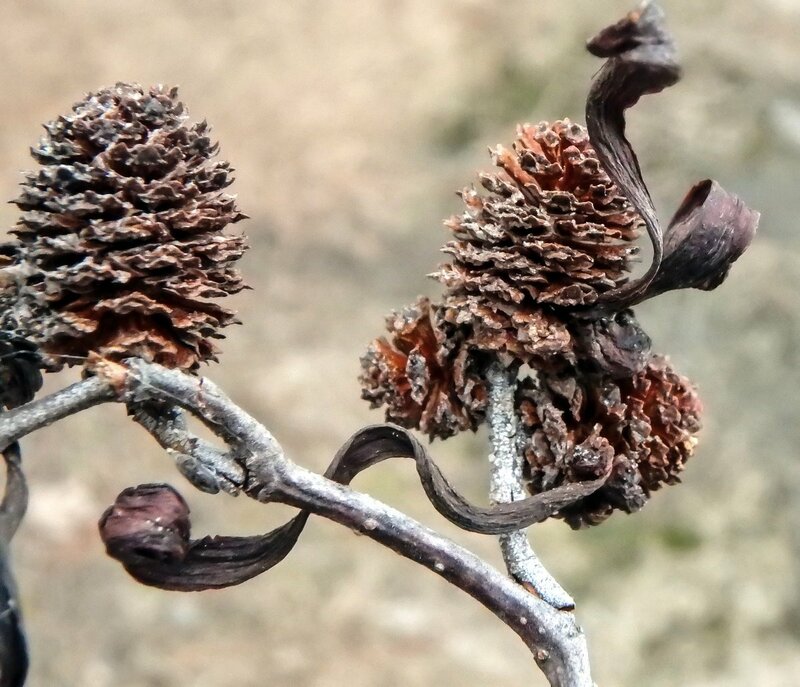 These long, tongue like galls are caused by a fungus called Taphrina alni. The fungus chemically deforms part of the ovarian tissue of the developing strobile and causes long, strap shaped galls called languets to grow from them. 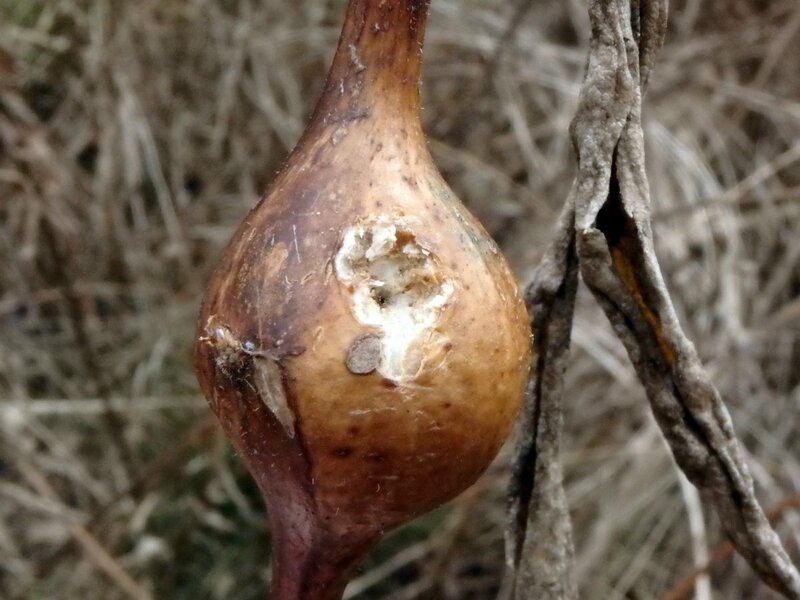 These galls, like most galls, don’t seem to bring any harm to their host. I wish I knew how they benefit from growing in such unusual forms. I didn’t know if this ladybug was dead or alive or maybe frozen, but it wasn’t moving. And where were its spots? 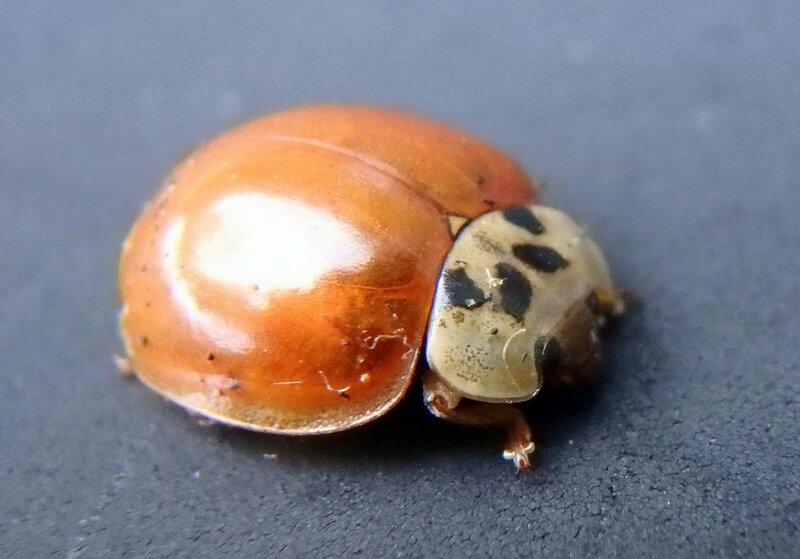 The answer is, it doesn’t have spots because it isn’t our native ladybug; it’s a female multicolored Asian ladybug. From what I’ve read it is highly variable in color and was purposely introduced by the U.S. Department of Agriculture as a biological control agent. It is a tree bark dwelling beetle that consumes large amounts of aphids and scale, both of which do large amounts of damage to crops. They’re slightly larger than our native beetles and can drive homeowners crazy by collecting on windowsills, in attics, and even indoors in the spring. They can release a foul smelling defensive chemical which some are said to be allergic to. We’ve had more snow in parts of the state. It’s very odd to leave my yard at my house that has no snow in it and drive to work where I see snow like this. It’s only a distance of about 25 miles, but it’s enough of an elevation change to cause cooler temperatures. It really drives home what a difference just a few degrees can make. 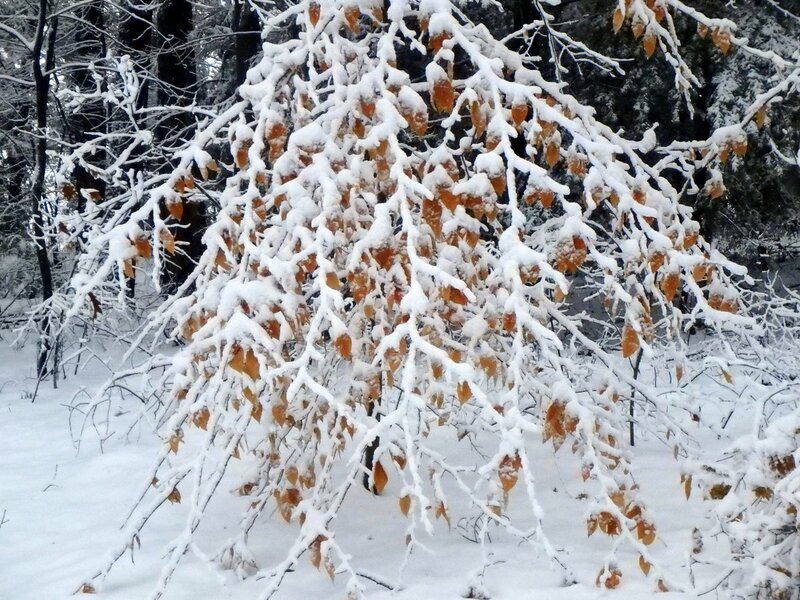 I thought this beech tree was beautiful, with its Christmas ornament like leaves. 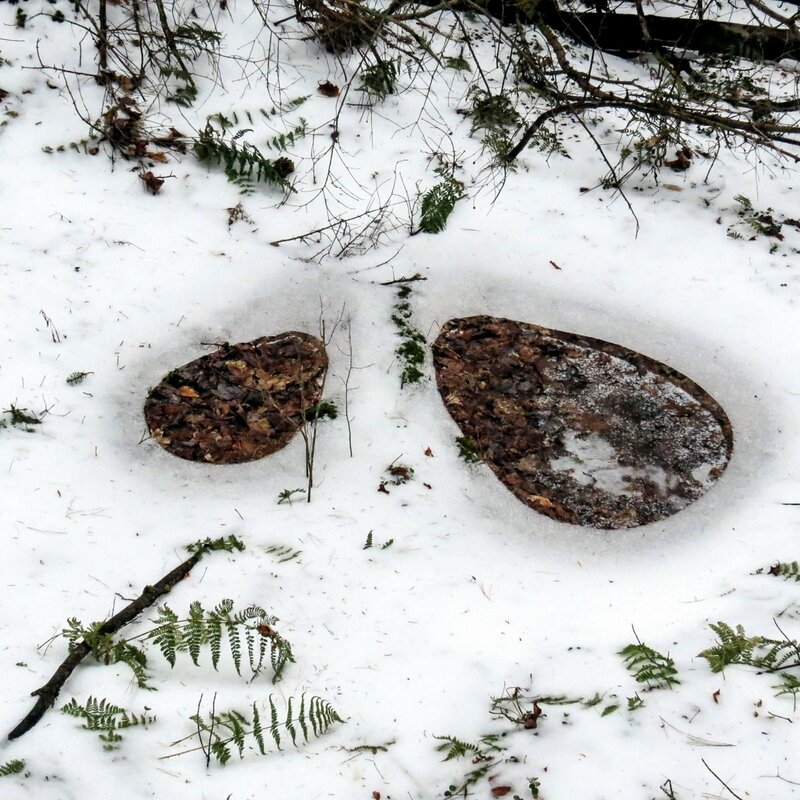 And what was that poking up out of the snow? It was a fallen limb which was covered by what I think was orange crust fungus (Stereum complicatum,) which is very common here. I see large fallen limbs almost completely covered by it. Though this isn’t a very good shot of it the color is so bright sometimes it’s like a beacon in the snowy landscape. 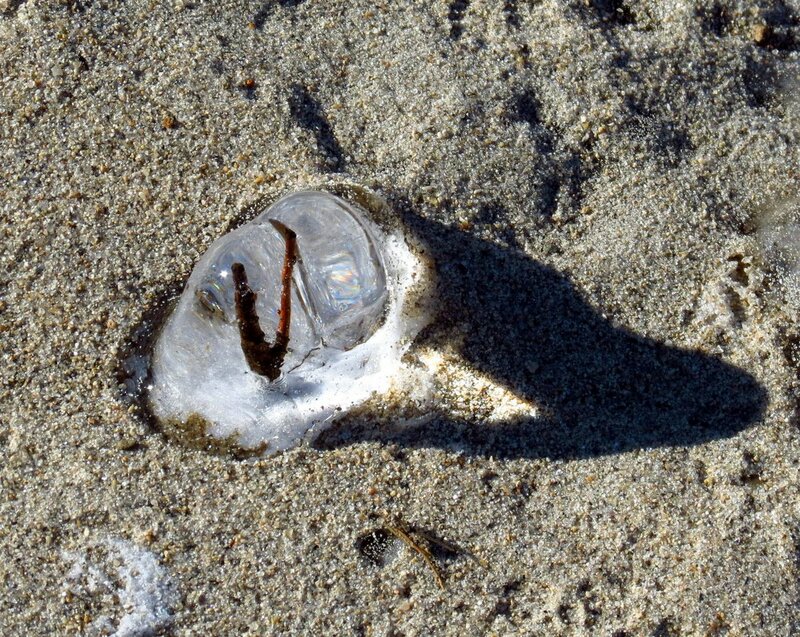 The complicatum part of its scientific name means “folded back on itself” and that is often just what it does. 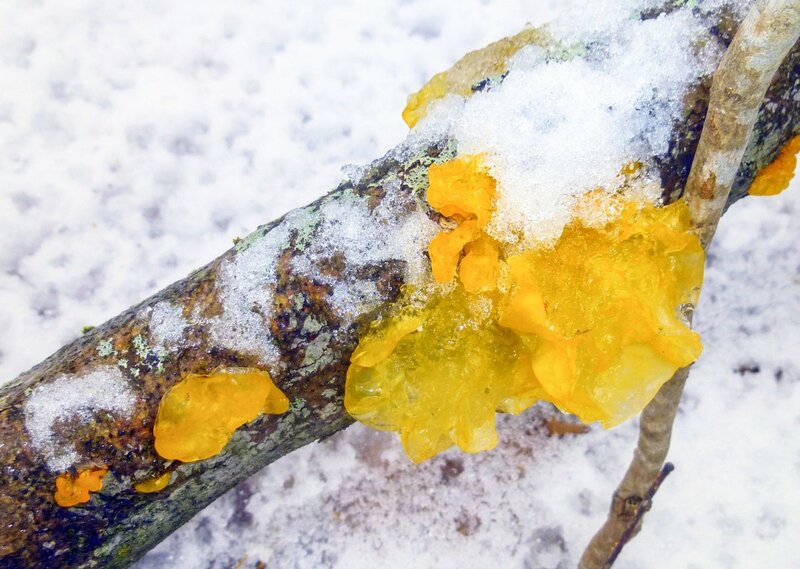 Amber jelly fungus (Exidia recisa) grew on the same branch the orange crust fungus grew on. I like holding these up so the light can shine through them because sometimes they look like stained glass. Being in the snow meant these examples had absorbed plenty of water so they were pliable and rubbery, like your ear lobe. 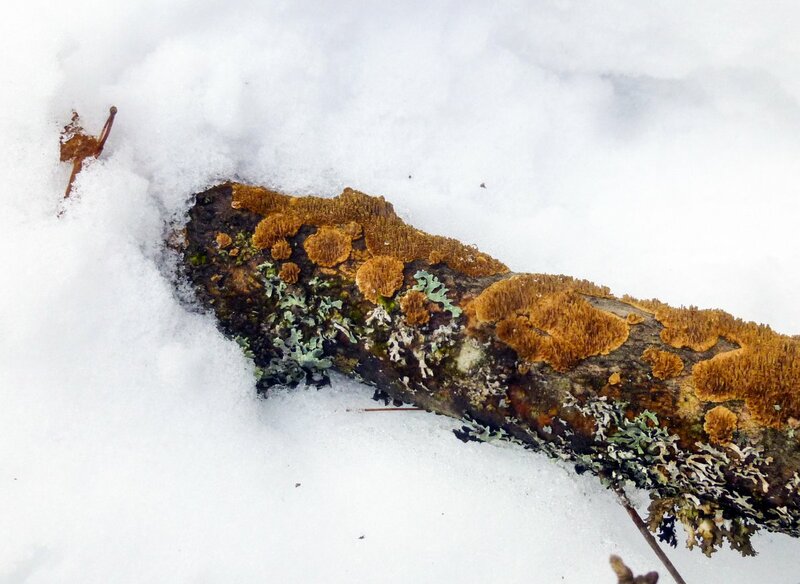 I see this fungus everywhere, especially on fallen oak limbs but also on alder and poplar as well. 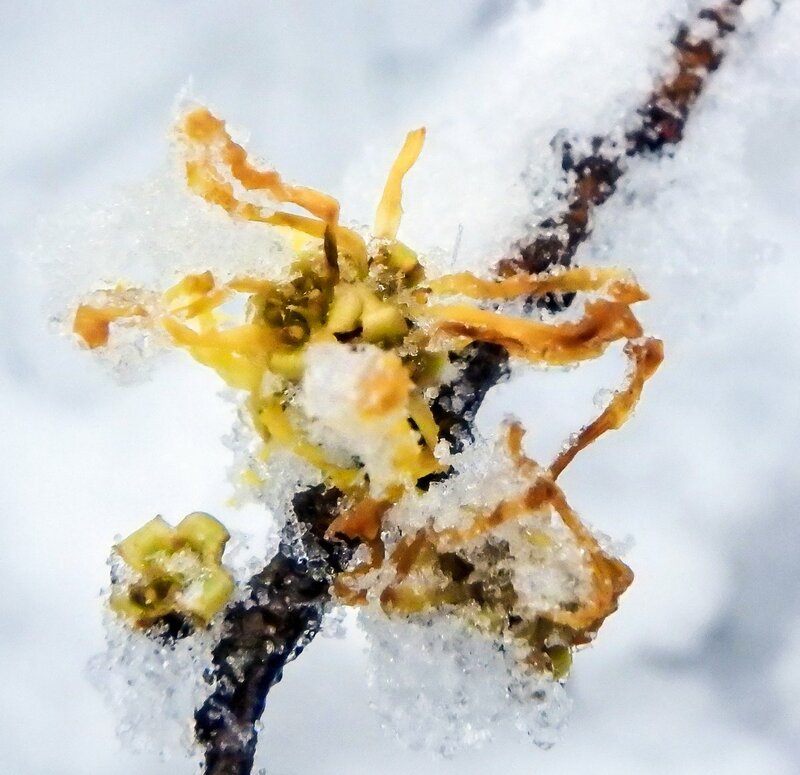 I decided to visit a grove of witch hazels (Hamamelis virginiana) that I know of to see if they were still blooming. 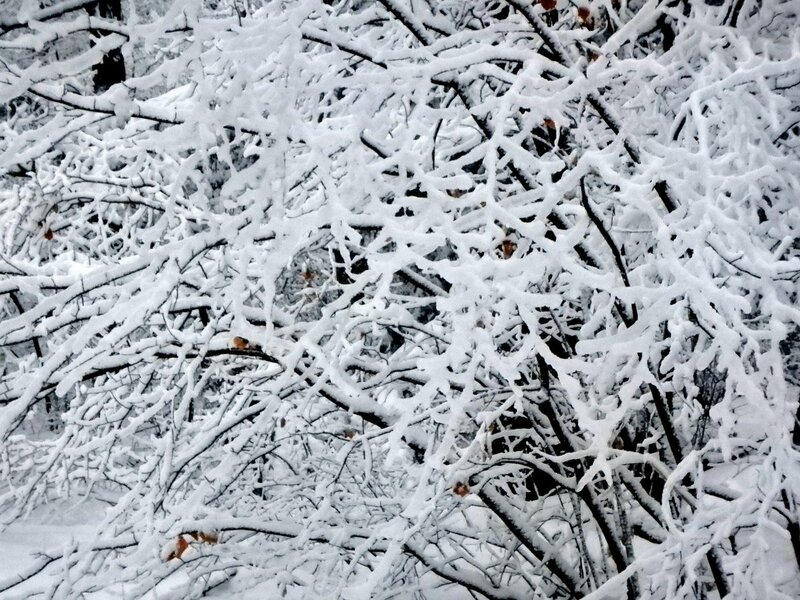 Blooming or not, they were beautiful with all of the newly fallen snow decorating them. And they were still blooming, even in the snow. This tells me that it must be the air temperature that coaxes them into bloom because it was about 40 degrees this day. I know it’s far too early to be looking at buds for signs of spring but red elderberry (Sambucus racemosa) buds are so pretty I couldn’t help myself. 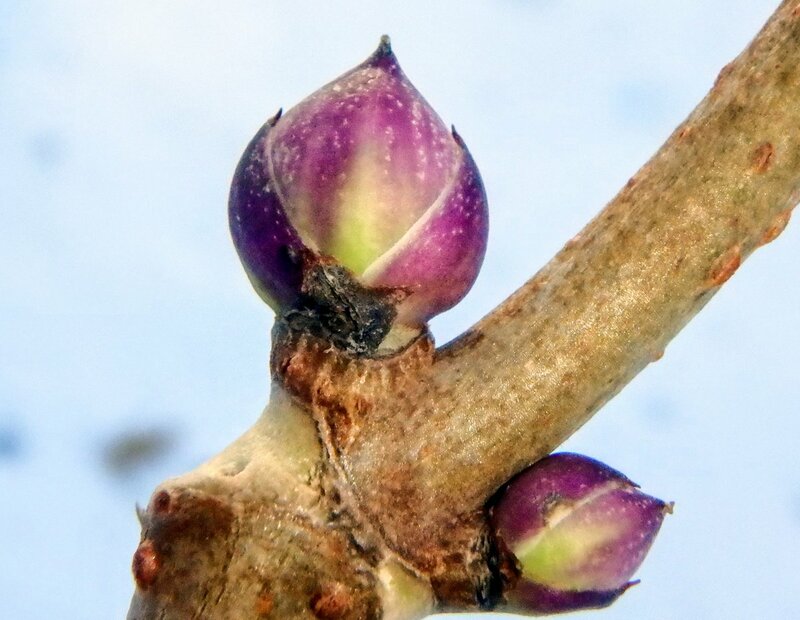 I’ve known people who thought that buds grew in spring when it warmed up, but most buds actually form in the fall and wait for warm weather to swell up and break and form leaves and / or flowers. 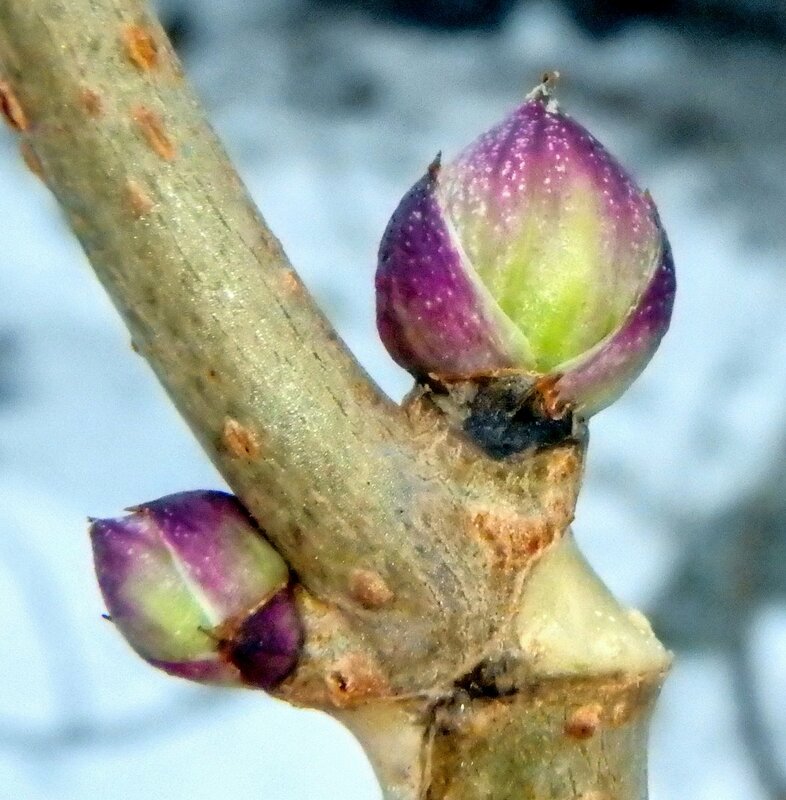 These buds should break in mid-May, if it’s warm enough. 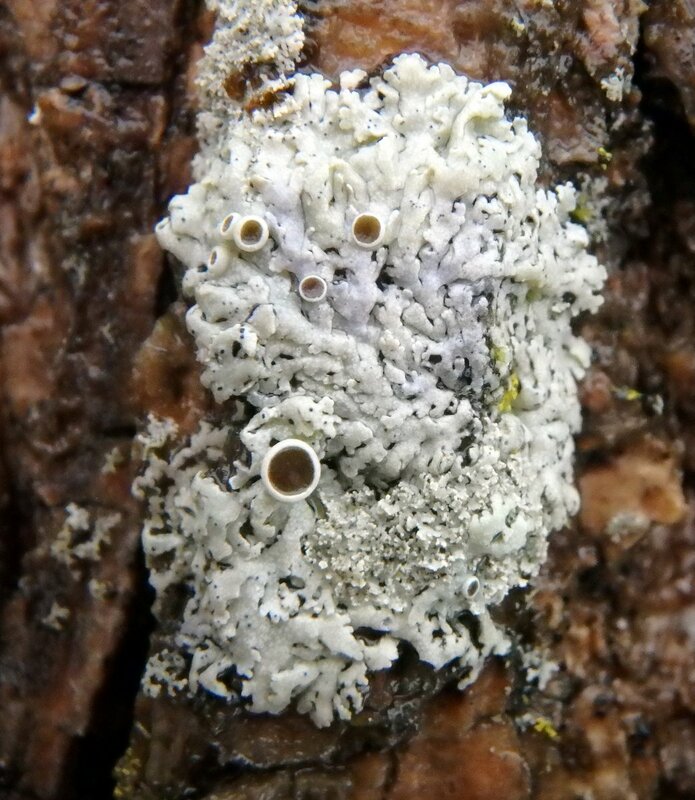 I’ve seen some unusual lichens lately, like this grayish white example which had the same color apothecia (fruiting bodies) as the body (Thallus.) 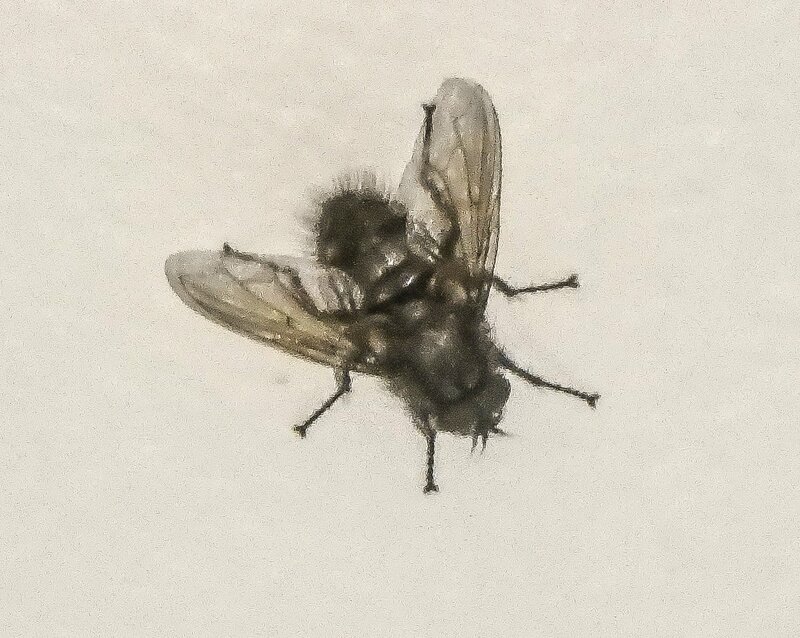 This made them hard to see and I only saw them by accident when I got close to look at something else. 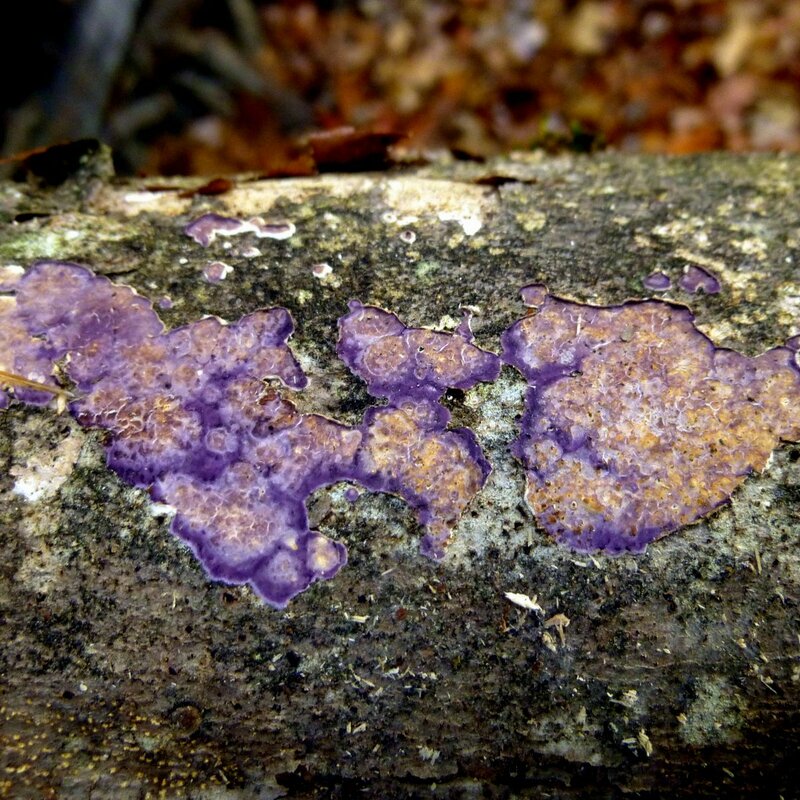 I wish I knew what caused the colors in a lichen. As far as we know they don’t use color to attract insects but many of them are brightly colored nevertheless. I have seen teeth marks in lichens so I’m fairly sure squirrels eat them and I know for sure that reindeer eat them, but I don’t know if this helps them spread or not. I also don’t know the identity of this lichen. I haven’t been able to find it in any of my lichen books or online. Here’s another unusual lichen; actually two lichens separated by the nearly horizontal crack between them. The lichen on top might be a bumpy rim lichen (Lecanora hybocarpa,) which gets its name from its bumpy body (Thallus) and the rims around its apothecia. The lichen below the crack has me baffled. It has a fringe around its perimeter that makes it look like a maple dust lichen but I can’t find any reference to apothecia on a maple dust lichen. It’s another mystery to add to the thousands of others I’ve collected. 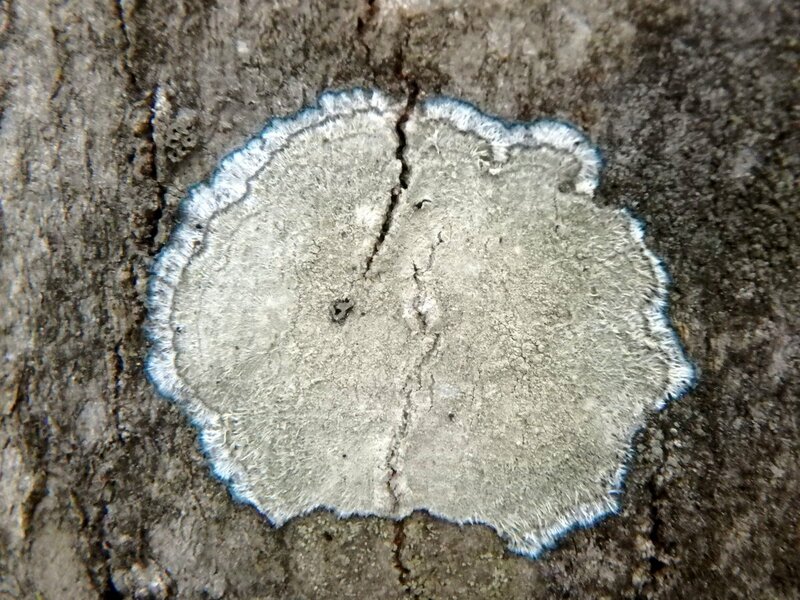 Here is a true maple dust lichen (Lecanora thysanophora.) Note the white fringe around its outer edge, much like the lichen in the previous photo. 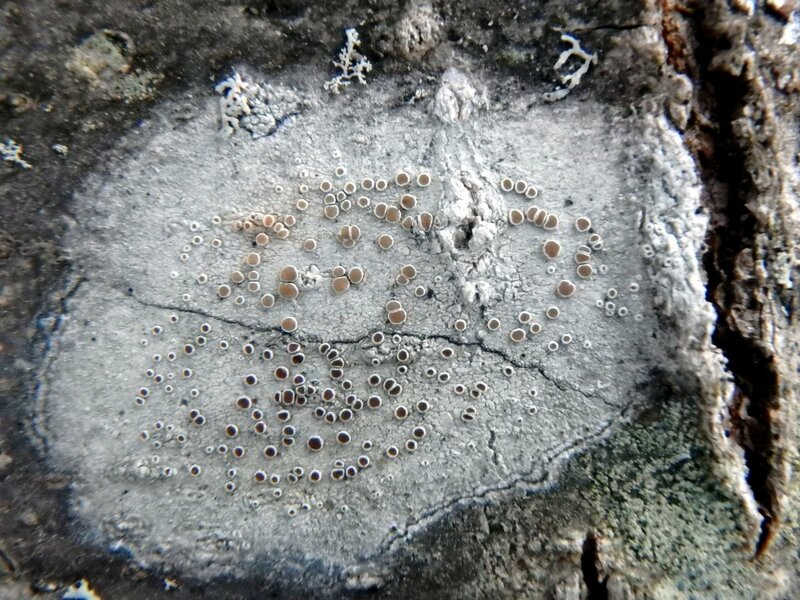 But unlike the previous lichen it has no visible fruiting bodies. 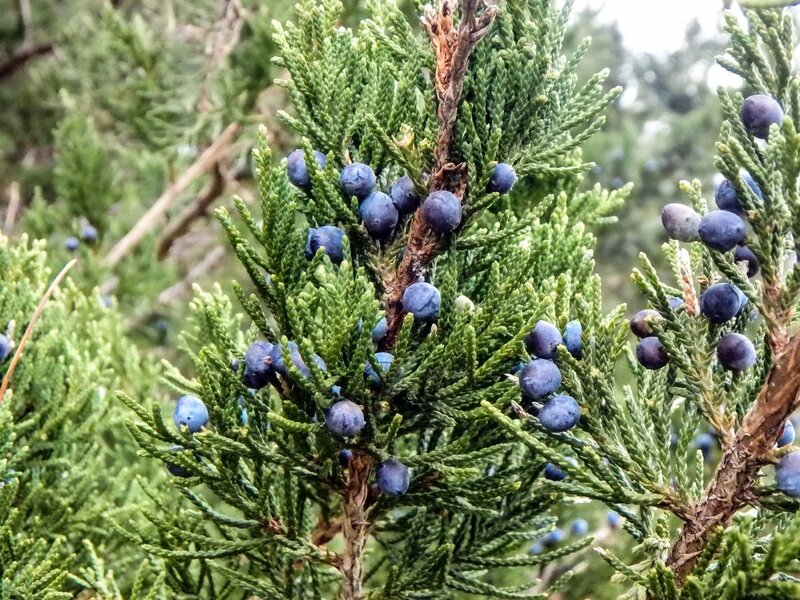 If you have ever tasted gin then you’ve tasted juniper berries, because that’s where gin’s flavor comes from. The unripe green berries are used for gin and the ripe, deep purple black berries seen here are ground to be used as a spice for game like deer and bear. The berries are actually fleshy seed cones and they appear blue because of a waxy coating that reflects the light in such a way as to make them appear blue. The first recorded usage of juniper berries appears on an Egyptian papyrus from 1500 BC. Egyptians used the fruit of junipers medicinally and Native Americans used them both as food and medicine. Stomach disorders, infections and arthritis were among the ailments treated. 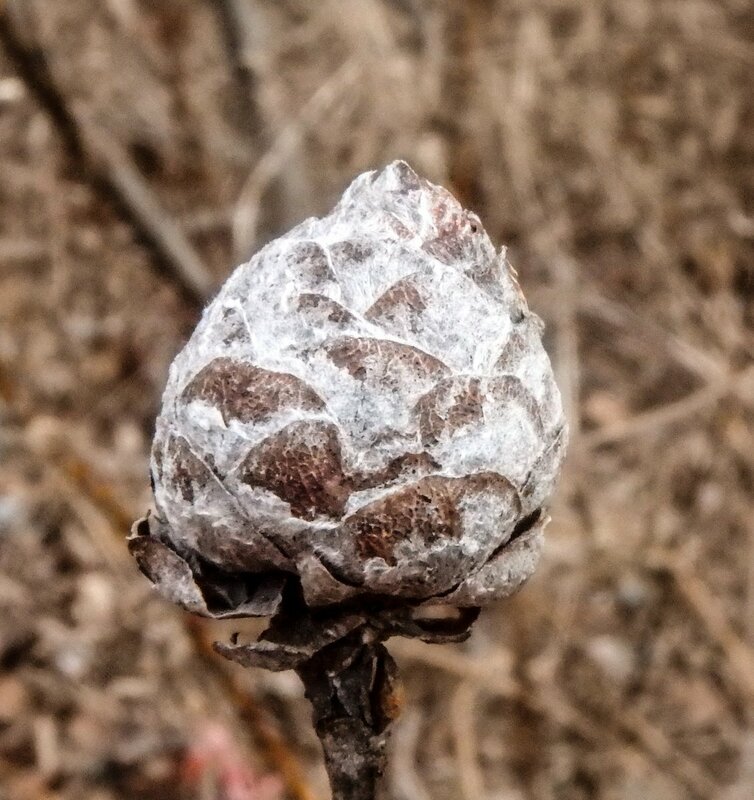 Gray, furry willow pine cone galls appear on the very tips of willow branches, because that’s where a midge called Rabdophaga strobiloides lays its egg. 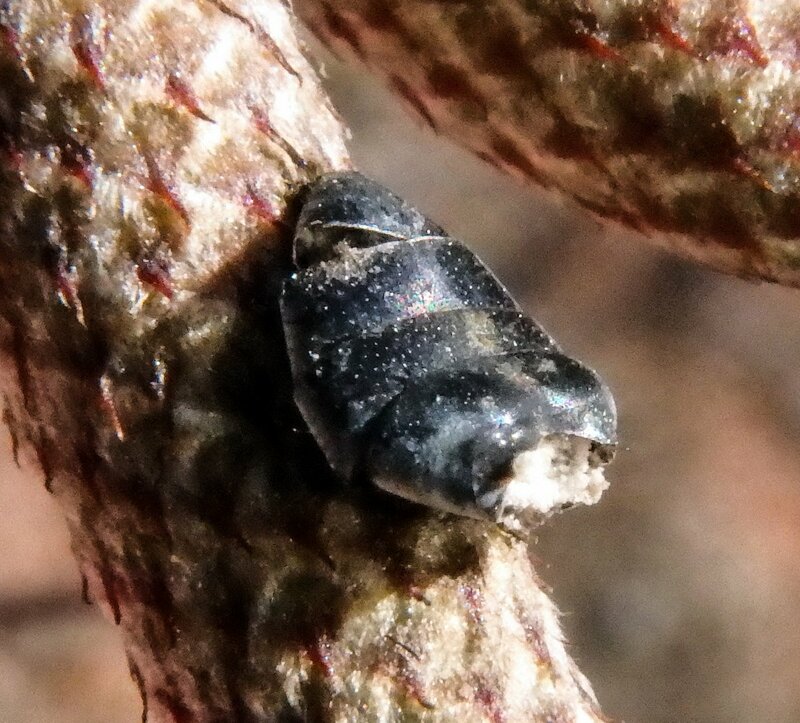 Once the eggs hatch the larvae burrow into the branch tip and the willow reacts by forming a gall around them. These galls are about as big as the tip of your thumb and do not harm the plant. 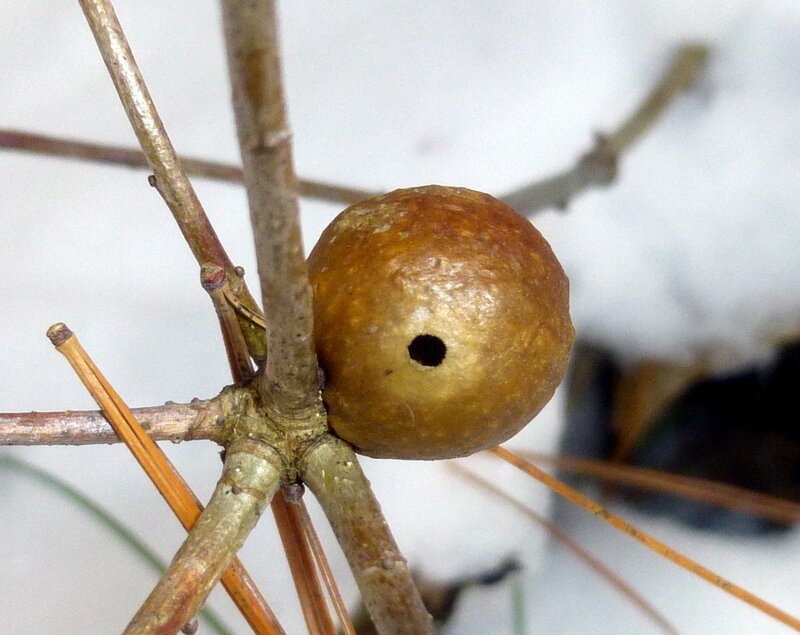 A woodpecker, chickadee, or other bird started pecking at this goldenrod gall to get at the gall fly larva (Eurosta solidaginis) that is growing inside the gall. These galls have thick walls that discourage parasitic wasps like Eurytoma gigantean from laying its eggs inside the larval chamber. If successful the wasp larva quickly eat the gall fly larva. If the bird is successful then everything inside will be eaten. We’re certainly having some beautiful sunrises lately, probably because of the low cloud deck we seem to have almost every morning. And those low clouds can hide things, including mountains. Off to the left in this photo is the huge bulk of Mount Monadnock behind the clouds. It’s too bad it was hidden; the bright morning sunshine on its snowy flanks tells me it probably would have been a beautiful scene. We burn a lot of wood here in New Hampshire because with 4.8 million acres of forest it is plentiful and usually costs less than oil heat. One of the things I like about burning wood is the handling of it. 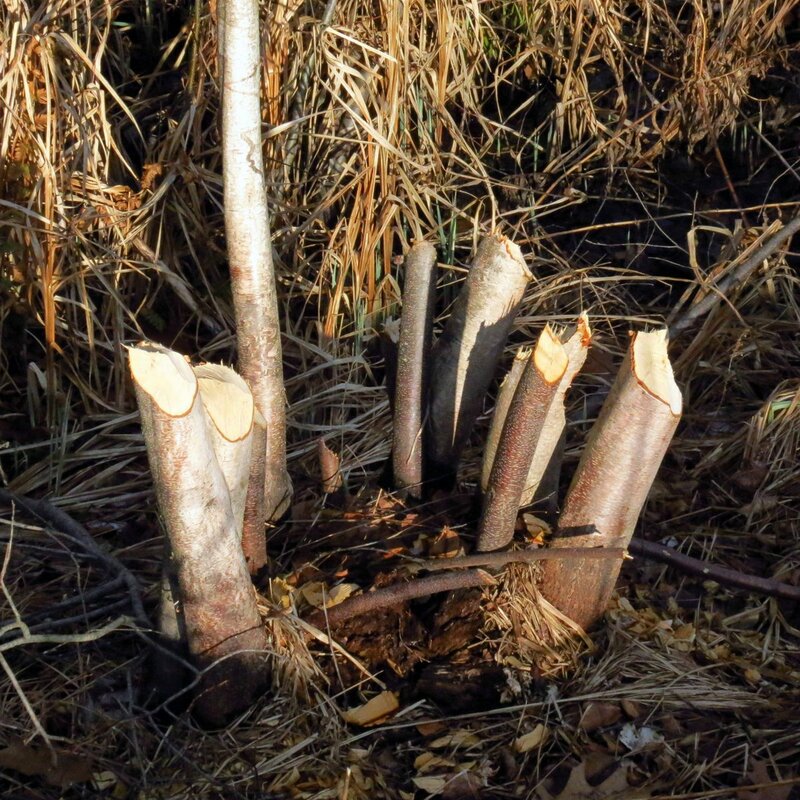 Cutting, splitting and stacking means you have to handle each piece a few times, and when you do you notice things that you might have never seen while the tree was standing. The following photos are of the various things I found in this woodpile. 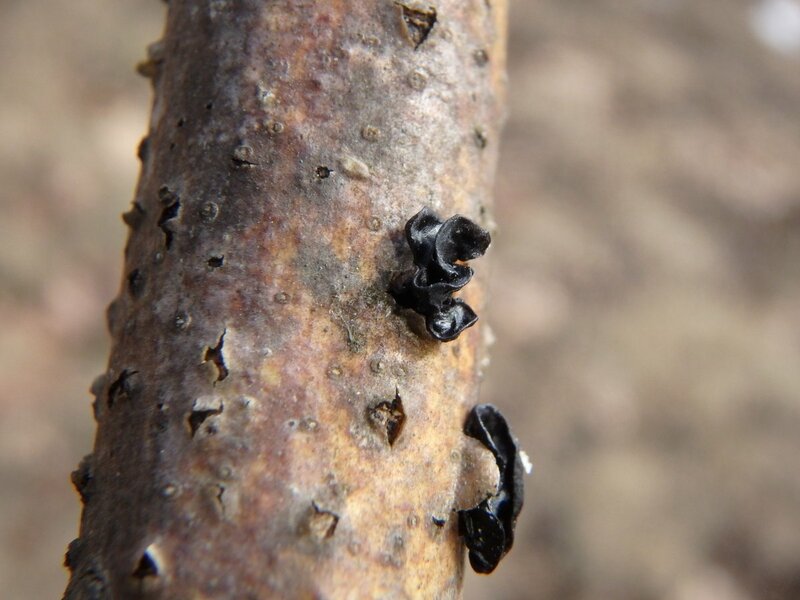 Black jelly drop fungi (Bulgaria inquinans) grew on an oak log. They are also called poor man’s licorice but they aren’t edible. 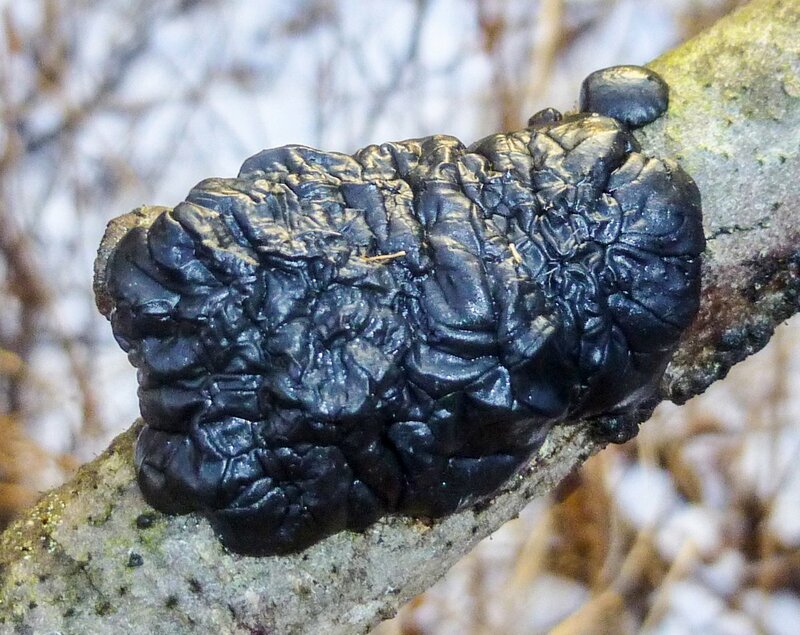 They look and feel like black gumdrops, and for some unknown reason are almost always found on oak trees that have been felled and cut up for firewood. 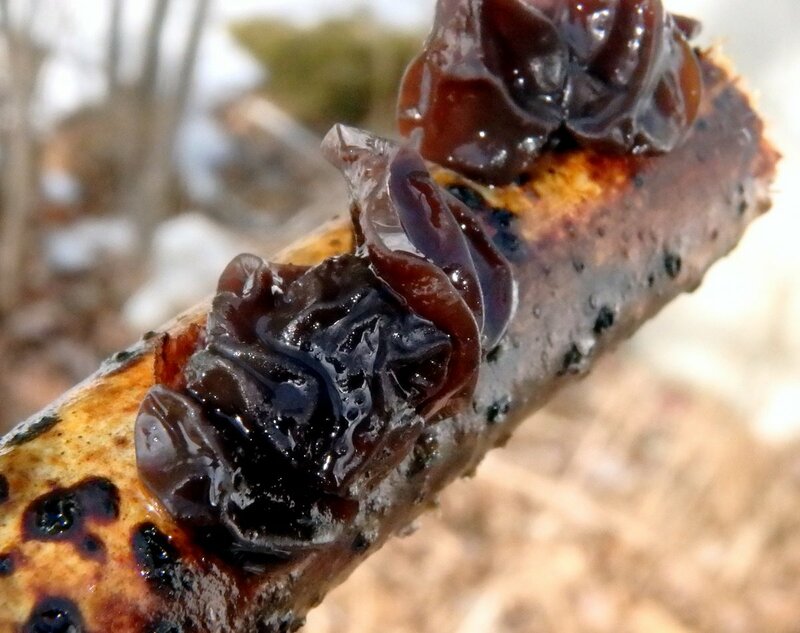 Though they look like jelly fungi black jelly drops are sac fungi. 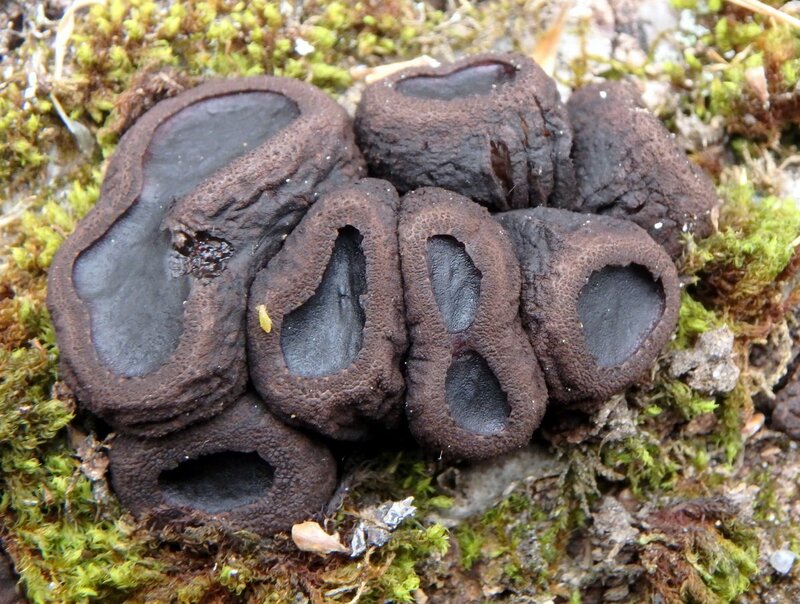 Their fertile, spore bearing surface is shiny and the outside of the cups look like brown velvet. They are sometimes used for dying fabric in blacks, browns, purples and grays. 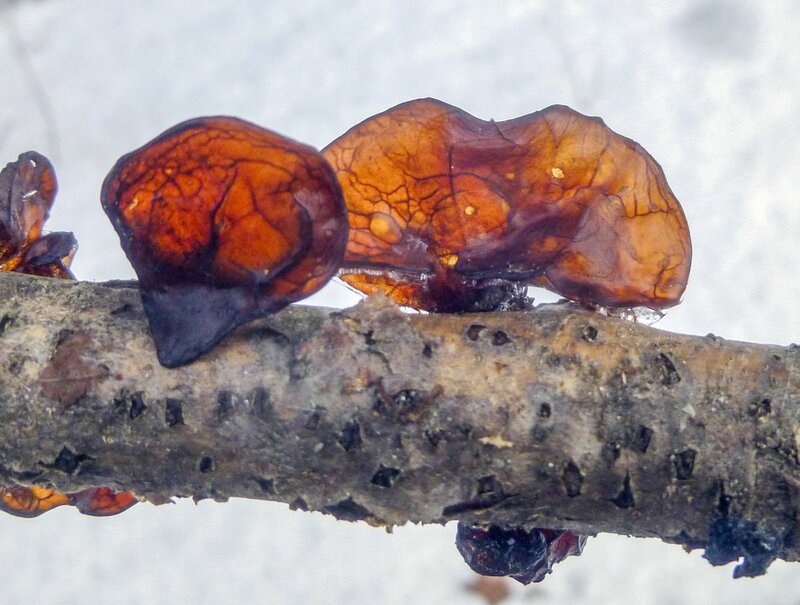 This is an example of a true jelly fungus, which is little more than a bag of water that inflates to about 60 times its dry size when it rains. 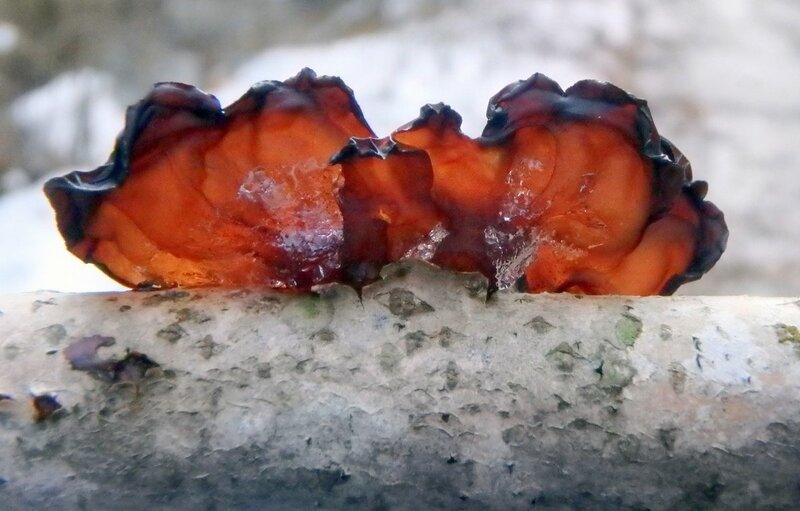 If it was dry this amber jelly fungus (Exidia recisa) would be just a dark flake on the tree’s bark. After absorbing plenty of rainwater this example was about as big as an average adult fingernail. 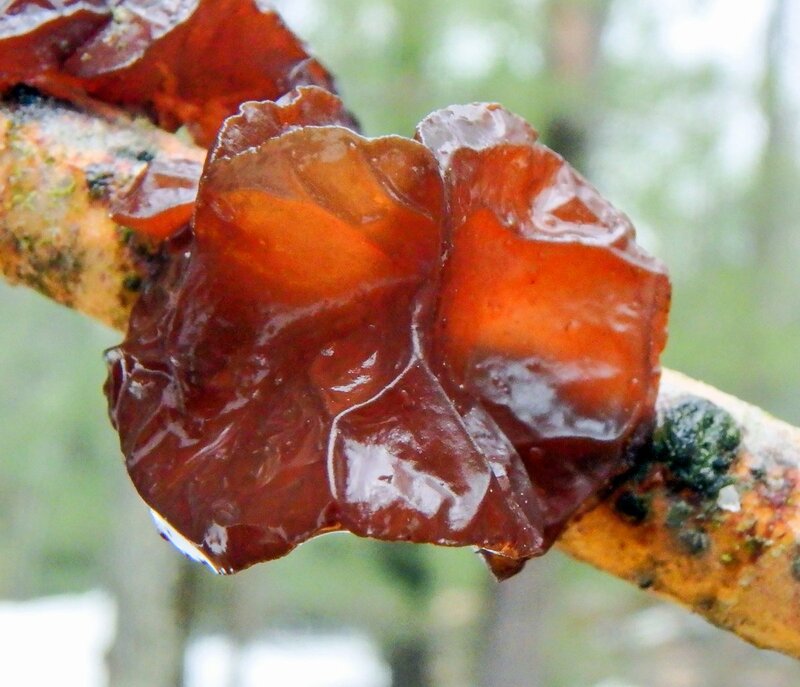 Jelly fungi feel cool to the touch and kind of rubbery, like your ear lobe. Their spores are produced on their shiny surfaces. If you look closely at them you can see that one side is shiny and the other has more of a matte finish. I find these on oak more than other species, but sometimes on poplar and alder as well. This brown jelly cup fungus (Peziza repanda) looked a little tattered and dirty but it’s a good example of the variety of fungi you can find on cut logs. 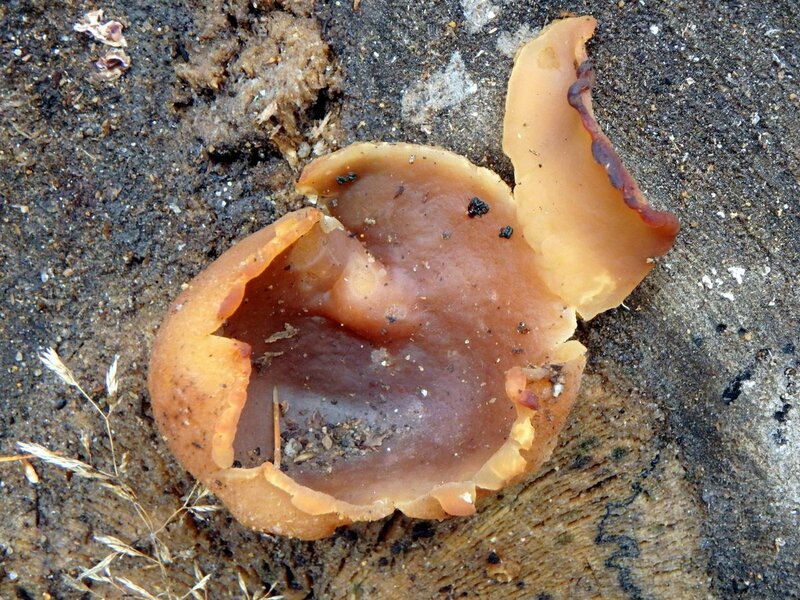 Though it is called a jelly cup it is a sac fungus and different Peziza species can grow on wood, soil, or dung. This example is a cool weather mushroom that grows on hardwood logs or wood chips, and it is usually seen in spring and fall. 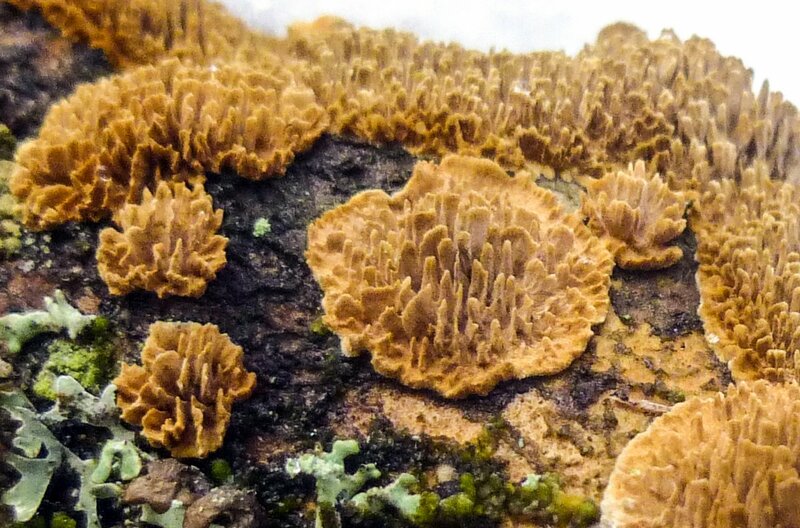 Mushroom expert Michael Kuo says brown cup fungi can be very difficult to identify. Hairy Stereum (Stereum hirsutsm) is also called the hairy curtain crust fungus. The common name comes from the way these fungi are covered with fine velvety hairs on their upper surface when they’re young. They like to grow on fallen hardwoods and can be found just about any time of year. The color can vary but the wavy edge helps identify them. These examples were very young. 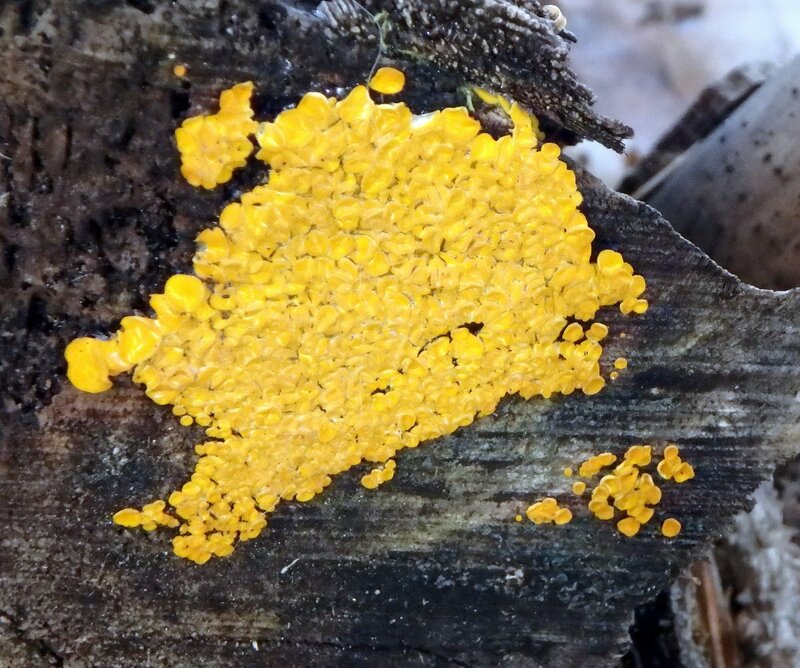 Witch’s butter on a log in a woodpile might alert you to the fact that you’ve got some soft wood mixed in with your hardwood, because this fungus usually grows on hemlock logs. 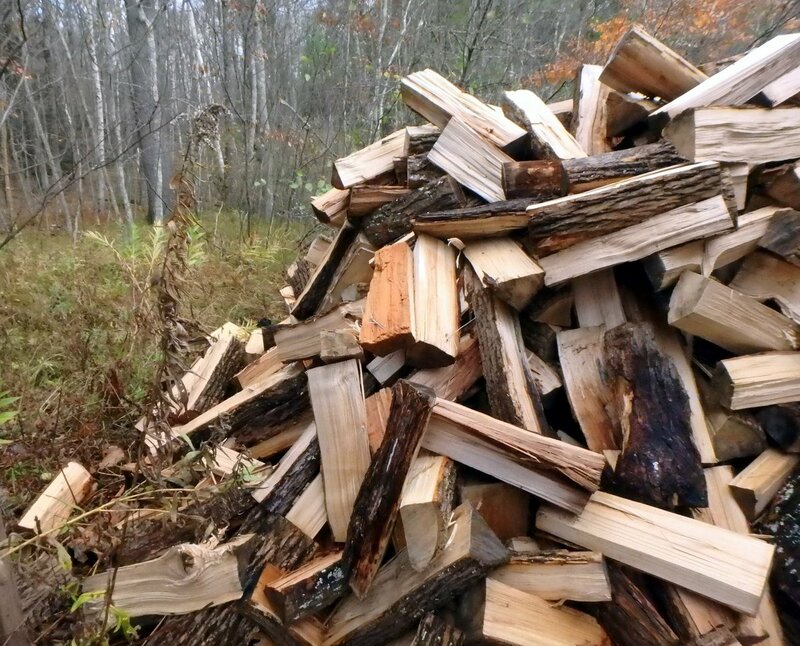 You can burn soft woods like hemlock but they burn faster and don’t heat quite like hardwoods. They can also cause a lot of creosote buildup in a chimney. Many of the logs shown in the first shot in this post were dragged. 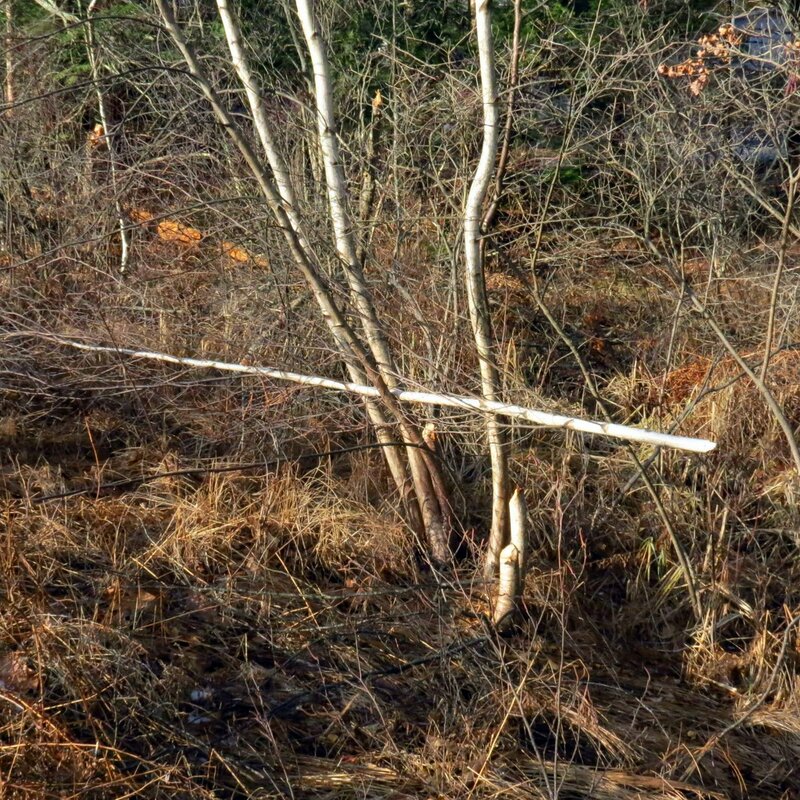 It’s a common practice to have to drag cut trees out of a forest to a landing so they can be cut into manageable pieces and loaded onto logging trucks, and when this one was dragged a woodpecker hole became filled with soil. 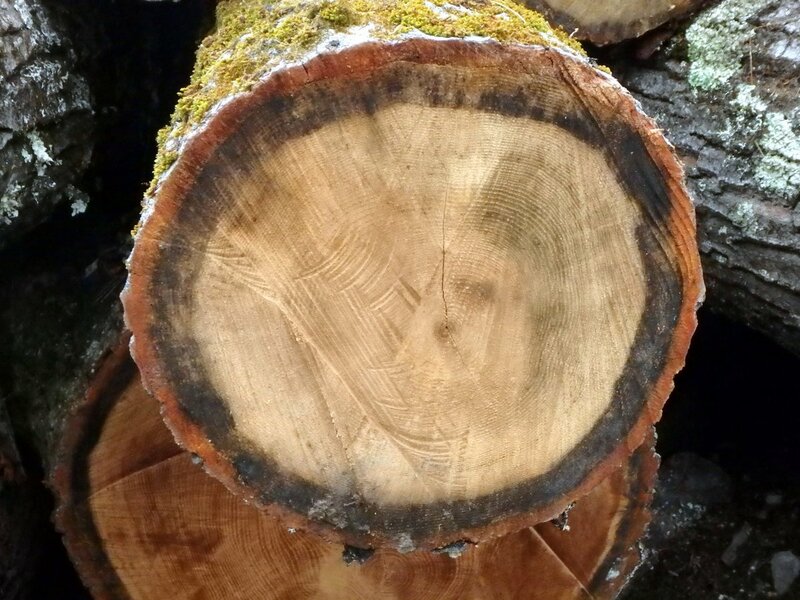 This is a good time to mention that nearly every log shown in this post came from a tree that had something wrong with it. 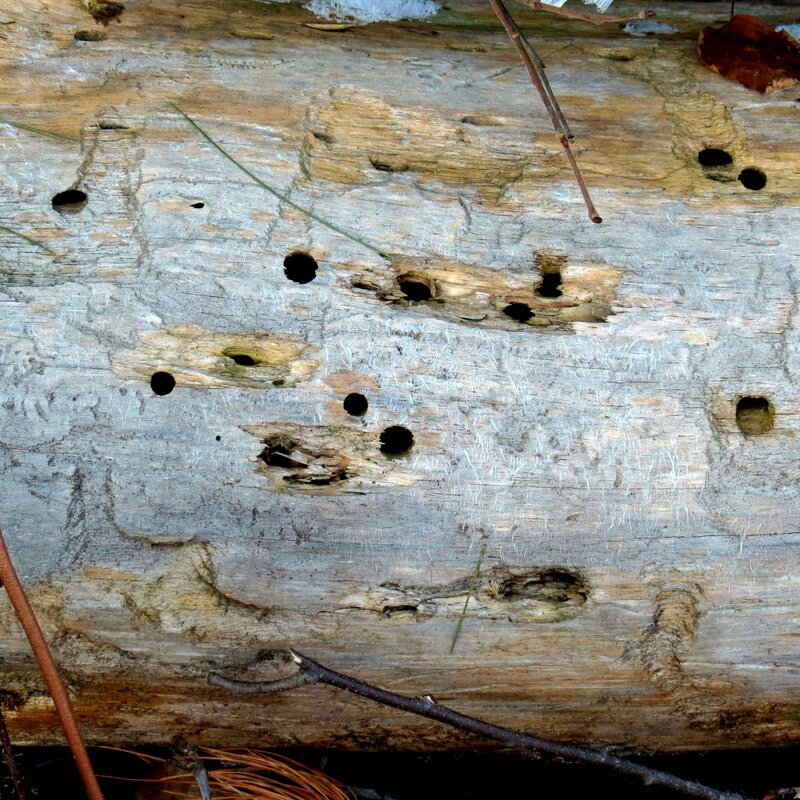 Woodpeckers dig holes in tree trunks to get at insects living in the tree; often carpenter ants. The ants eat the cellulose and weaken the tree, and it isn’t that unusual to find that the tree you’ve cut is completely hollow. This example was hollowed out either by insects or heart rot cause by a fungus. Mushrooms and other fungi growing on trees is never a good sign. All of this weakens the tree and when a good wind comes along, down they go. Friends of mine just lost their barn to a hundred + year old pine tree that fell and cut the barn right in half. The tree people estimated its weight at 20 tons. That’s 40,000 pounds of wood, and we’re all very thankful that we weren’t anywhere near it when it fell. It was hollow, just like the one in the photo. It was also full of big, black carpenter ants. This tree had a double whammy. 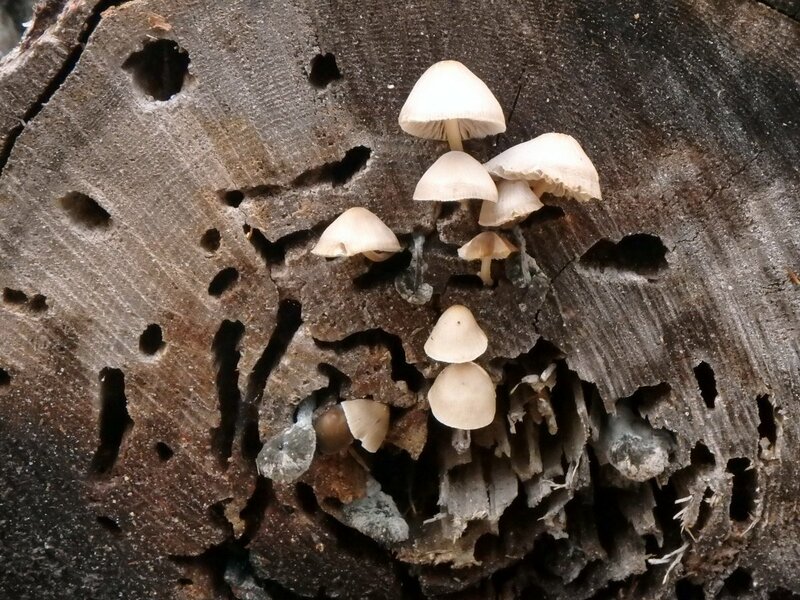 The channels were caused by insects, probably carpenter ants, and then fungal spores got in and revealed themselves when they fruited into these little white mushrooms. It’s possible that the insects in the tree were farming this mushroom and brought parts of it into their channels to feed on. In any event this tree’s life was shortened by quite a few years. It could have stood hollow and lived on for a long time but heaven help anyone who was near it when it finally came down. A woodpecker made two holes in this oak tree, one above the other, and as the tree tried to heal itself the holes became spoon shaped. 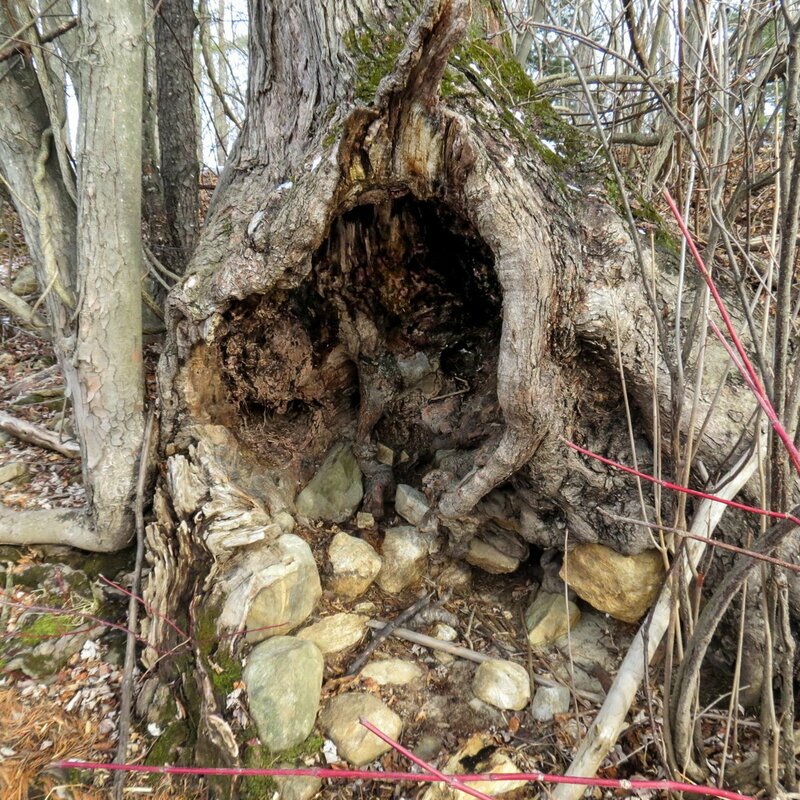 It’s another example of what was a standing hollow tree. Everyone knows that moss grows on trees but what everyone might not know is that many trees like this oak have channels in their bark which direct rainwater down to the tree’s roots. 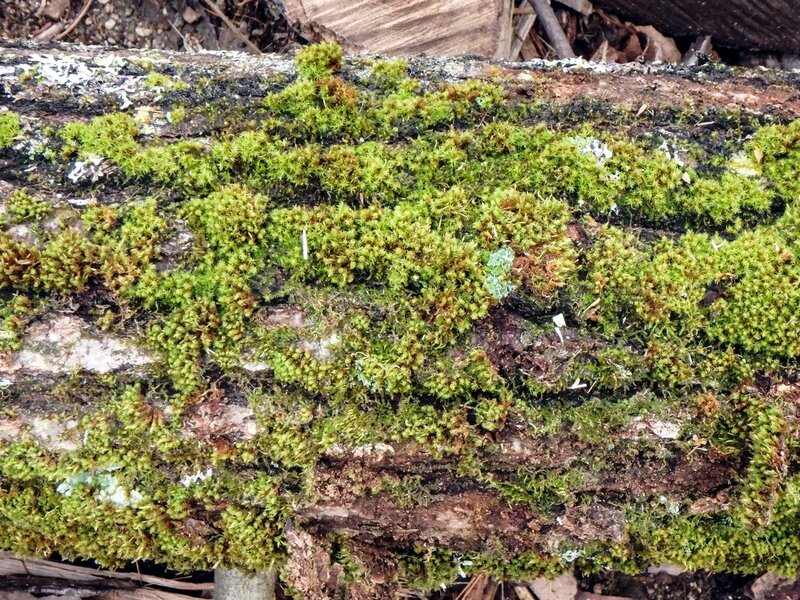 They can be clearly seen in this example, and so can the moss growing right beside and between them. Mosses like a lot of water and when they grow on a tree trunk they get it by growing next to these vertical streams. Do they grow on the north side of trees? Yes, and on the east, west, and south sides too; whichever is more moist. Lichens are a common sight in woodpiles and beard lichens are very common. 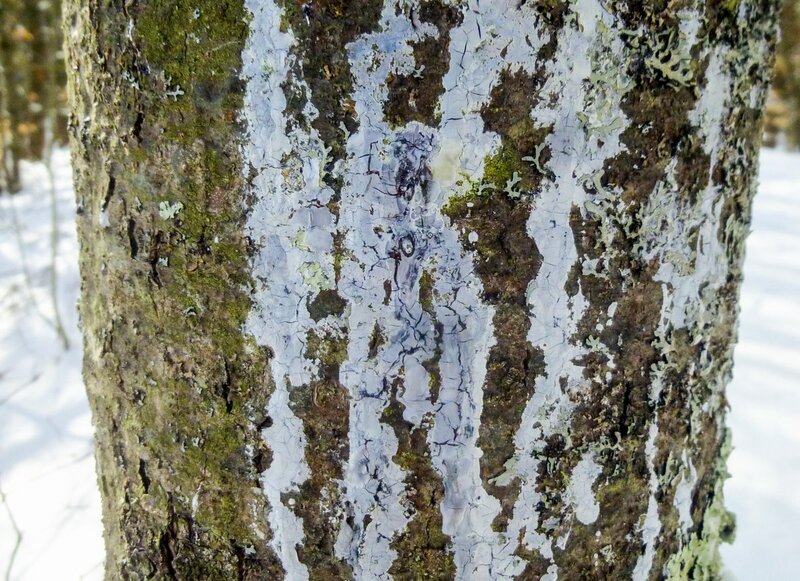 Often you can see them growing all up and down the trunks of trees and much like mosses, lichens grow near the channels in the bark so they can get ample moisture. 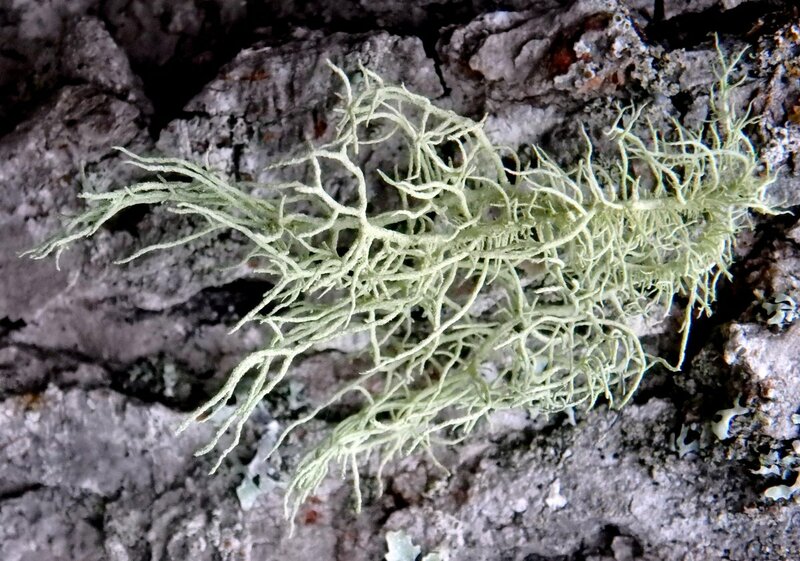 I think this example is a fishbone beard lichen (Usnea filipendula,) so called because of its resemblance to the backbone of a fish. 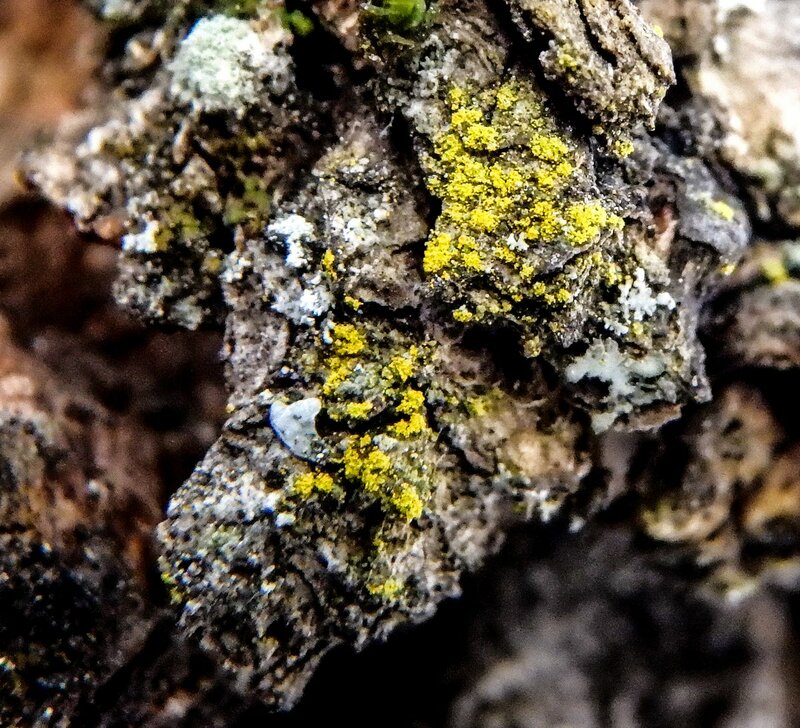 Many people seem to think that lichens will kill a tree but they are simply opportunists looking for all the rain and sunlight they can get and they just perch on trees like birds do. They take nothing from the tree, so if I pulled this one off this log and put it on a living tree it would just grow on as if nothing ever happened as long as it received the right amount of moisture and light. Lichens are virtually indestructible and that’s why some scientists say they are immortal, or as close to immortal as any living thing can be. I think this is the start of a beautiful crust fungus called the wrinkled crust (Phlebia radiata.) These mushrooms lie flat on the wood they grow on and have no stem, gills or pores. 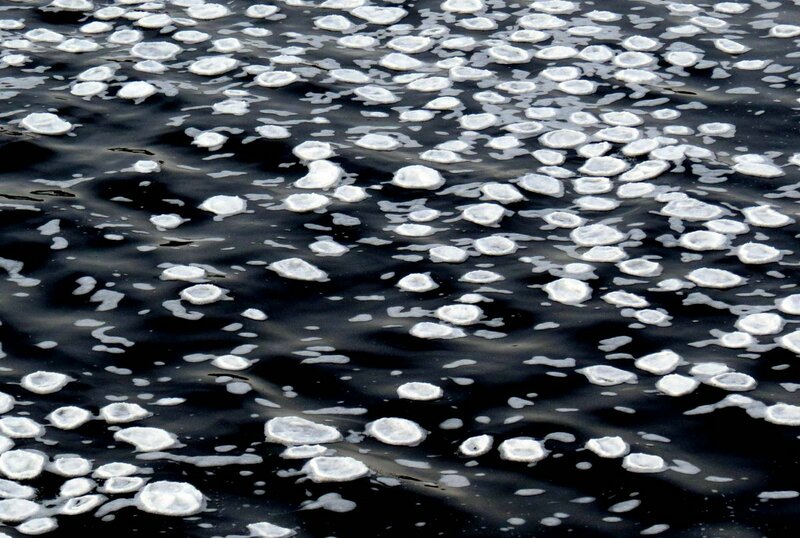 They radiate out from a central point and can be very beautiful. The darker area on this example is where it was wet and the lighter ones where it was dry. They don’t mind cool weather; I usually find them at this time of year and I’m hoping I’ll find a few more. 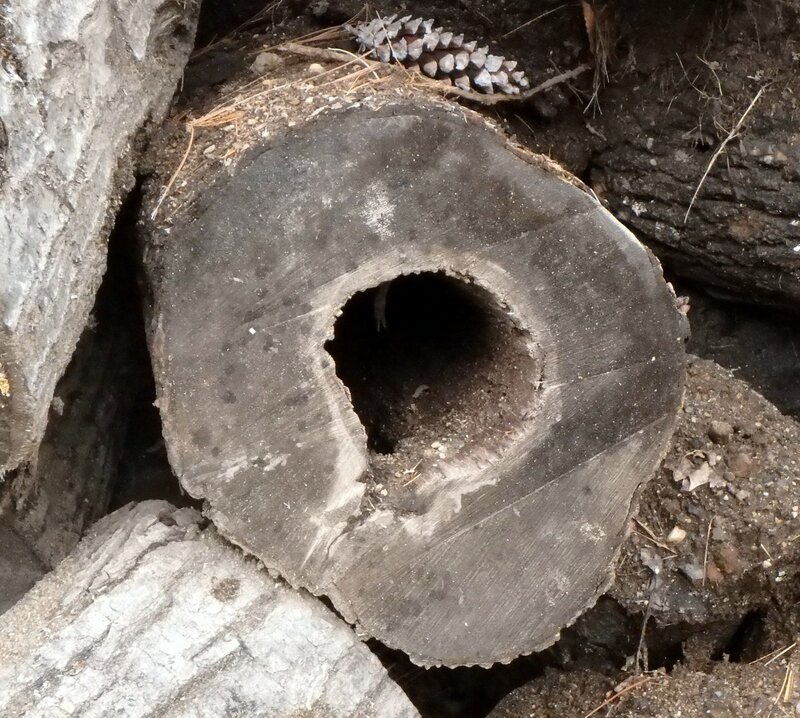 I’m not a logger or an arborist so I don’t know why this log has such a dark ring just under its bark. I zoomed in on the photo and counted the rings and found that the dark ring started about 12-14 years ago. Something must have happened back then to cause the change, but I can’t guess what it was. 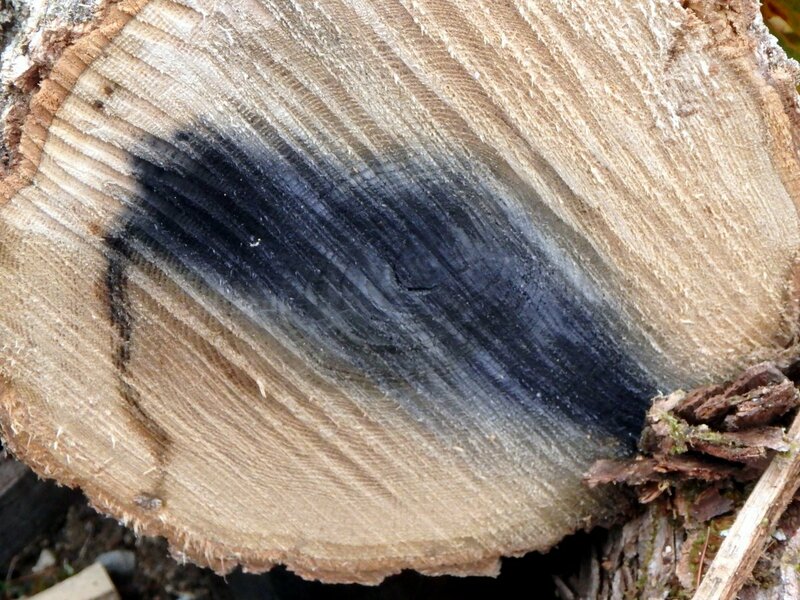 I do know what caused the purple staining in this log; iron, meaning it has foreign objects like screws or nails in it. Sawmills look for this kind of thing when logging trucks bring in a load of logs and they’ll reject the whole load if they see it. 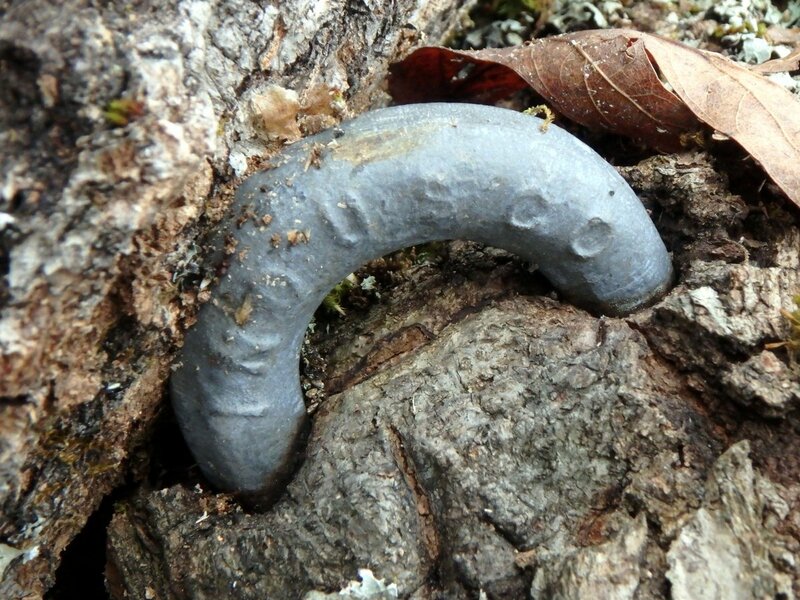 Here’s an example of a foreign object embedded in a tree. In a few more years the tree would have grown over it and it never would have been seen. The only thing that would have given it away was the purple staining when the tree was cat. Nothing will destroy a saw blade or chain quicker than something like this. 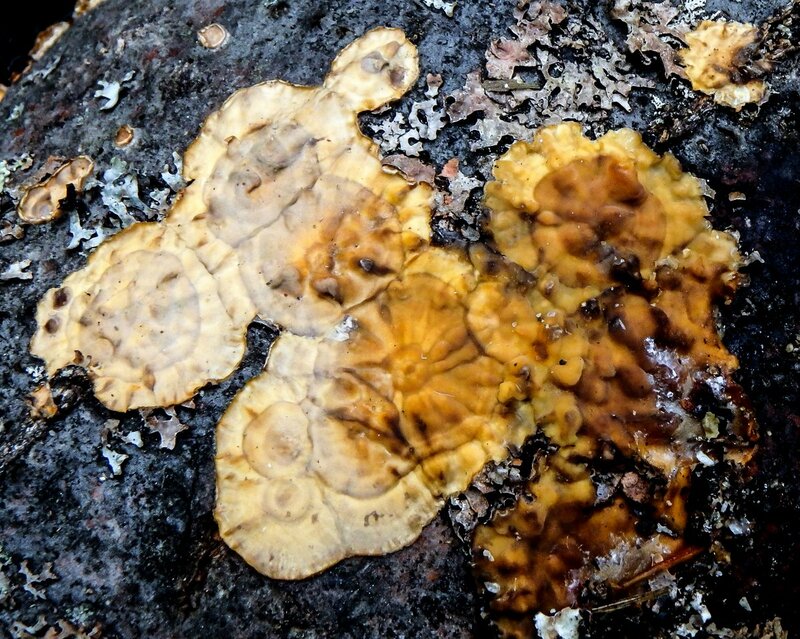 If all the stars and planets are aligned perfectly and you pay close attention to your wood pile you could find something as rare and beautiful as this cobalt crust fungus (Terana caerulea) in it. This photo was taken about three years ago and I’ve been looking for this beautiful fungus ever since, but have never seen another one. This is just the time of year for it to appear, so I’ll be watching for it. The old saying, as I’ve always heard it, says that firewood warms you three times; once when you cut it, once when you stack it, and once when you burn it, and I’d have to say that was just about right. If you dress in layers against the cold you’ll find yourself peeling them off in a hurry once you get to the wood pile. 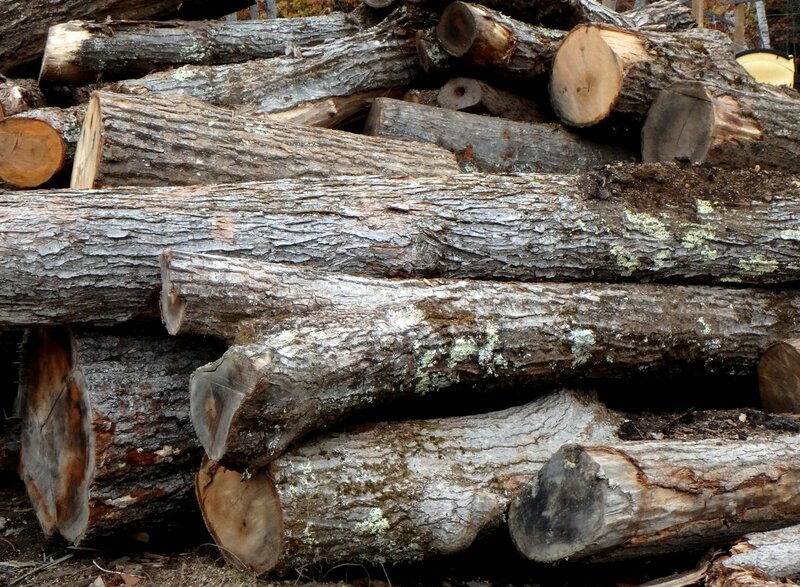 I’ve always looked at cutting and splitting wood as an enjoyable job though, and I hope this post might make the job of getting your woodshed filled just a little more enjoyable too. We were finally able to say good bye (and good riddance) to March last weekend, and this photo sums up why I was happy to see it go. It has been a strange and seemingly backwards winter, with above average temperatures in January and February bookended by bitter cold and snowstorms in December and March. 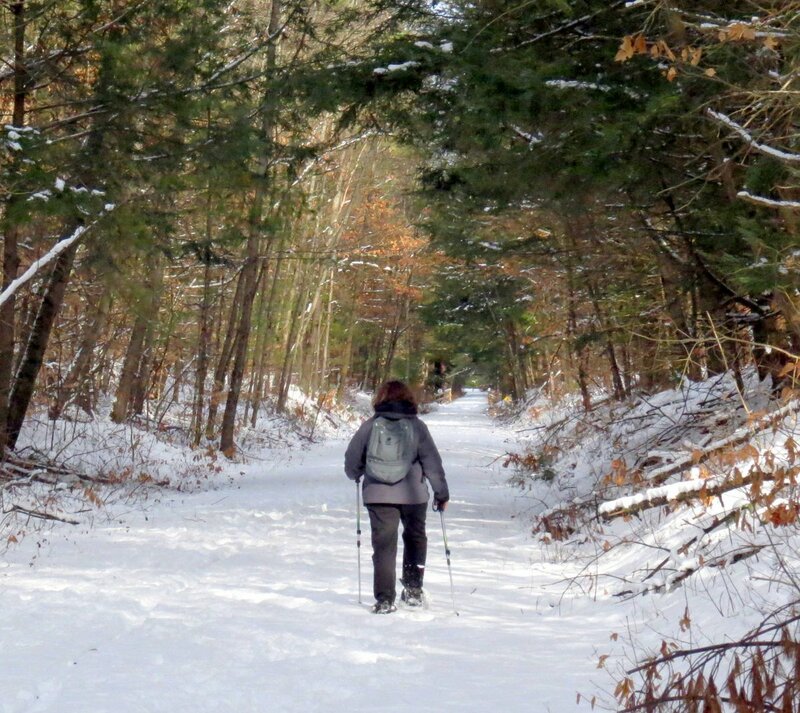 And ice; most of the trails have been ice covered all winter, which sure takes a lot of the fun out of being in the woods. 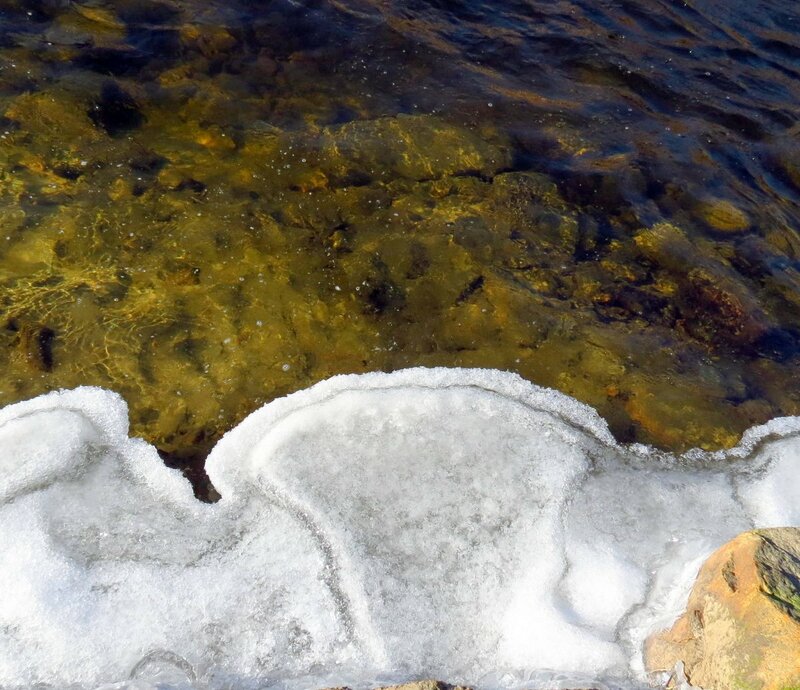 In spite of all the snow and ice spring still happens. 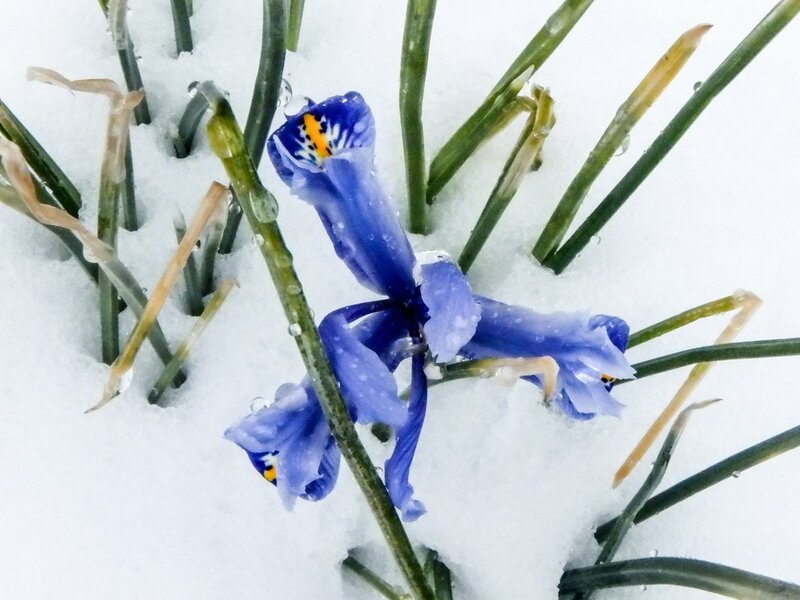 I saw several reticulated iris (Iris reticulata) blooming in the snow as if it were nothing out of the ordinary. 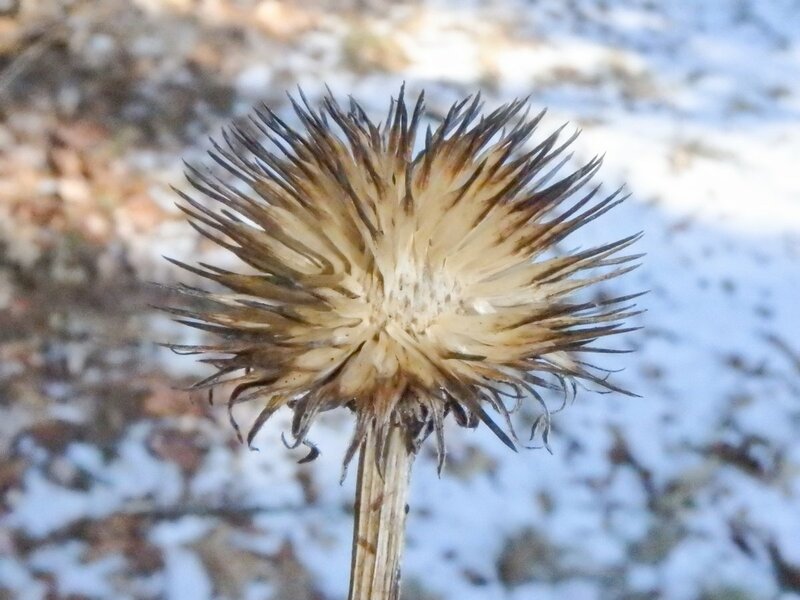 I’ve read that the plant comes from Turkey, the Caucasus, Northern Iraq and Iran but I know little about what winters are like in such places. They must be very cold. 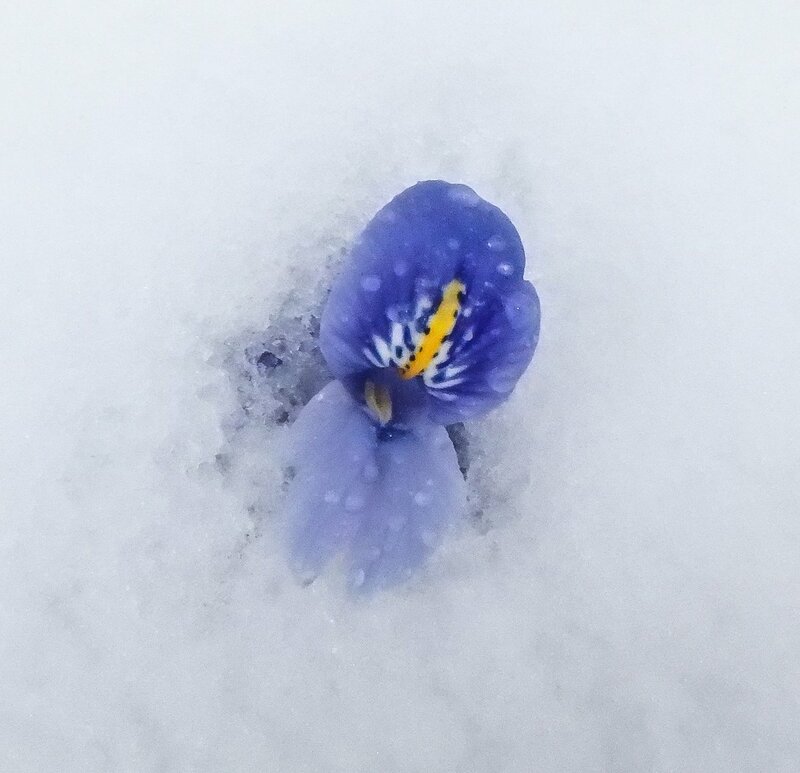 This one was almost completely buried by snow, but still it bloomed. 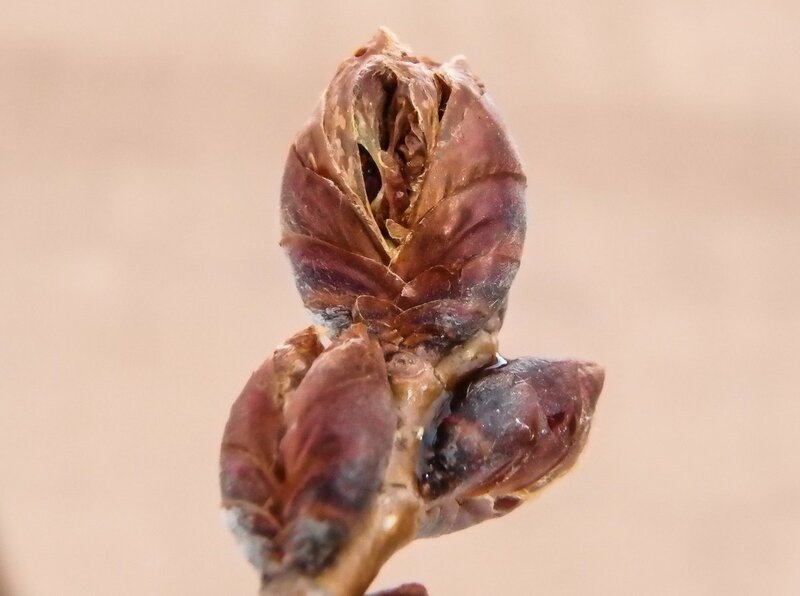 American elm buds (Ulmus americana) started to open but then thought better of it and have been at this stage for weeks now. I’m hoping to see its flowers soon. They say we might see 70 degrees next week. A hornet’s nest had fallen out of a tree and it made me wonder what hornets do in the winter. After a little research I found that all but the young queens die and the nests are abandoned in winter. The new, young queens (and their eggs) spend the winter under tree bark or inside warm human habitations. In the spring the queen builds a new nest. That explains the wasp I saw a week or so ago in the shop where I work. 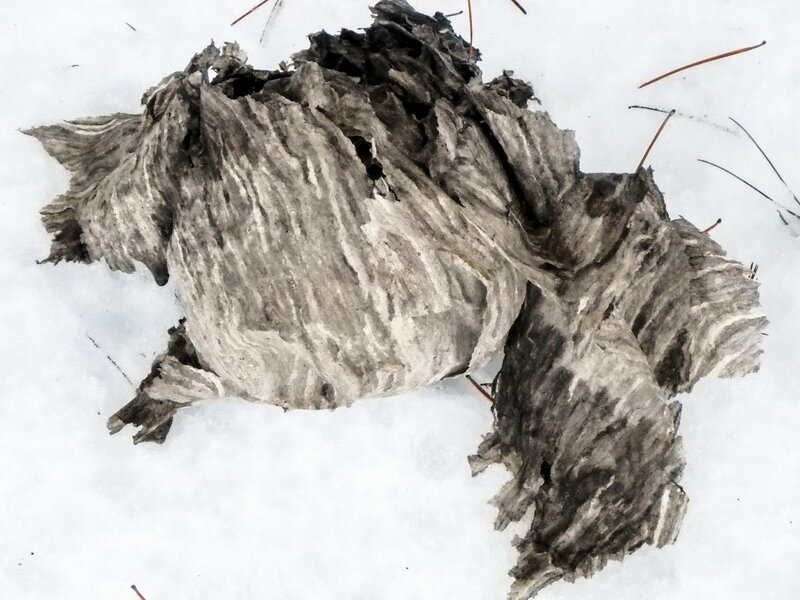 The paper of the hornet’s nest reminded me of natural, undyed wool. They make it by chewing wood into a papery pulp. I’ve been listening to hear if red winged blackbirds have returned but so far there have been no signs of them in the swamp near where I live. 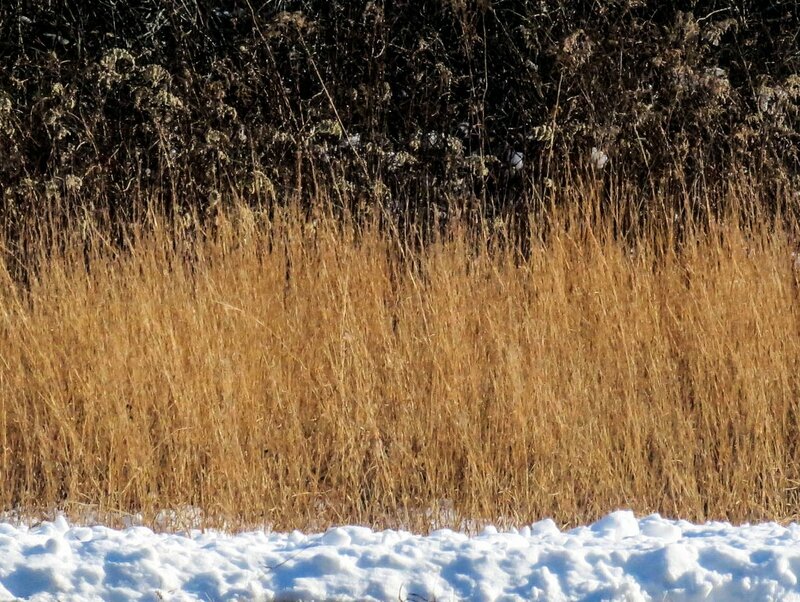 There are plenty of cattails that have gone to seed for the females to line their nests with. This example looked to be soaking wet, but it will dry out. 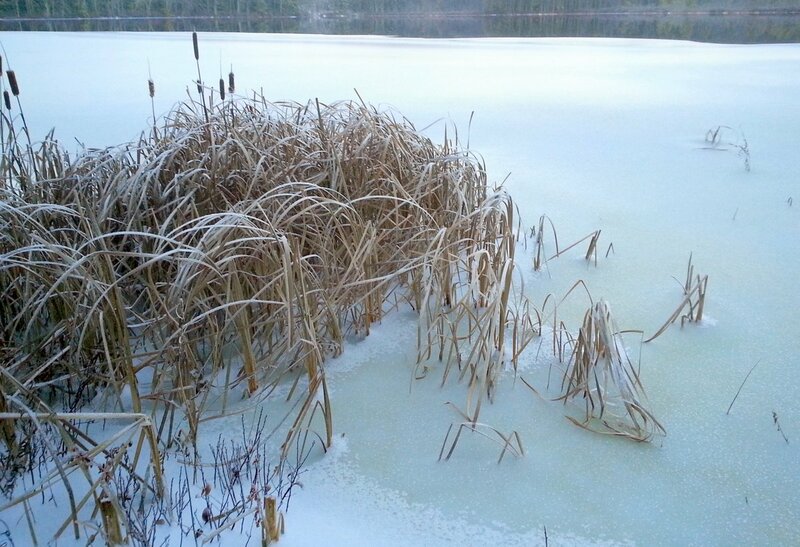 Native Americans used the roots of cattails to make flour and also wove the leaves into matting. 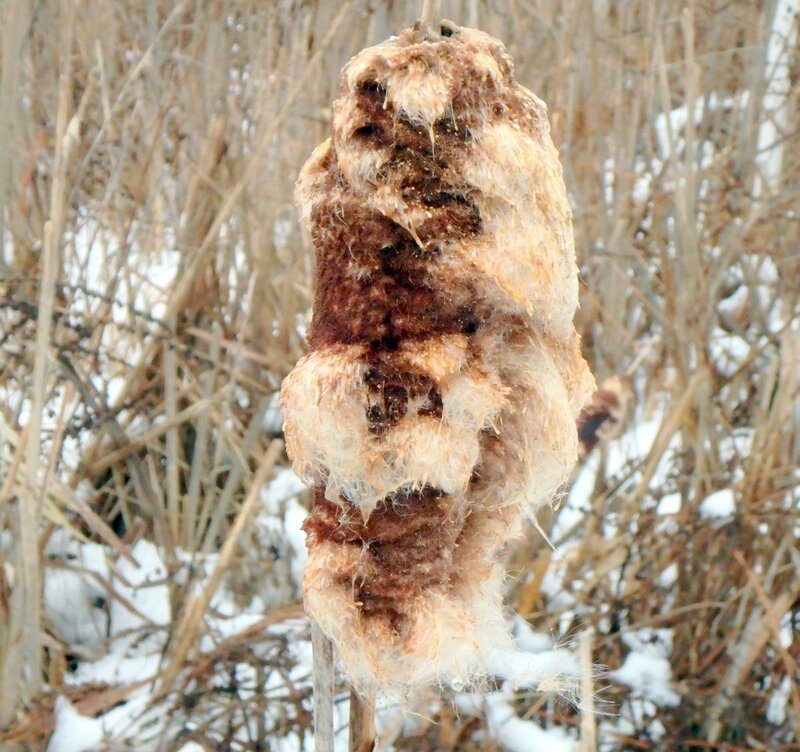 Cattails produce more edible starch per acre than potatoes, rice, taros or yams, and during World War II plans were being made to feed American soldiers with that starch in the form of cattail flour. Studies showed that an acre of cattails would produce an average of 6,475 pounds of flour per year, but thankfully the war ended before the flour making could begin. Beech leaves still provide a flash of color here and there even though many are falling now. Soon their opening buds will be one of the most beautiful things in the forest. Beech was an important tree to Native Americans. 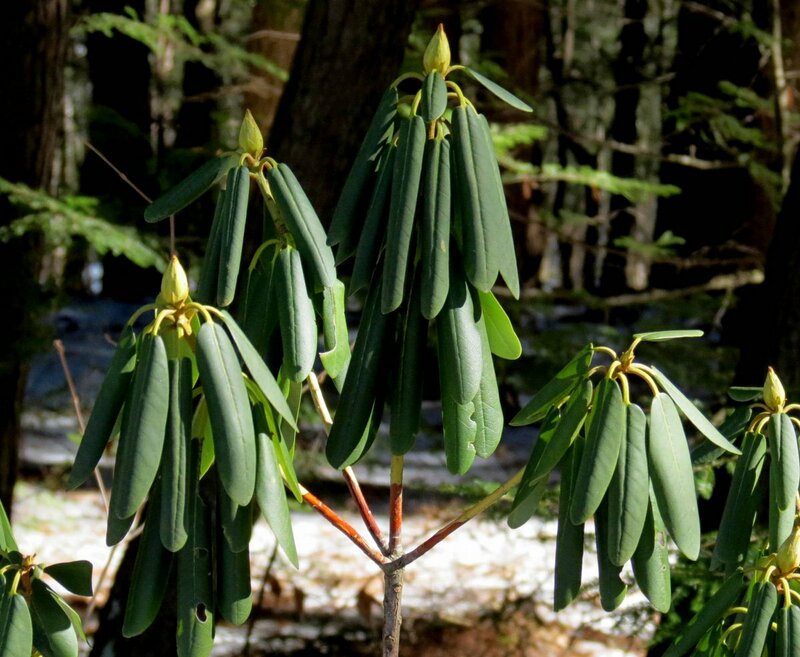 The Iroquois tribe boiled the leaves and used them to heal burns. 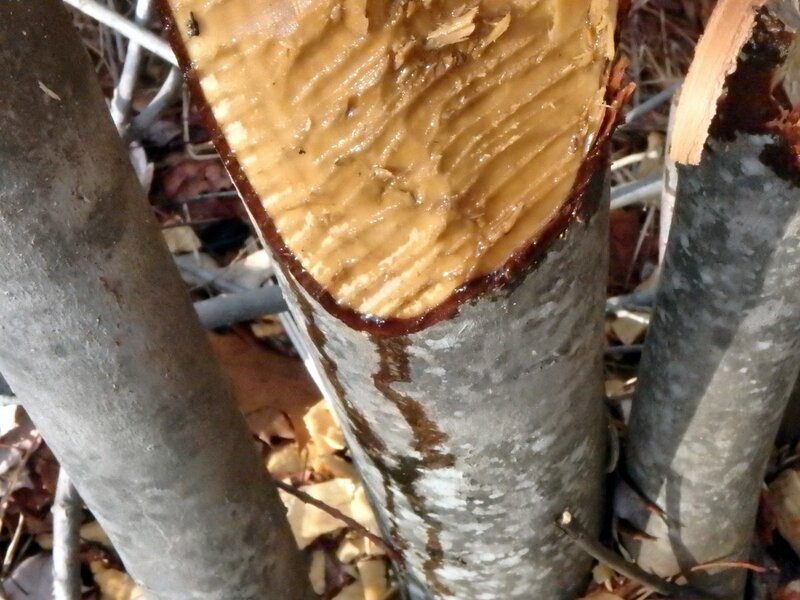 They also mixed the oil from beechnuts with bear grease and used it as a mosquito repellent. Though the nuts are mildly toxic the Chippewa tribe searched for caches of them hidden by chipmunks. The chipmunks gathered and shucked the nuts and saved the people a lot of work. The Chippewa saw that chipmunks never stored bad nuts, and that’s why they searched for their caches. Rather than make flour from the nuts as they did other species, Natives seem to mostly have used beech nuts medicinally. The male speckled alder catkins (Alnus incana) are still opening slowly but I haven’t seen any signs of them releasing their dusty pollen. 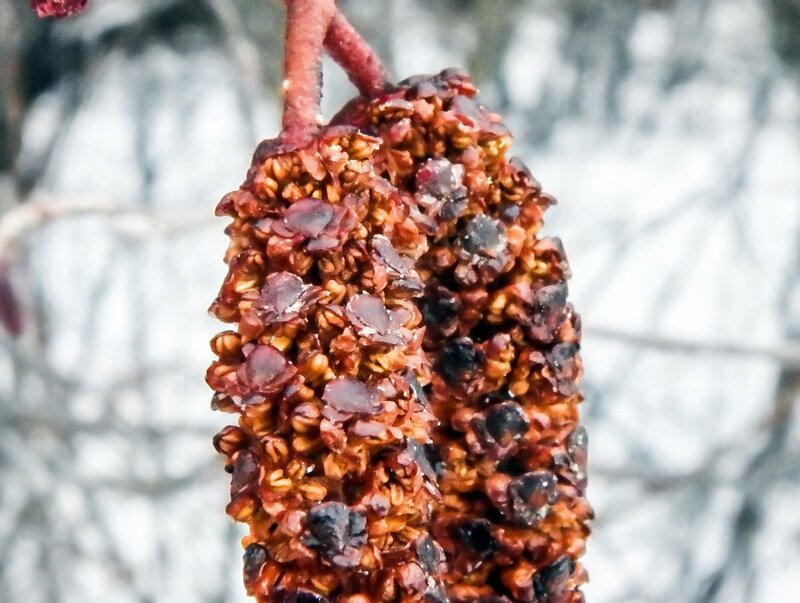 The brown and purple scales on the catkin are on short stalks and there are three flowers beneath each scale, each with a lobed calyx cup and three to five stamens with anthers, which are usually covered in yellow pollen. The flower parts are clearly visible here but there is nothing that looks like pollen. It could be because they were very wet. I finally got a photo of almost fully opened female speckled alder flowers but they’re so small I couldn’t see them when I was taking the photo, so more of them appear in the background than the foreground. The tiny female (pistillate) catkins of speckled alder consist of scales that cover two flowers, each having a pistil and a scarlet style. Since speckled alders are wind pollinated the flowers have no petals because petals would hinder the process and keep male pollen grains from landing on the sticky female flowers. 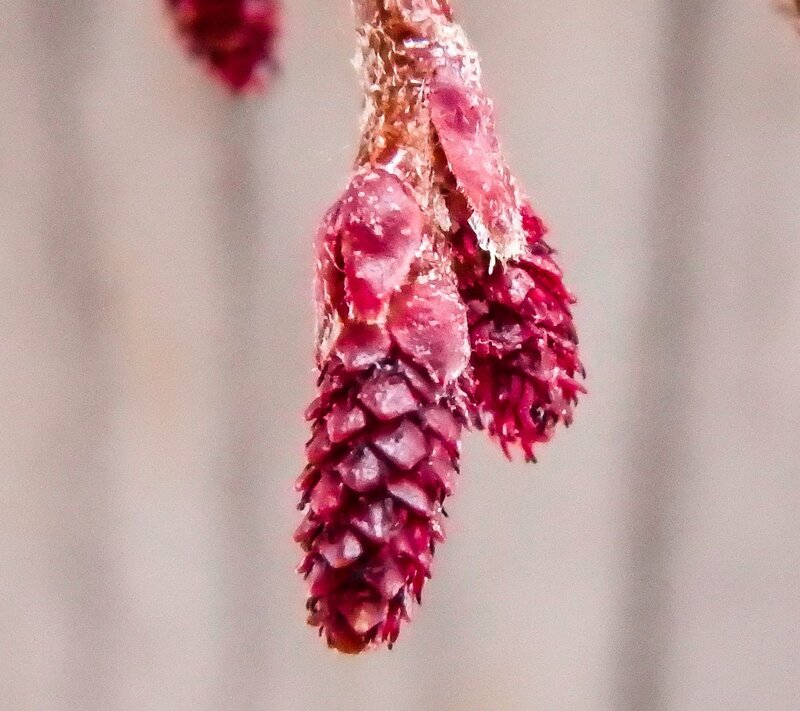 These female catkins will eventually become the cone-like, seed bearing structures (strobiles) that are so noticeable on alders. 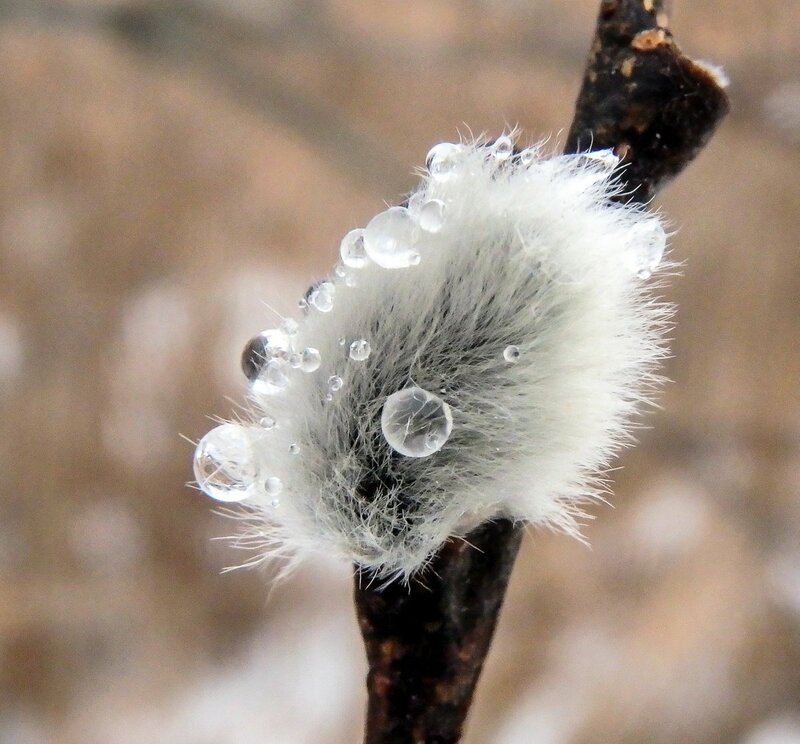 I never knew that willow catkins were so water resistant. I was hoping to see them blooming with their yellow flowers but like the elms, they’re waiting for warmth. This week is warmer but with lots of rain. If we ever have a day with both sunshine and warmth I think I might just fall over. 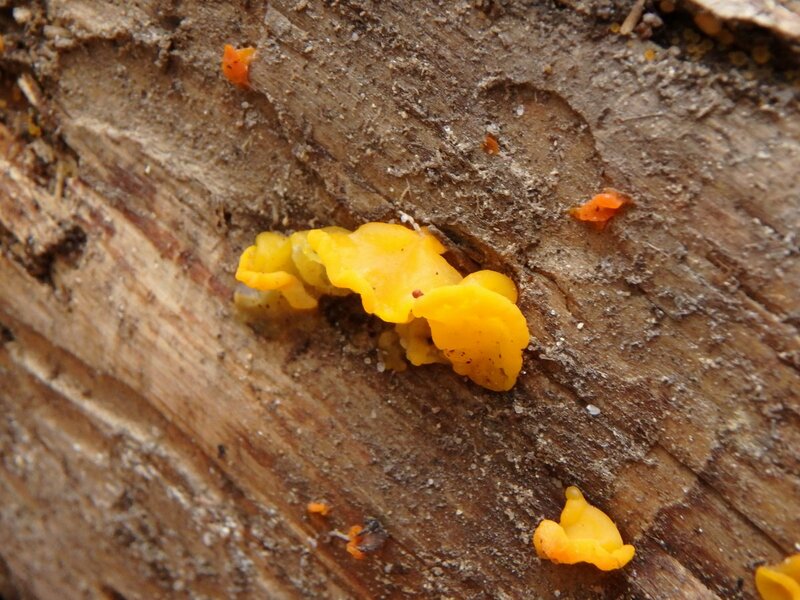 Amber jelly fungus (Exidia recisa) is common and I find it on oak and poplar limbs. 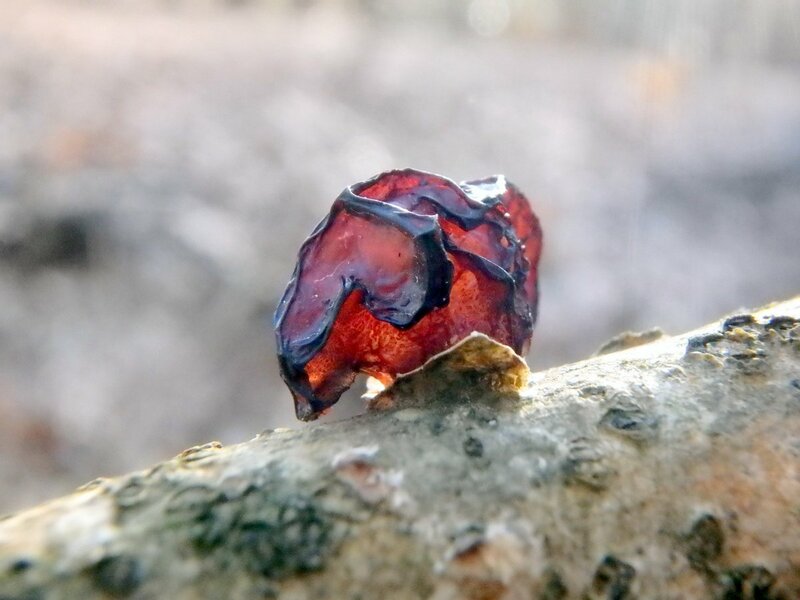 They have the color of jellied cranberry sauce and the best time to look for them is after it rains or snows, because they can absorb great amounts of water and grow several times bigger than they are when dry. 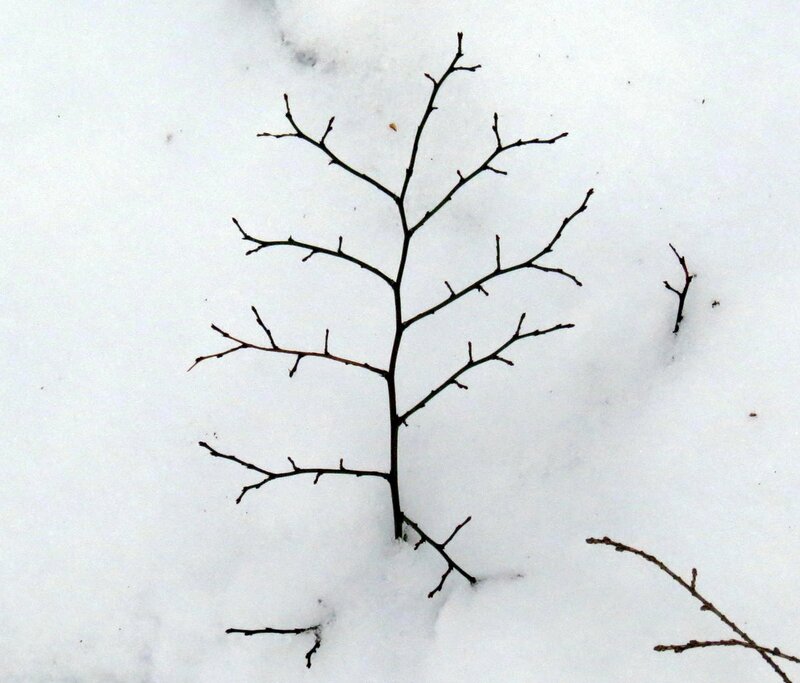 I often find them on branches that have fallen on top of the snow as the oak branch pictured had. 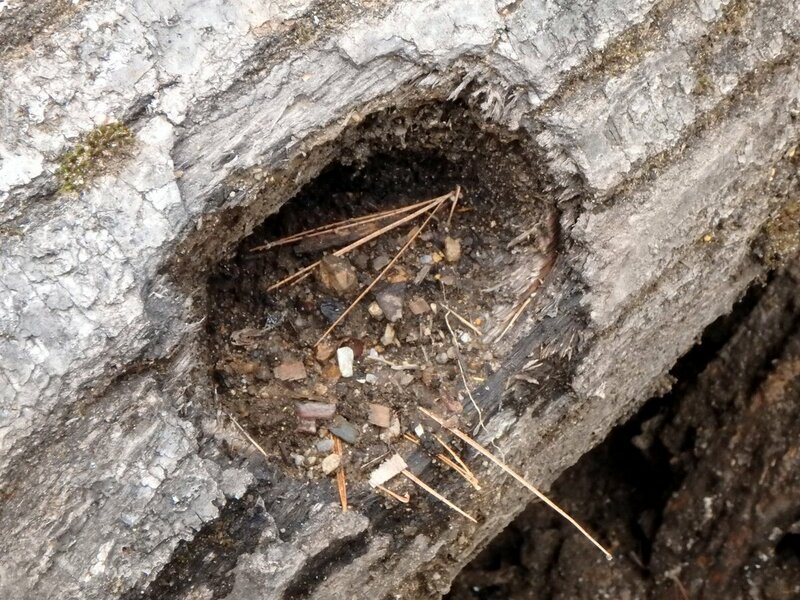 I’ve known that the perfectly round holes I see in pine logs were made by some type of borer but I have never seen the insect, though I’ve even looked into the holes with a flashlight. These chip marks made by a woodpecker most likely explain why. 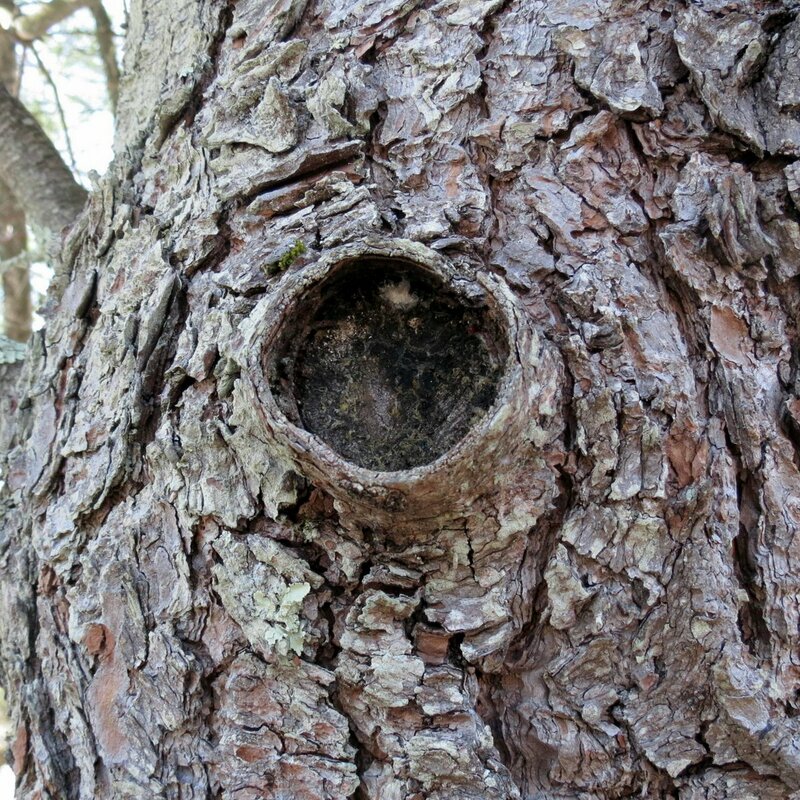 A branch collar forms where a branch meets the trunk of a tree, and often appears as a bulge at the base of the branch. It is made up of interlocking layers of cells of the branch and the trunk which will grow to help seal off wounds when branches are broken or cut off. This white pine (Pinus strobus) had a completely intact branch collar on it, which is something I’ve never seen. I can’t imagine what happened to the branch. Pines lose branches regularly but they usually break off and leave a stub on the trunk. 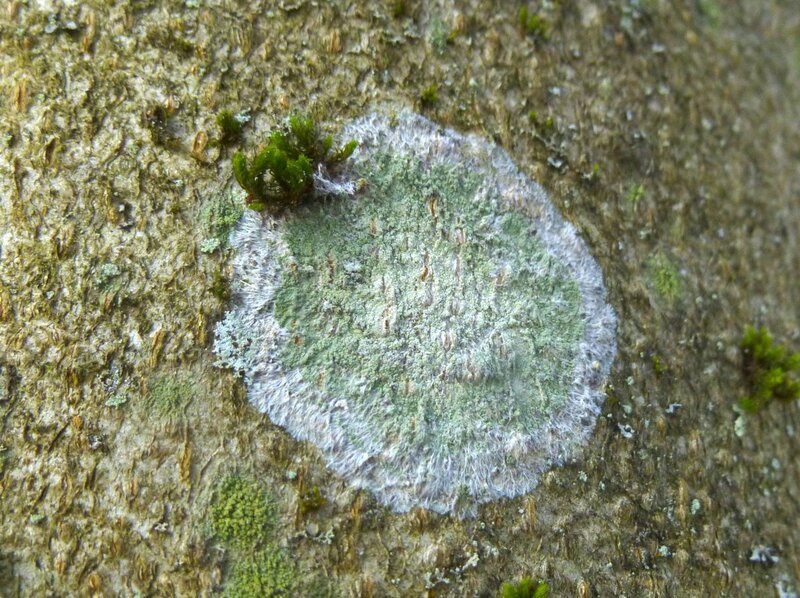 I’ve never seen a bicolored lichen before but here is one. It was very small but I thought I saw a smudge of color on it and sure enough the photo shows a bit of lavender in its upper half. I don’t think I ever come away from studying lichens without being surprised by their variability. I didn’t bother trying to find this one’s name; I just admired it. I lost myself in the beauty of these fir needles for a time. Though I know they’re fir (Abies) I’m not sure which species. I think it might be a Canaan fir, which is said to display the characteristics of both Fraser and balsam firs. 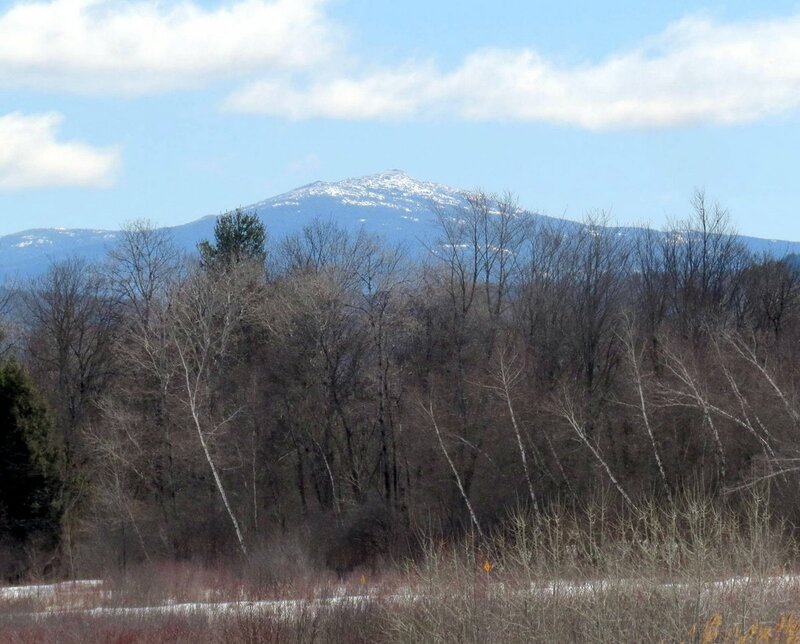 I’ve been waiting all winter to get a shot of Mount Monadnock with snow on it and after a few wasted trips to Perkins Pond in Troy I finally got one. 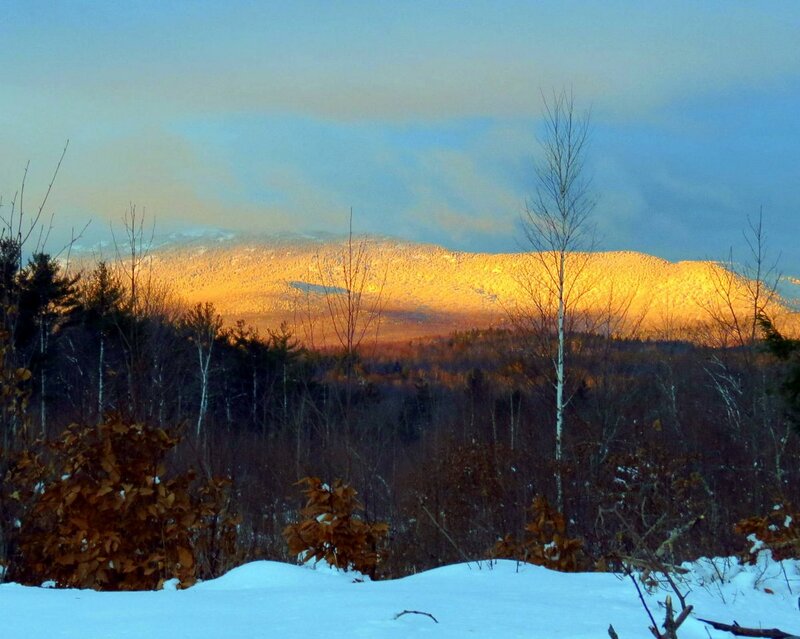 I think the mountain is at its most beautiful with a snowy cap, especially when seen from Keene in this view that I grew up with. How lucky I was to grow up being able to see every day something that people from all over the world come to see. Since I often tell readers of this blog that they don’t even have to leave their yards to enjoy nature I like to practice what I preach every now and then and restrict my wandering to my own yard. This time I found that the birds had eaten every crabapple from my tree except one. Things like this always make me wonder what it is about that one crabapple that turned them away. It also makes me wonder how they knew that it was different from all the others. 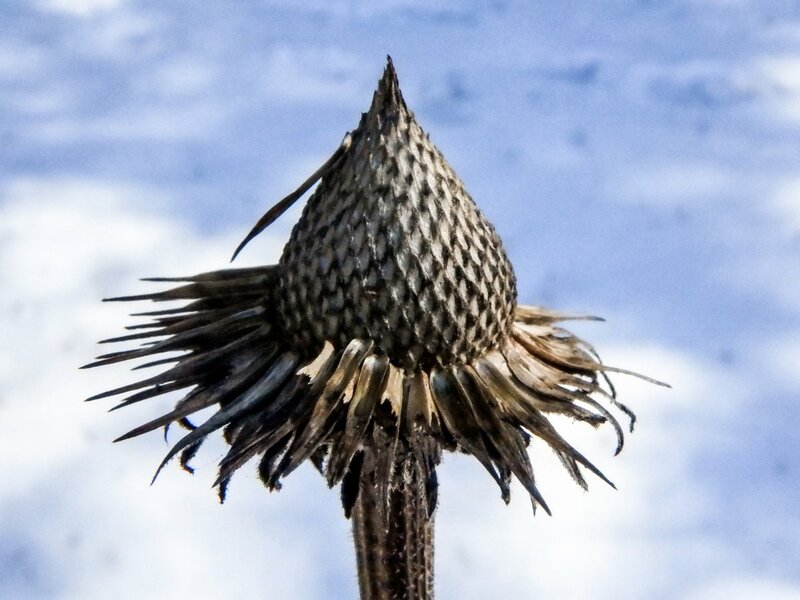 The seed eaters haven’t touched the black-eyed Susan seeds (Rudbeckia hirta). That’s odd because the birds planted them; one year a few plants appeared and I just left them where they grew. 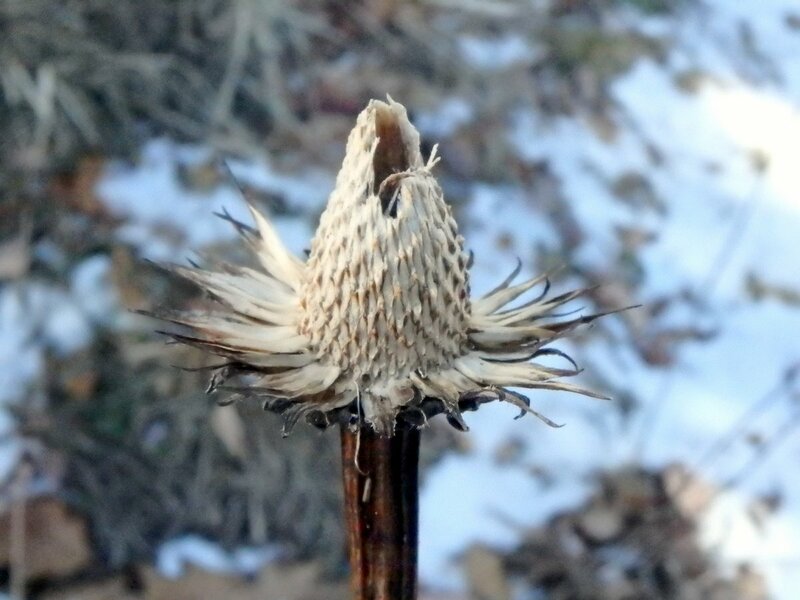 The birds seem to have gone for the coneflowers (Echinacea purpurea) first, as just about every seed head has been at least partially stripped. I planted one plant years ago but now there are several scattered here and there in the yard and like the black eyed Susans I let them grow where the birds have planted them. If that makes my gardening abilities seem lax, so be it. The last thing I wanted to do after gardening professionally for 10-12 hours each day was to come home and spend more time gardening, so the plants in this yard had to be tough enough to take care of themselves. I simply didn’t have the time or the inclination to fuss over them, and still don’t. The plants in this yard also have to be able to withstand a certain amount of shade, because they’re surrounded by forest. 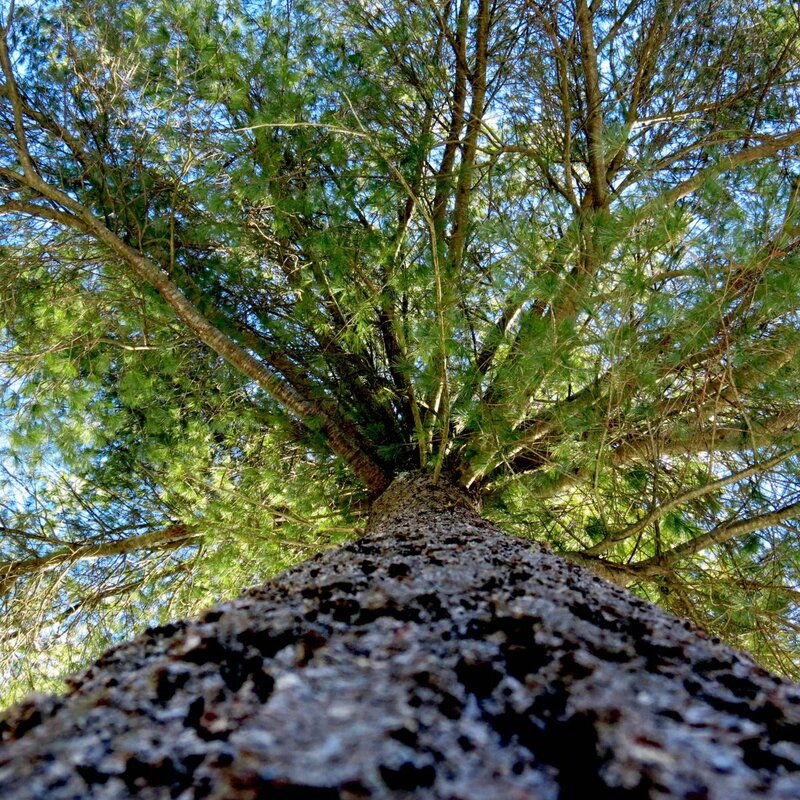 Eastern hemlocks (Tsuga canadensis) are numerous and so are white pines (Pinus strobus) and both soar into the sky on three sides of the property. Black capped chickadees flock here to eat the seeds from the hemlock cones like the one pictured above. 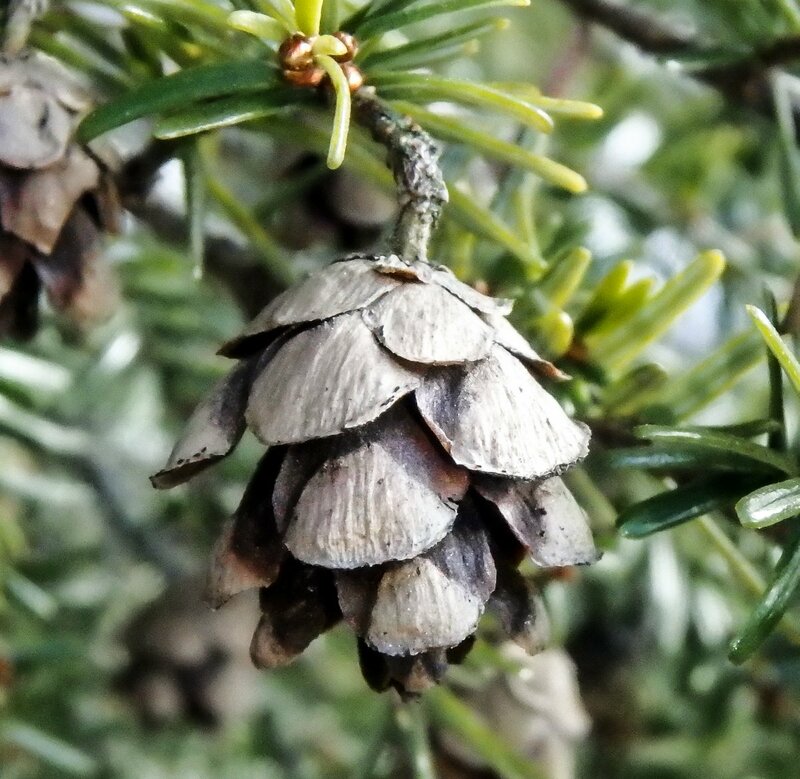 The 1/2 inch long eastern hemlock cones are among the smallest of all the trees in the pine family but the trees usually produce so many of them that the ground is completely covered in the spring. 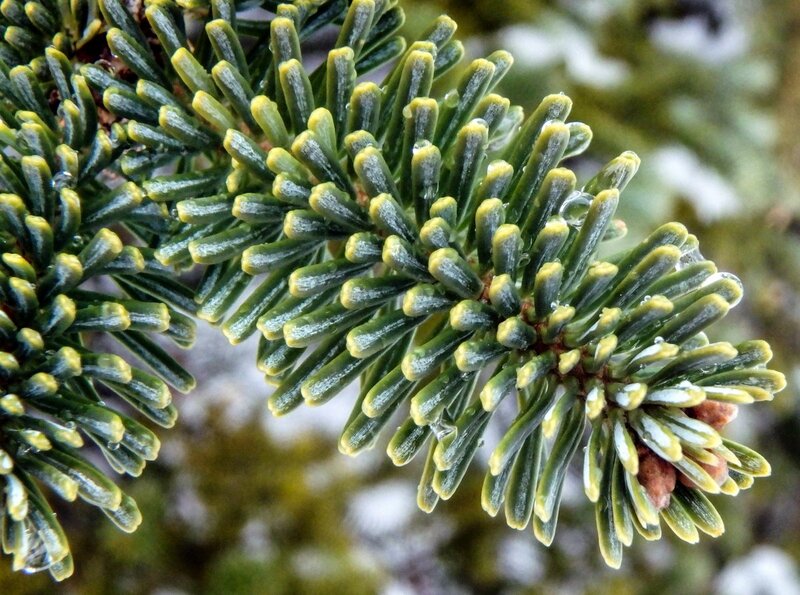 The needles and twigs of hemlocks are ground and distilled and the oil is used in ointments. 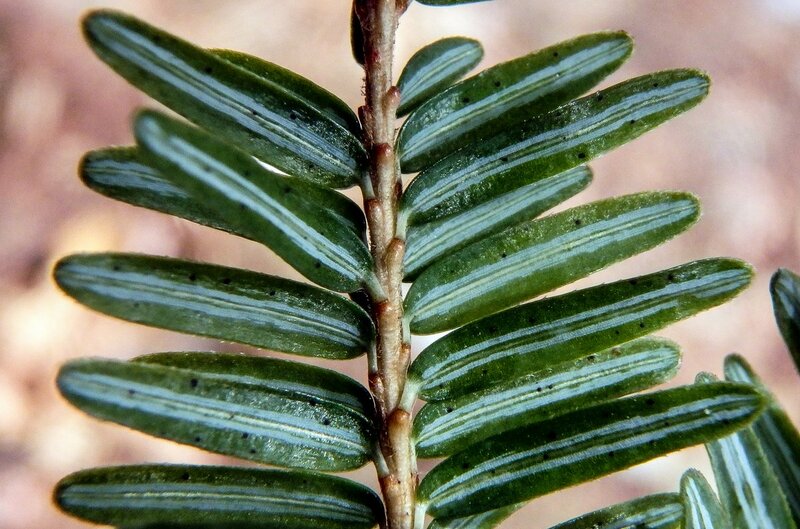 The white stripes on the undersides of the flat hemlock needles come from four rows of breathing pores (stomata) which are far too small to be seen without extreme magnification. The stripes make the tree very easy to identify. 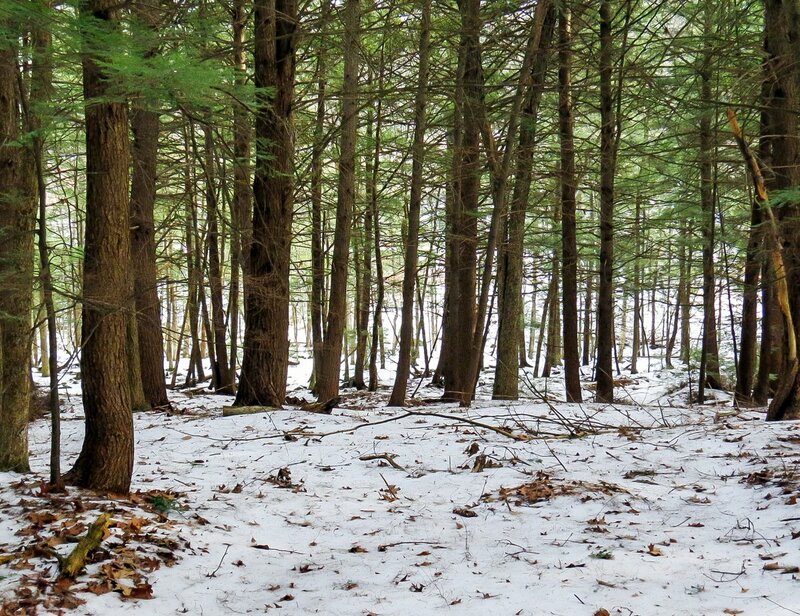 This view of the forest just outside of my yard shows what messy trees hemlocks are, but it is a forest so I don’t worry about it. It’s too bad that so many are afraid to go into the forest; I grew up in the woods and they have kept me completely fascinated for over a half century. There are dangers there yes, but so can cities be dangerous. Personally I’d sooner take my chances in a forest than a city. I found that an American hazelnut had decided to grow on the property line between my neighbor’s yard and mine and I was happy to see it. Now I can practice getting photos of the tiny scarlet, thread like female blossoms that appear in spring. For now though the male catkins will have to do. As I was admiring them I saw a black something clinging to one of them. 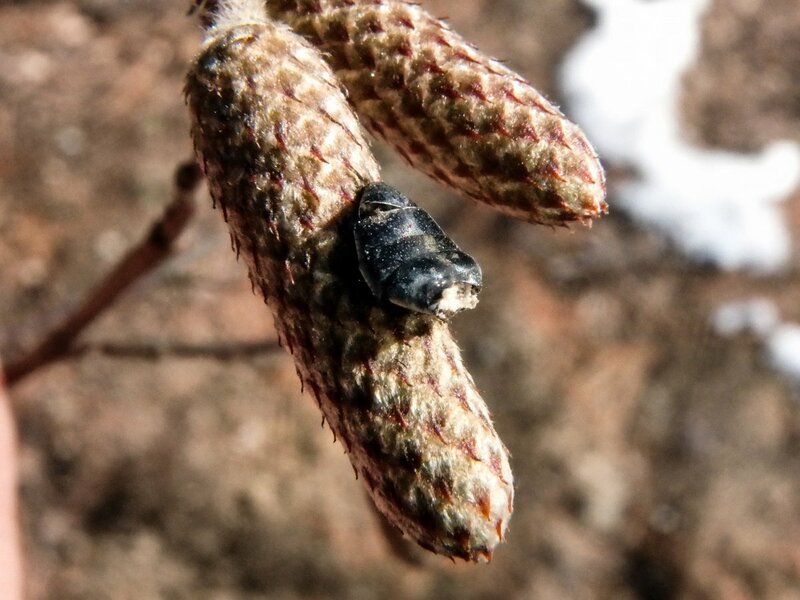 I thought the black thing on the hazel catkin was an insect of some kind but it appears to be just part of an insect. I can’t imagine where the other half went. Maybe a bird ate it? I looked up insects that are partial to hazelnuts but none of them had parts that looked like this. 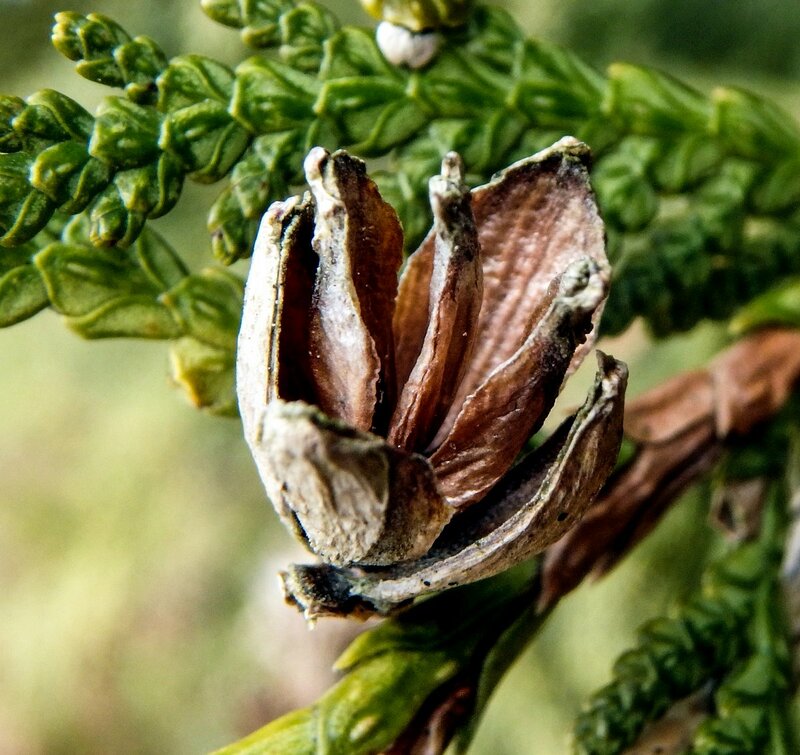 The color blue appears in some surprising places in nature, and one of the most surprising is on the egg shaped female flower tips of the northern white cedar (Thuja occidentalis.) There were three examples of this native tree in the yard when I moved here and I’ve watched them grow big enough to provide welcome shade from the hot summer sun over the years. The Native American Ojibwe tribe thought the trees were sacred because of their many uses, and maybe they were. They showed 16th century French explorer Jacques Cartier how to cure scurvy with its leaves and he was so impressed that he named it Arborvitae, which is Latin for Tree of Life. 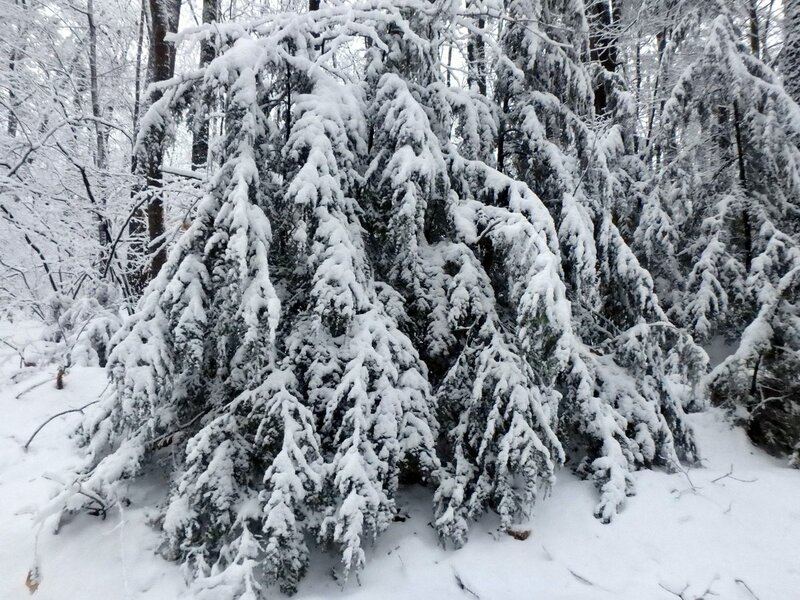 He had trees with him when he returned to Europe, and that’s how Thuja occidentalis became the first North American tree to be introduced there. 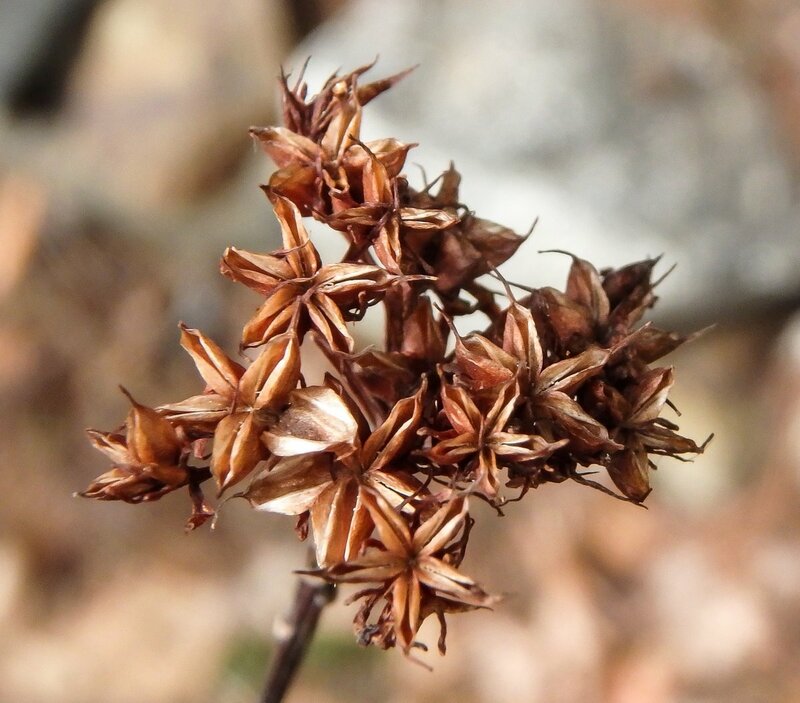 There are many seed pods on the cedars and robins, common redpolls, pine siskins, and dark-eyed juncos eat the seeds. Many small birds use the trees to hide in and robins nest in them each spring. 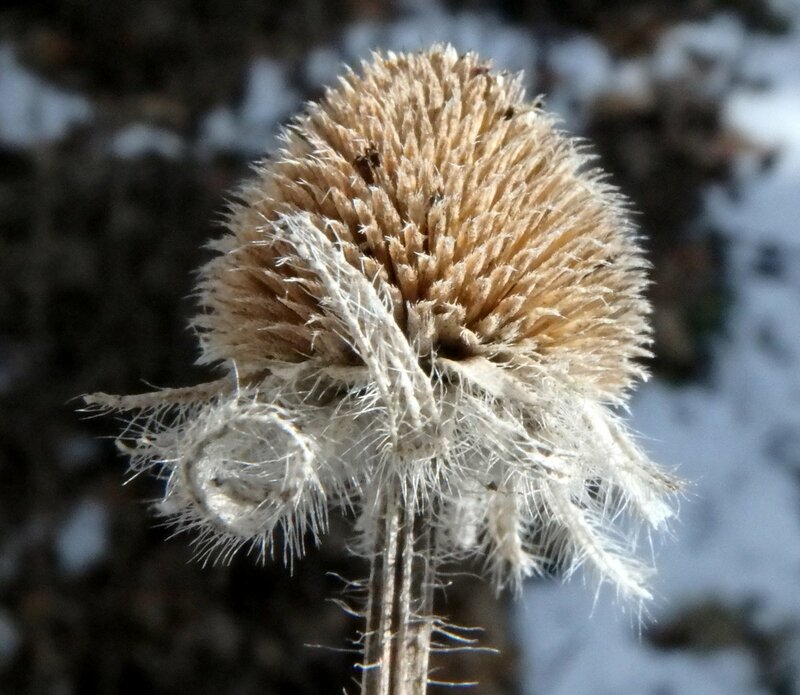 The open seed pods always look like beautiful carved wooden flowers to me. When the rhododendron buds look like they’re wearing choir robes you know that they’re singing Baby It’s Cold Outside, and it was cold on this day but at least the sun was shining. That hasn’t happened that much on weekends lately. These rhododendrons were grown from seed and started their life in this yard as a small sprig of a plant. Now some are taller than I am. 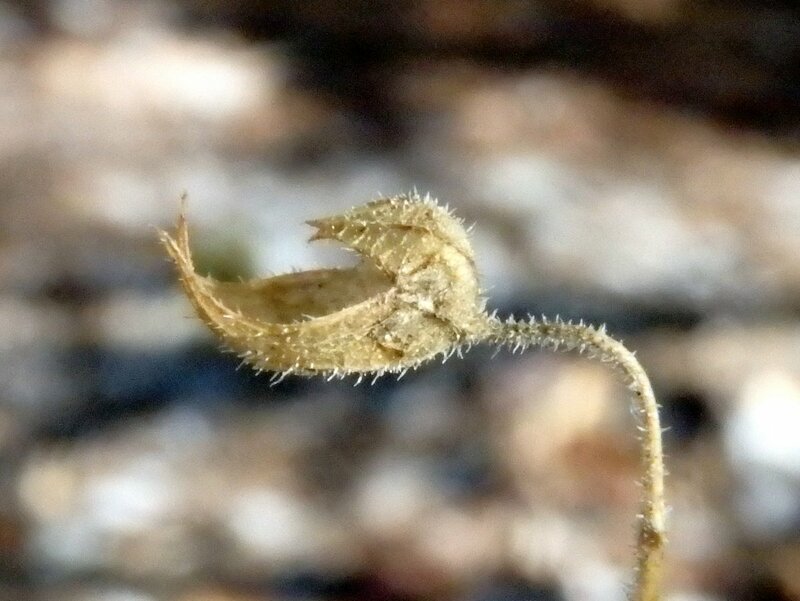 It is thought that their leaves curl and droop in this way to protect their tender undersides from the cold. I built a stone wall in my yard years ago and, since I collected rocks and minerals for a time, many of the stones in the wall have surprises in them. This one is studded with quartz crystals. 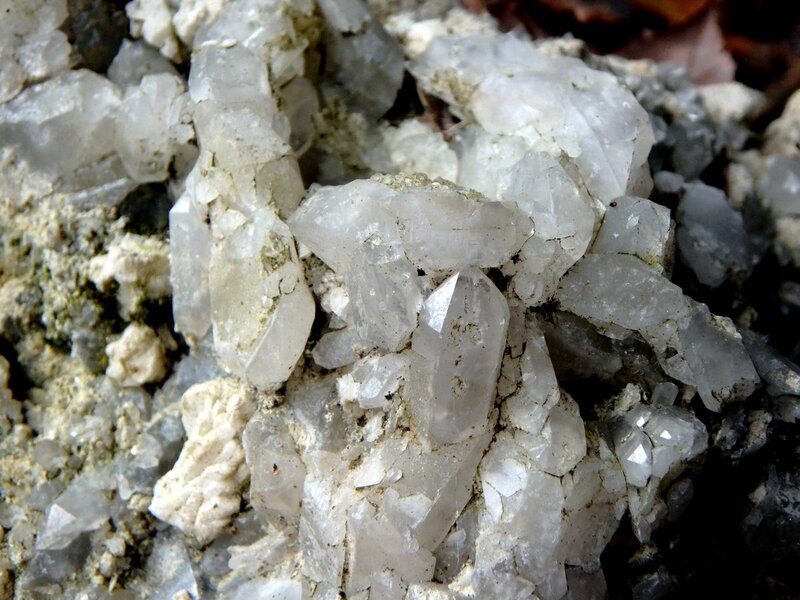 Others have beryl crystals, mica, tourmaline and other minerals in them. 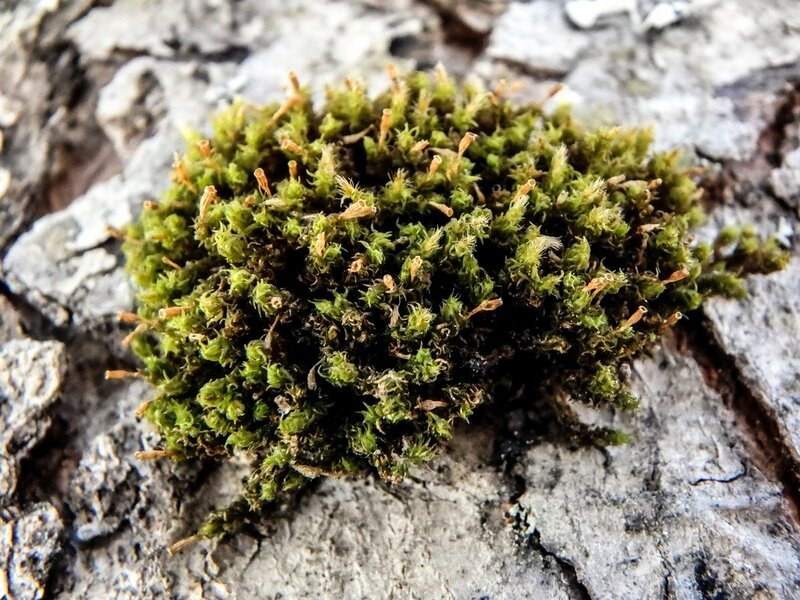 It took several years before I could confidently identify the tiny tufts of moss I sometimes saw growing on tree trunks but I eventually found out that its name was crispy tuft moss (Ulota crispa.) Now I see it everywhere, including on the maple trees in my own yard. This one was less than an inch across. 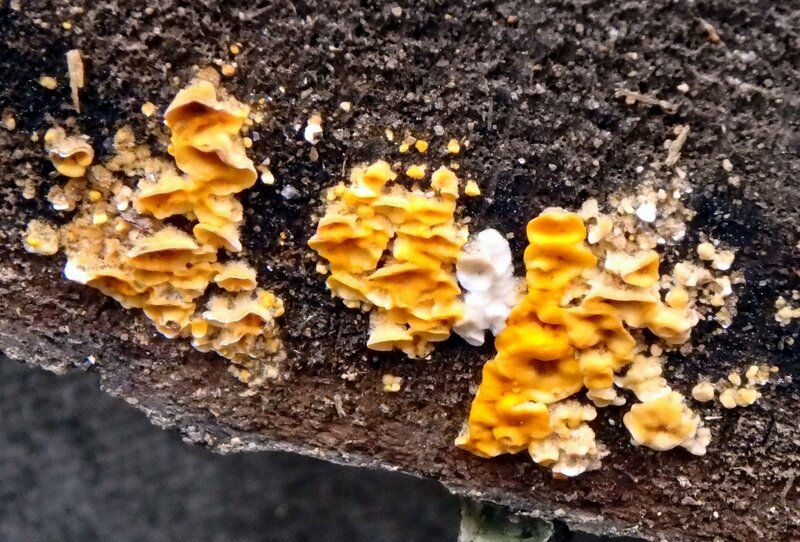 I was happy to find a tiny bit of bright yellow fringed candle flame lichen (Candelaria fibrosa) on one of my maple trees. Lichens simply use tree bark as a roosting place and don’t harm the tree in any way. This lichen is said to be very sensitive to air pollution, so seeing it is a good sign that our air quality is good. I hope it grows and spreads to other trees. As of now it’s the most colorful lichen in the yard. I found an oak twig in the yard that had fallen from a neighbor’s oak tree. 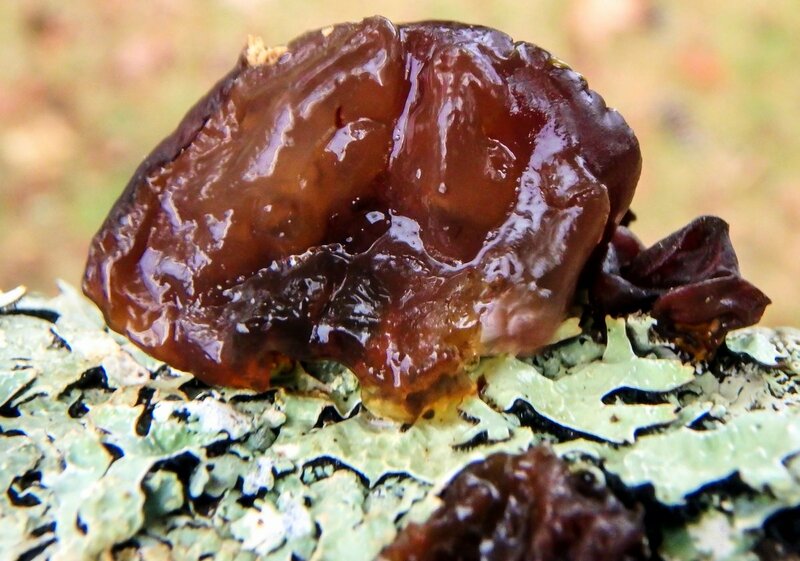 I saw that it had tiny, hard flakes of amber jelly fungus (Exidia recisa) on it. Luckily though this is a wood rotting fungus it only grows on dead wood so it won’t hurt the tree. Since the twig was barely bigger than a pencil I decided to try an expiriment and brought it inside. This is what the hard little flakes in the previous photo turned into after I soaked the twig in a pan of water for just 15 minutes. What were small hard lumps had swollen to I’d guess about 40-50 percent larger than their original dry size, and instead of being hard now felt much like your earlobe. In fact they looked and behaved much like the cranberry jelly served at Thanksgiving. 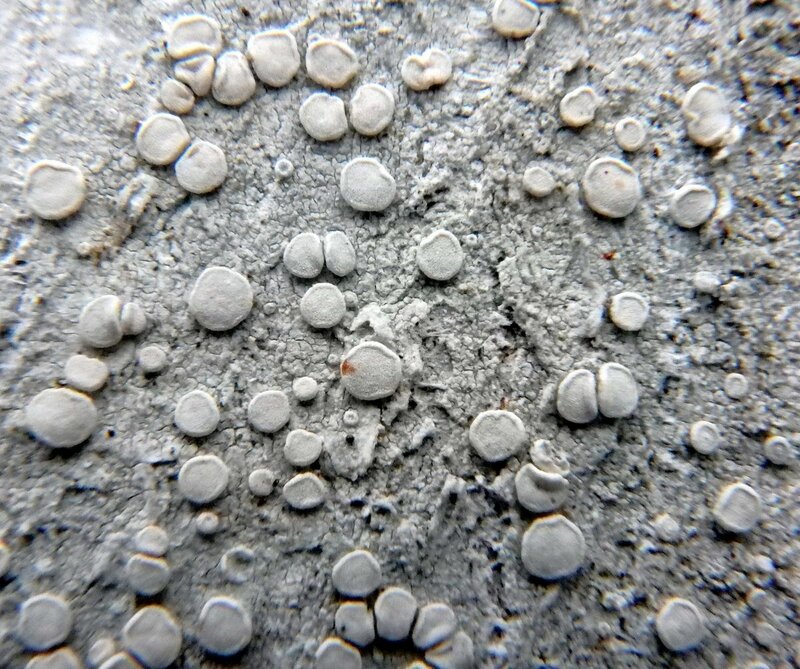 These fungi have a shiny surface and a matte surface, and the shiny side is where their microscopic spores are produced. I found another twig, this time from a black cherry (Prunus serotina.) 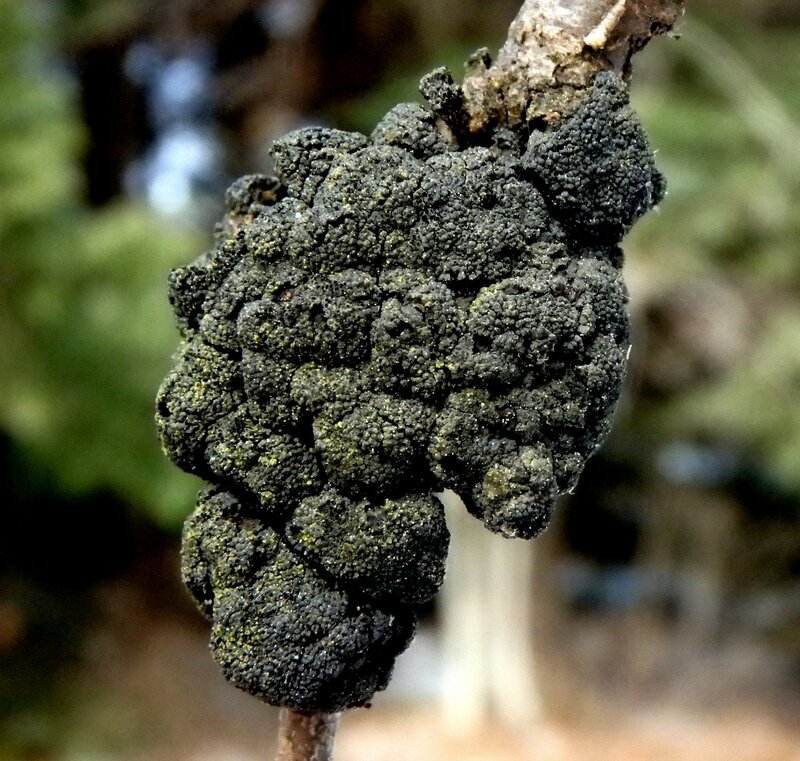 It showed that the tree had black knot disease, which is caused by the fungus Apiosporina morbosa, which can also attack plums, peaches, and apricots. 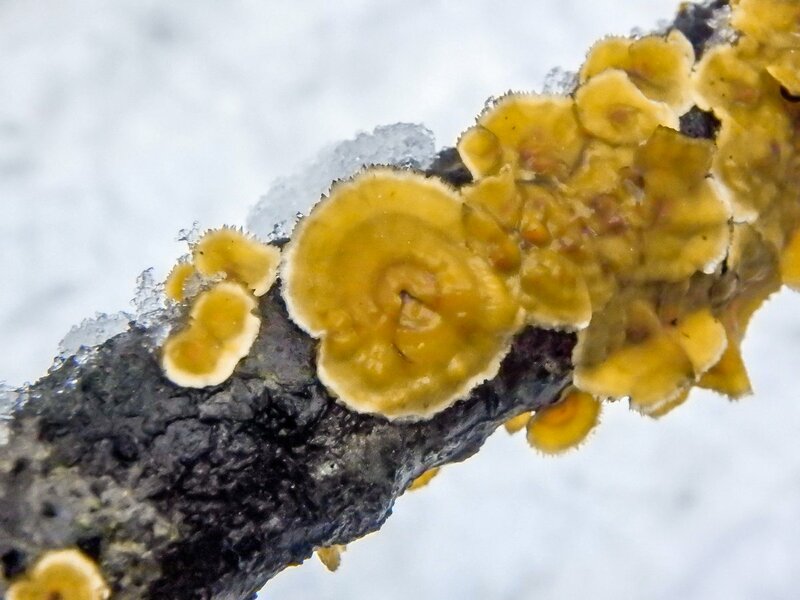 Spores from the fungus can be spread by rain or wind and typically infect trees from April through June on new growth. 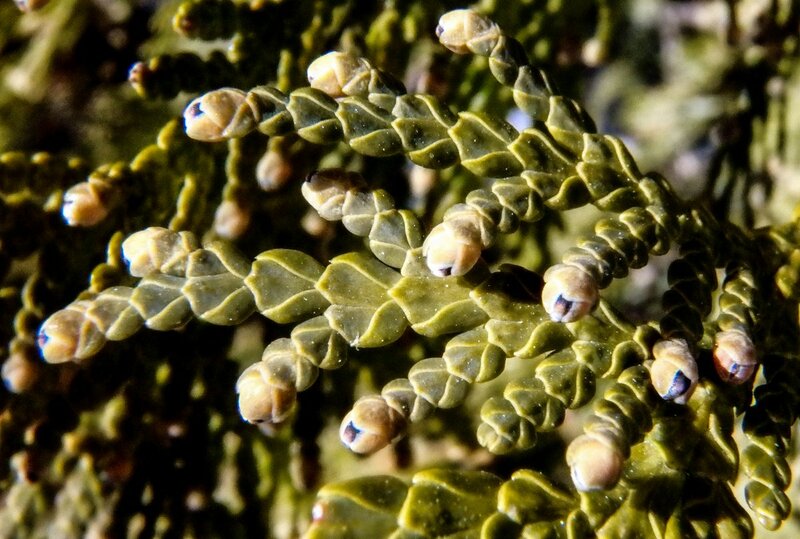 Infected stems swell up and produce hard black knots like those in the above photo. 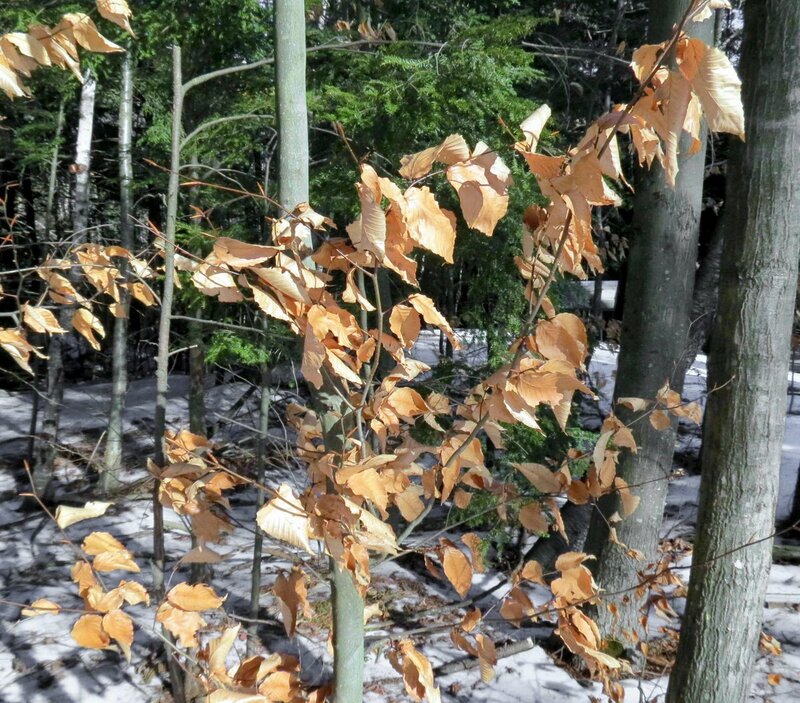 This disease can eventually kill the tree so infected limbs should be pruned off 2-4 inches below the knots and buried or burned before bud break the following spring. Since this tree is a fully grown black cherry and lives in the forest there is little that can be done for it. I don’t know if any birds eat the seeds of the Russian stonecrop (Sedum kamtschaticum) in my yard but I always let them go to seed because the shape of the open seedpods mimics exactly the shape of their bright yellow flowers. It spreads but couldn’t be called invasive. It is a tough little groundcover that can stand drought or flood. I haven’t done a thing to it since I planted it about 30 years ago. The tallest and straightest tree in my yard is a white pine (Pinus strobus.) I put my camera on its trunk and clicked the shutter, and this is the result. It doesn’t show much except that it was a sunny day and they have been rare here lately. 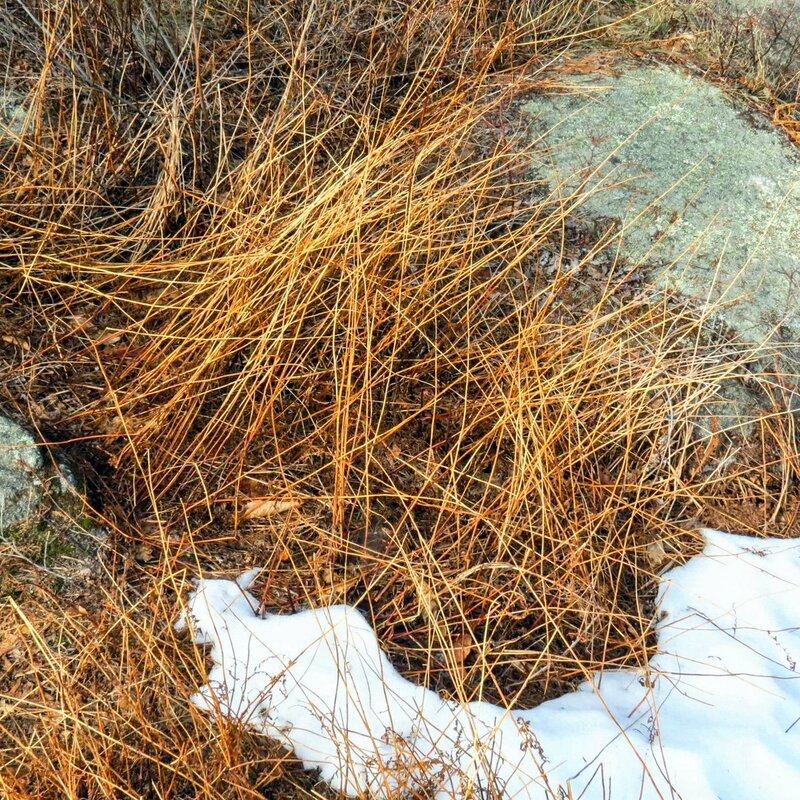 White pine needles contain five times the amount of the vitamin C of lemons and were used by Native Americans to make tea. This knowledge saved many early settlers who were dying of scurvy, but instead of using the tree for food and medicine as the Natives did the colonists cut them down and used the wood for paneling, floors and furniture. When square riggers roamed the seas the tallest white pines in the Thirteen Colonies were known as mast pines. They were marked with a broad arrow and were reserved for the Royal Navy, and if you had any sense you didn’t get caught cutting one down. This practice of The King taking the best trees led to the Pine Tree Riot in 1772, which was an open act of rebellion. Colonists cut down and hauled off many marked mast pines in what was just a taste of what would come later on in the American Revolution. I think this tree, so tall and straight, would surely have been selected as a mast pine. The plan was to get out early last Saturday and hike a rail trail since I skipped it last week in favor of a pond, but nature had other plans. 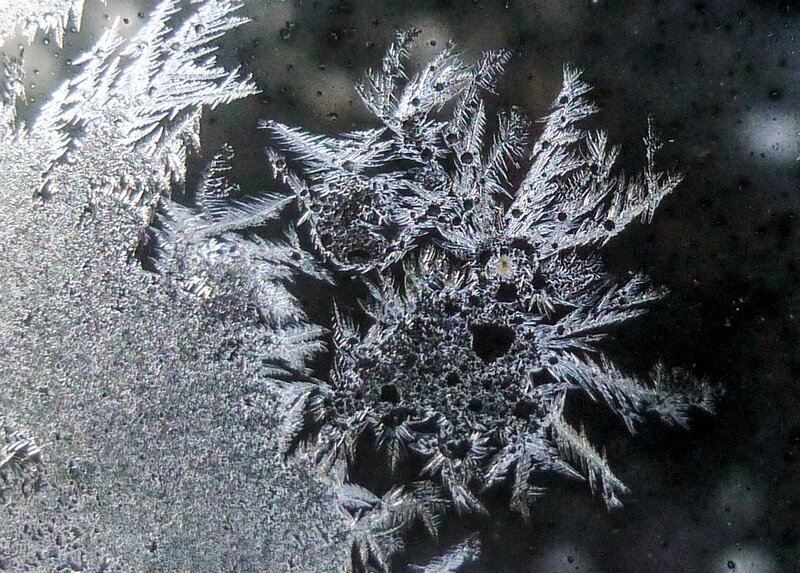 We got about 5 inches of snow on Friday and the temperature at 7:00 am on Saturday was barely 17 degrees F. I thought I’d wait for the sun to warm it up a bit and took photos of frost crystals while I waited. They were very feathery. Eventually I did get out there and found a beautiful warm and sunny day. Warm was 35 degrees but since last February saw below zero temperatures nearly all month long 35 degrees seemed like a gift. 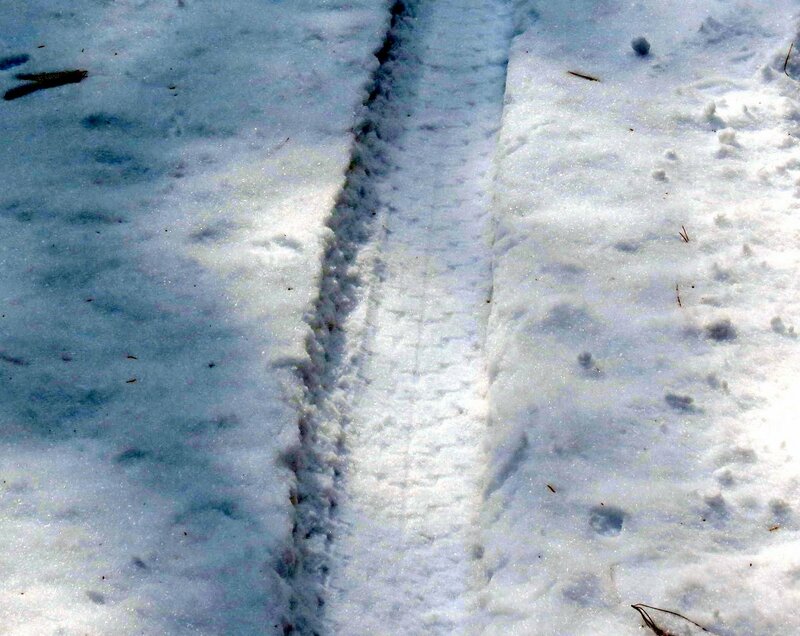 I saw that a bike with balloon tires had gone through the snow. I’ve heard that the tires on them are underinflated, and that these bikes can go just about anywhere. It seems as if it has taken a good part of my lifetime for bikes to get back to where they were when I was a boy. I can remember them with fat balloon tires that always seemed to be underinflated back then, but we just rode them on the streets. Poison ivy (Toxicodendron radicans) can grow as a shrub or a vine. 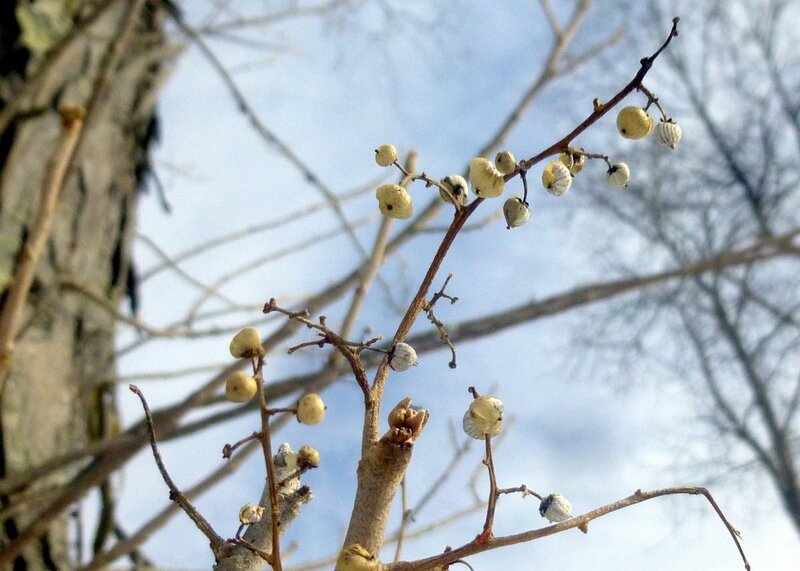 In this case it grew as a vine on a tree trunk and its white berries gave away its identity, even in winter. I’m glad I saw the berries before I touched the tree trunk. You can catch a good case of poison ivy rash even when the plants have no leaves on them and as general rule I try not to touch plants with white berries. Poison ivy hasn’t ever bothered me much but there is always a first time. Some people get it so badly they have to be hospitalized. Over 60 species of birds are known to eat poison ivy berries, so the toxic part of the plant must have no effect on them. A gall wasp made a perfectly round escape hole in its near perfectly spherical oak gall. It is said that oaks carry more galls than any other tree. 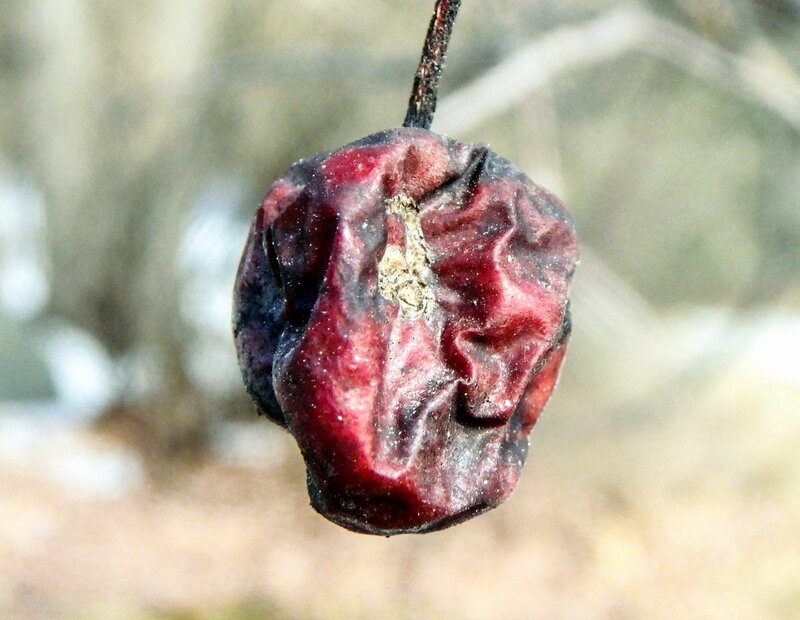 This example is a marble gall. White pines (Pinus strobus) have shown me that I can use their sap as a kind of thermometer in the winter because the colder it gets, the bluer it becomes. This example was sort of a medium blue which kind of parallels our almost cold winter. I’ll have to look at some if the temperature plunges next weekend as forecast. 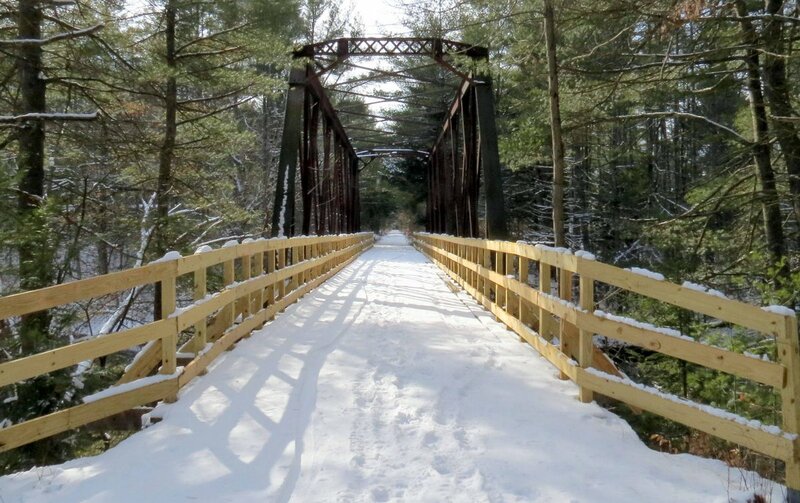 Snowmobile clubs have built wooden guardrails along the sides of all of the train trestles in the area to make sure that nobody goes over the side and into the river. 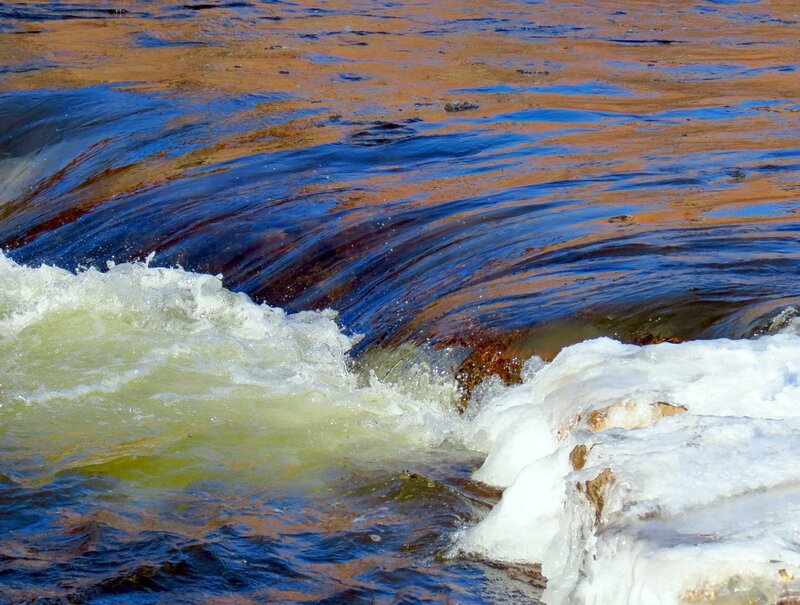 That wouldn’t be good, especially if there was ice on the river. 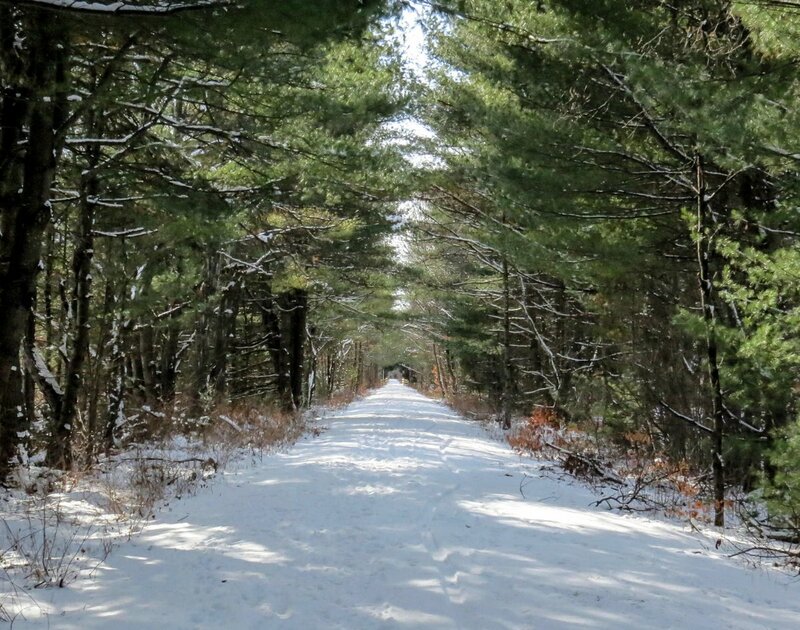 Snowmobile clubs work very hard to maintain these trails and all of us who use them owe them a great debt of gratitude, because without their hard work the trails would most likely be overgrown and impassable. I know part of one trail that hasn’t seen any maintenance and it’s like a jungle, so I hope you’ll consider making a small donation to your local club as a thank you. Years ago before air brakes came along, brakemen had to climb to the top of moving boxcars to manually set each car’s brakes. The job of brakeman was considered one of the most dangerous in the railroad industry because many died from being knocked from the train when it entered a trestle or tunnel. This led to the invention seen in the above photo, called a “tell-tale.” Soft wires about the diameter of a pencil hung from a cross brace, so when the brakeman on top of the train was hit by the wires he knew that he had only seconds to duck down to avoid running into the top of a tunnel, trestle, or other obstruction. Getting hit by the wires at even 10 miles per hour must have hurt some, but I’m sure it was better than the alternative. 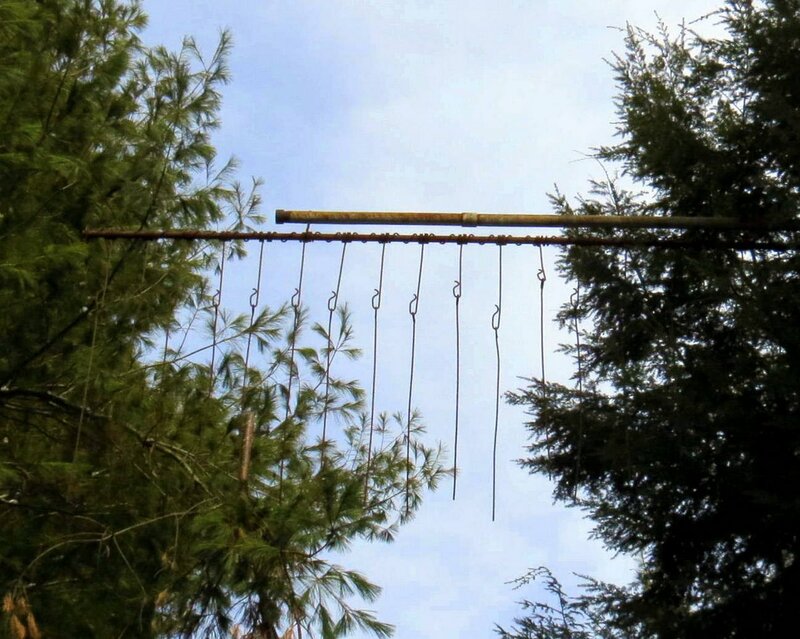 I’ve spent over 50 years wondering what these wires were called and was able to find out just recently. I also discovered that though tell-tales were once seen on each side of every trestle and tunnel, today they are rarely seen. The above photo shows the only example I know of and I chose to walk this particular section of rail trail because of it. 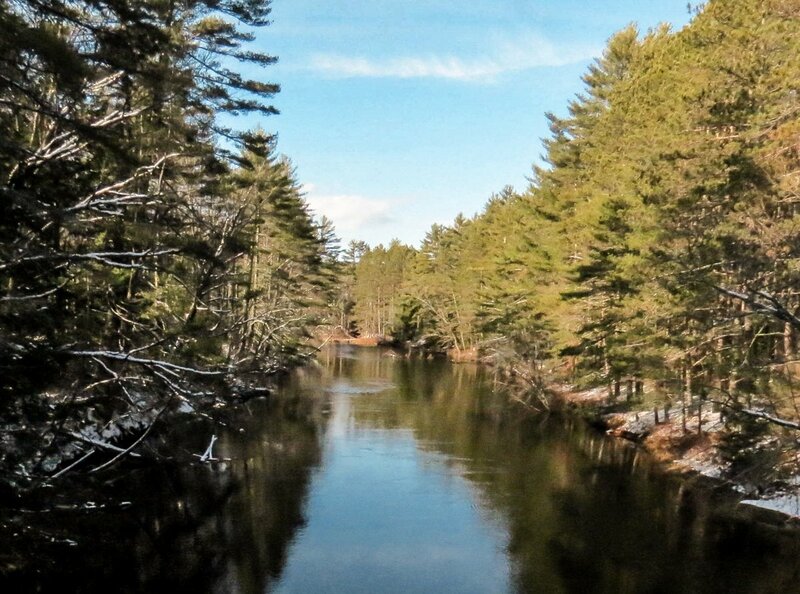 There is a nice view of the Ashuelot River from the trestle. It’s very placid here but its banks seem wild and untamed, and it’s easy to imagine that this is what it looked like before colonists came here. Though there is surface rust on the ironwork of the trestle they were built to last and I wouldn’t be surprised if it looks the same as it does now after standing for another 150 years. 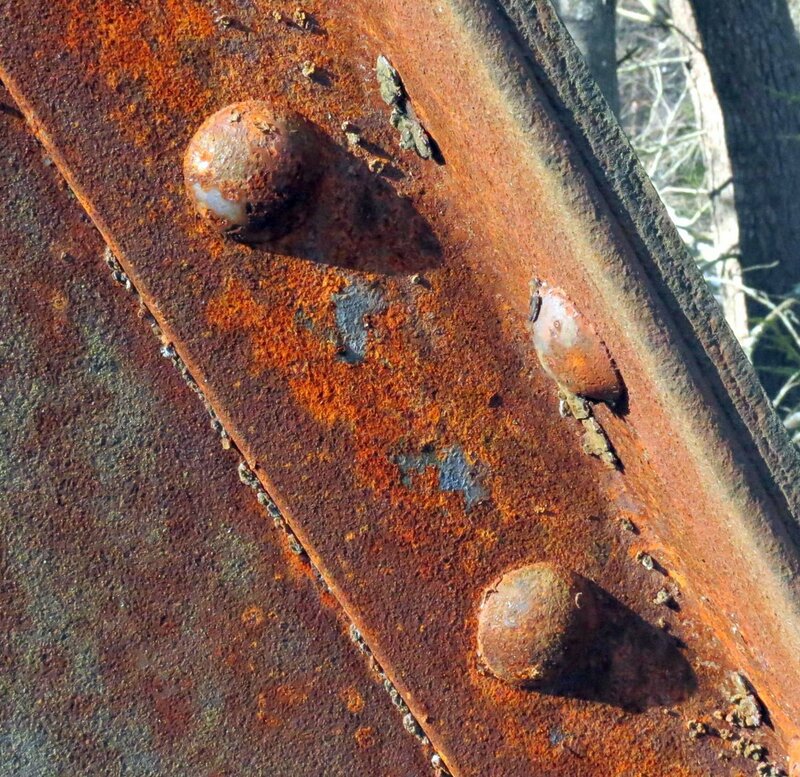 You can see in this photo that the rust is just a very thin coating on the heads of the rivets. 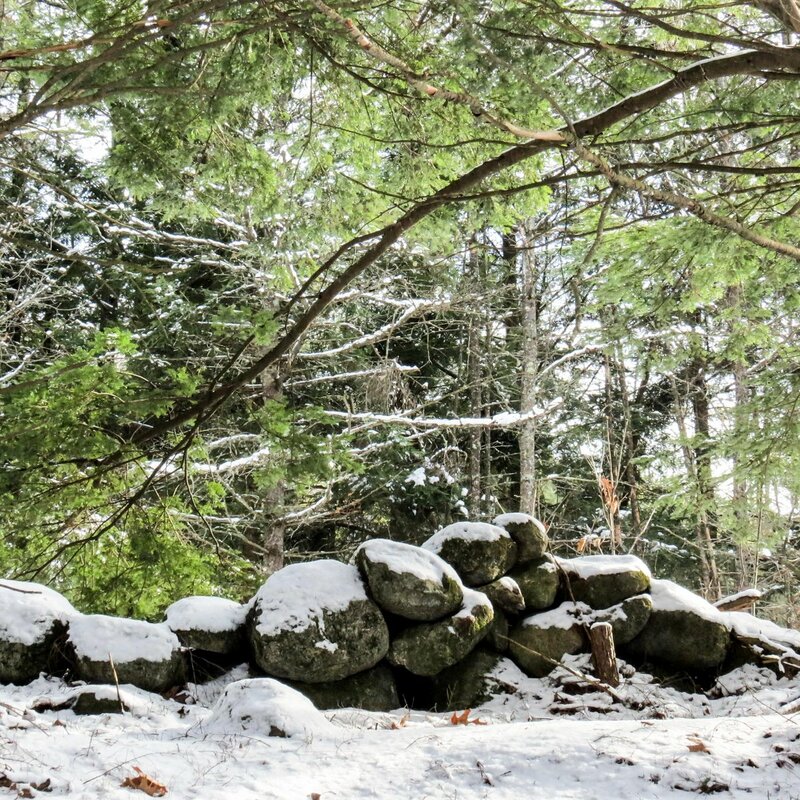 Stone walls marked the property line between landowner and railroad. I’ve tried to find out how wide railroad rights of way are but it seems to vary considerably. I’ve read that the average setback on each side is 25 feet from the center of the nearest rail. Add 10 feet or so for engine width and you have a 60 foot wide rail trail right of way, which seems about right in this region of the country. 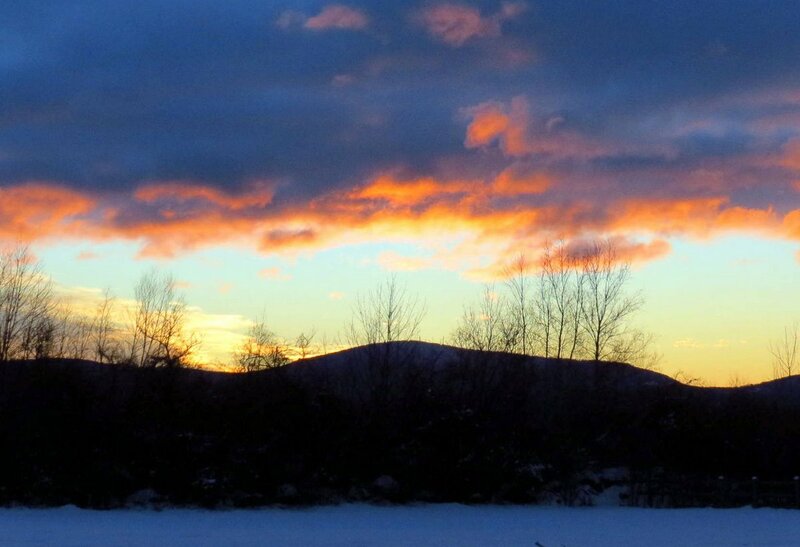 On my way back I was passed by a lady on snowshoes who asked me what I was taking photos of. “Anything and everything,” I told her, but I really wasn’t planning on taking her photo until I realized that she might give the place a sense of scale. This photo shows how, though the right of way might be 60 feet wide the sides aren’t often flat, so this might leave an actual trail width of only 20 feet. Railroad tracks have always been a great place to go berry picking. Raspberries, blackberries and blueberries can all be found in great abundance along most trails. 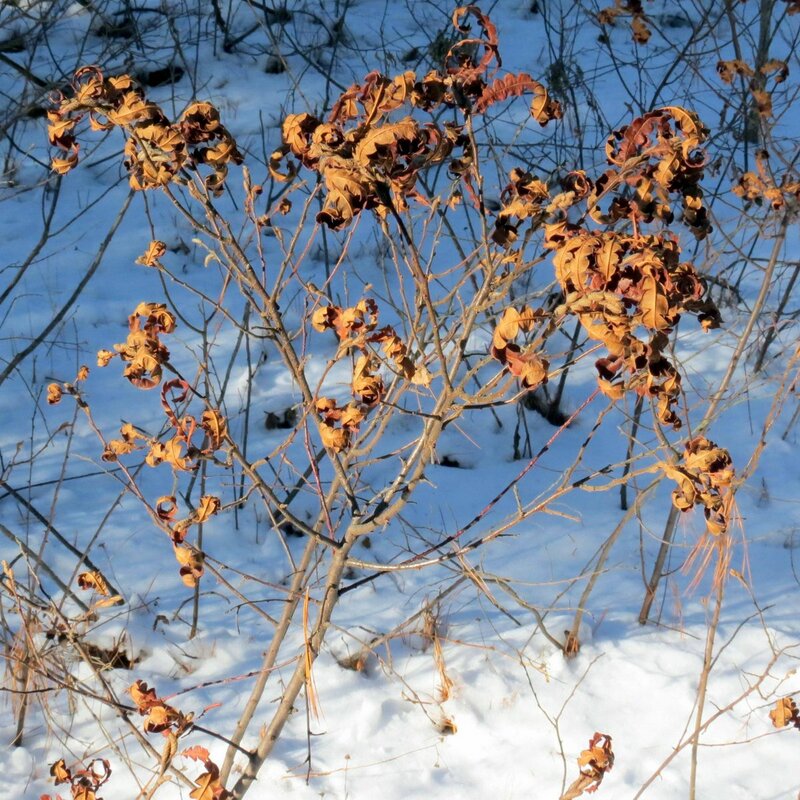 In this section lowbush blueberry bushes (Vaccinium angustifolium) looked spidery against the snow. 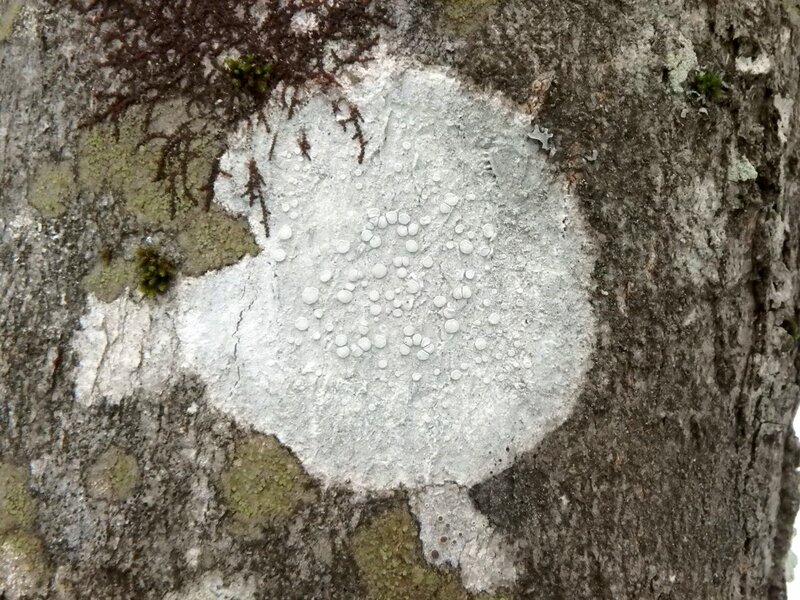 On this trip something I had been wondering about for a few years was finally put to rest, and that was the question do maple dust lichens (Lecanora thysanophora) only grow on maple trees? The one pictured was growing on a beech tree, so the answer is no. So why are they called maple dust lichens? That question I don’t have an answer for. 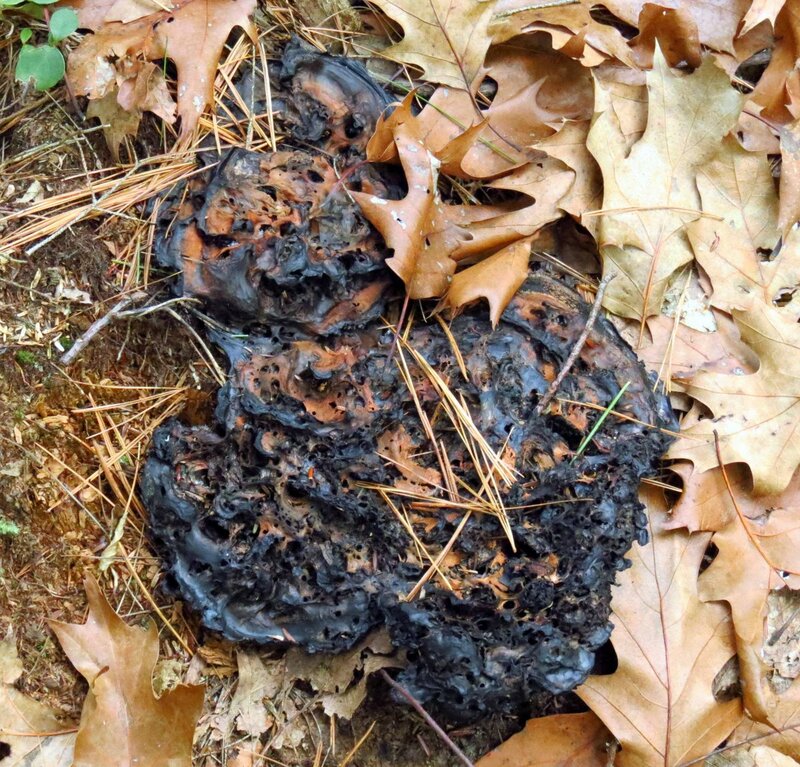 I saw the biggest amber jelly (Exidia recisa) fungus I’ve ever seen out here. It was as big as a toddler’s ear and felt just like an ear lobe. As usual it reminded me of cranberry jelly, which isn’t amber colored at all. I saw the sun lighting up the orange brown leaves of this sweet fern from quite a distance away. Sweet fern is a small shrub with incredibly aromatic leaves which release their fragrance on warm summer days. They can be smelled from quite a distance and are part of the summer experience for me. Though they aren’t ferns their leaves look similar to fern leaves. They are actually a member of the bayberry family and the leaves make a good tasting tea. 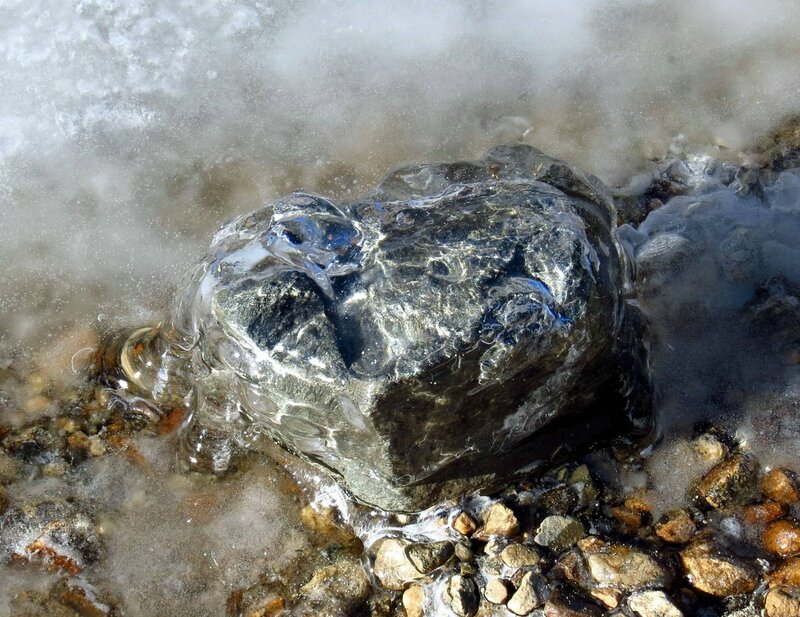 Native Americans made a kind of spring tonic from them and also used them as an insect repellant. On this day I just admired their beauty, glowing there in the sun. 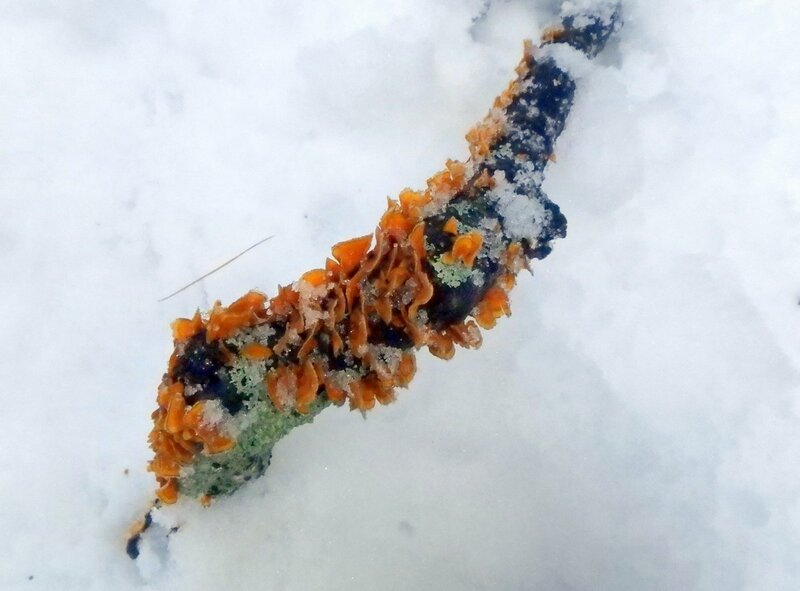 A fallen branch poked up out of the snow as if it had been waiting for me to come along. It showed off what looked from a distance like little orange flowers, but I knew that couldn’t be. They weren’t flowers but they might as well have been because they were just as beautiful. 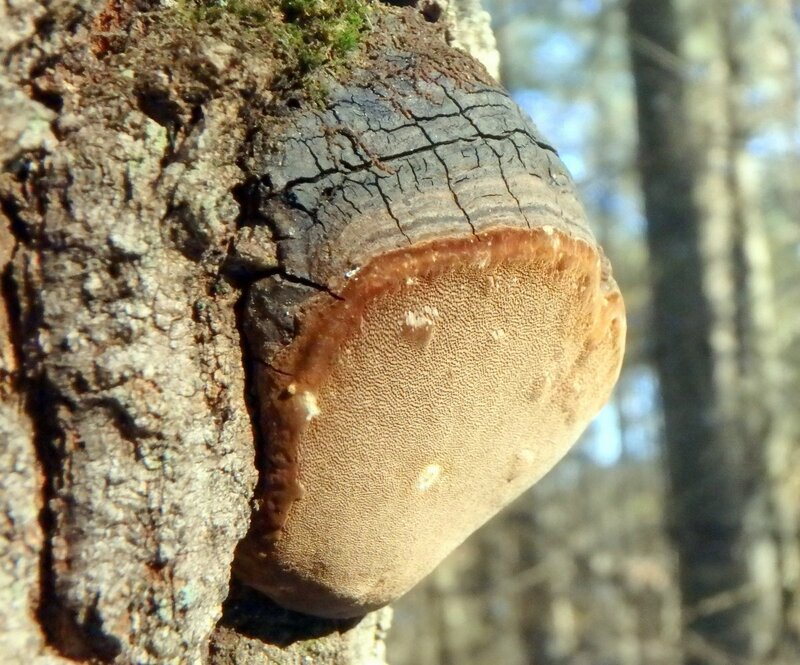 I’m not sure but I think they were older examples of milk white toothed polypores, which are known to brown with age. These hadn’t reached the brown stage but they were very orange and very interesting. 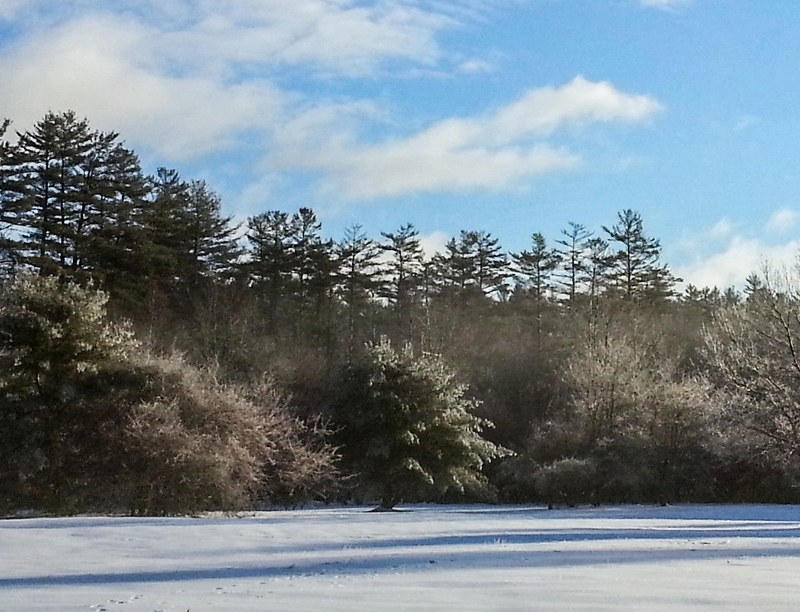 Winter can’t seem to make up its mind this year. We’ll get one or two cold days and then two or three warm ones and the snowstorms have left little more than powdered sugar dustings. After the record breaking warmth of December, January is now 6 degrees above average and after last winter I’m not complaining about any of it. 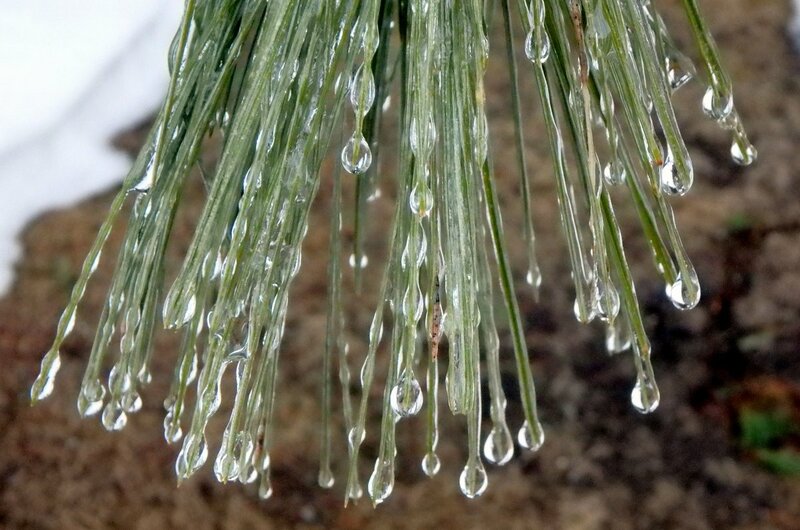 The photo above was taken right after a small ice storm as the sun was melting all the ice off the trees and shrubs. This is what happens when it isn’t light enough for the camera to see. 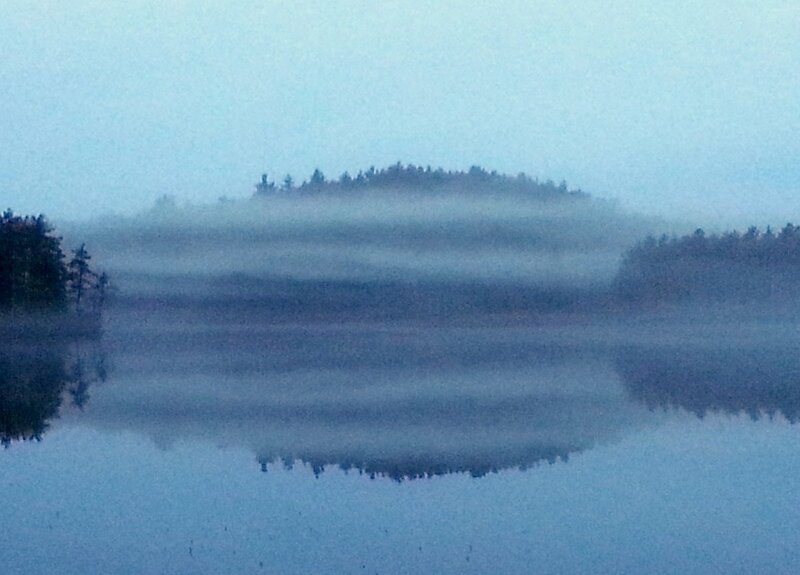 I took this with my cell phone at Half Moon Pond in Hancock at dawn one morning. I was going to delete it but then it started to remind me of a watercolor painting so I kept it. It shows how misty some of our mornings have been lately. 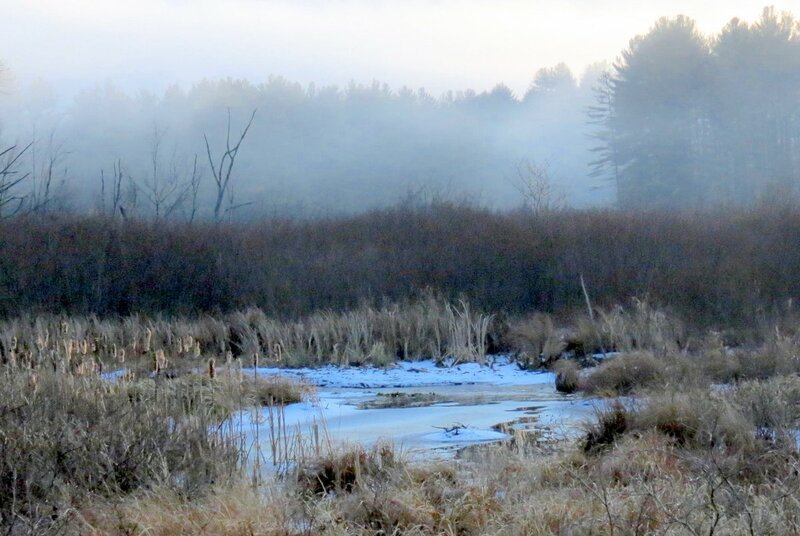 This also shows how misty it has been but this was taken at sunset after a dusting of snow fell that morning. 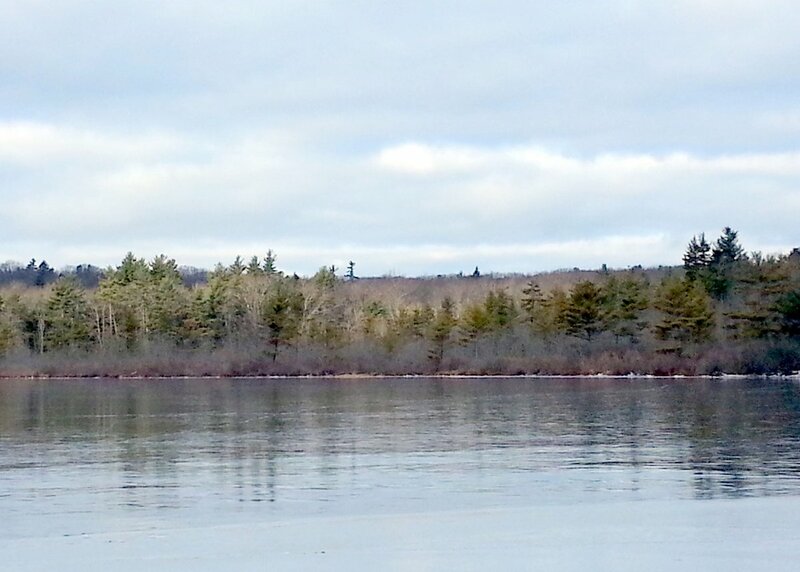 Our smaller ponds have started to freeze up but the ice is thin and ice fishermen are getting frustrated. 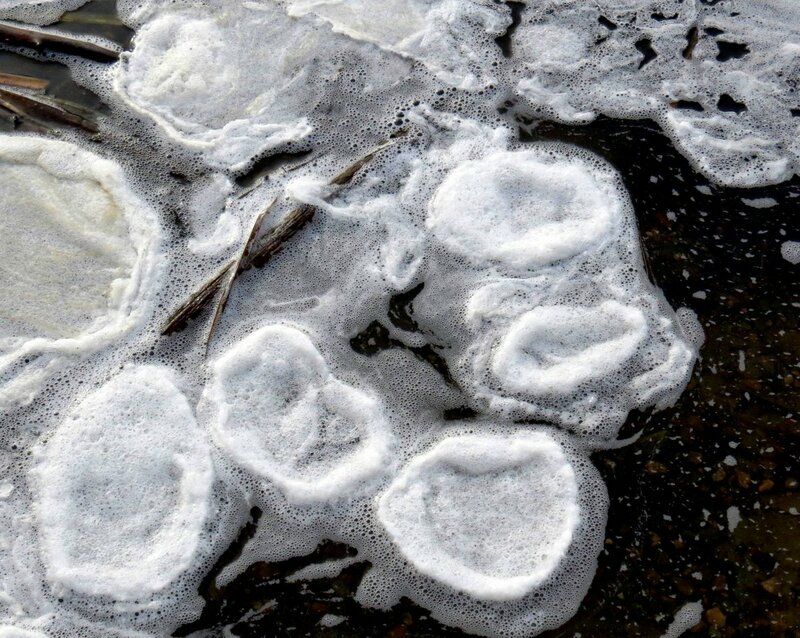 The river has hardly frozen at all but one day it was full of these curious white pancakes. The pancakes turned out to be river foam that had collected into discs and then had frozen overnight. There was a tiny bit of ice on the Ashuelot River and some mallards swam by it just as I was preparing to take its photo. 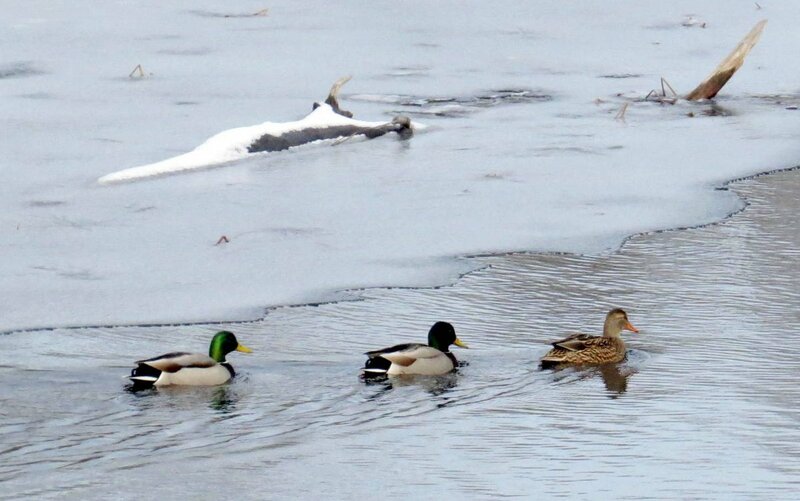 Two males and a female, with the female leading the way. 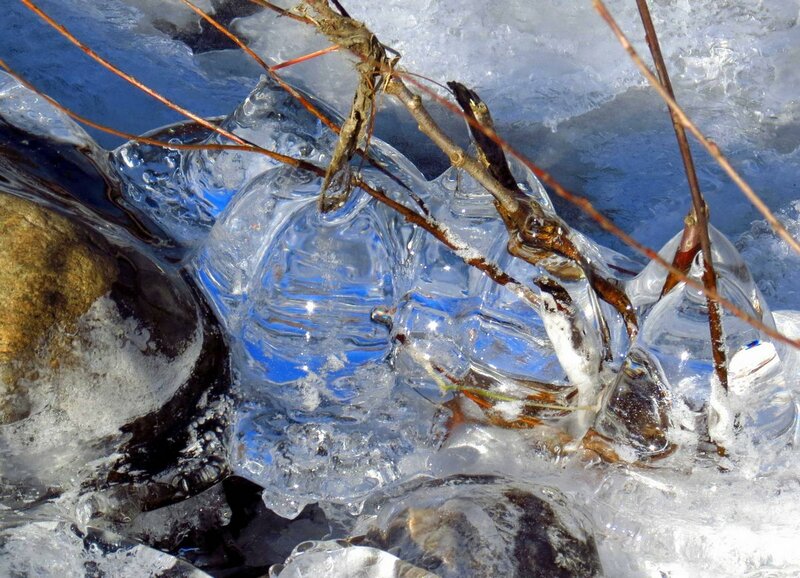 This is what happens when a pond freezes and then it rains and the rain freezes; glare ice. If it hadn’t been so thin it would have been an ice skater’s dream come true. 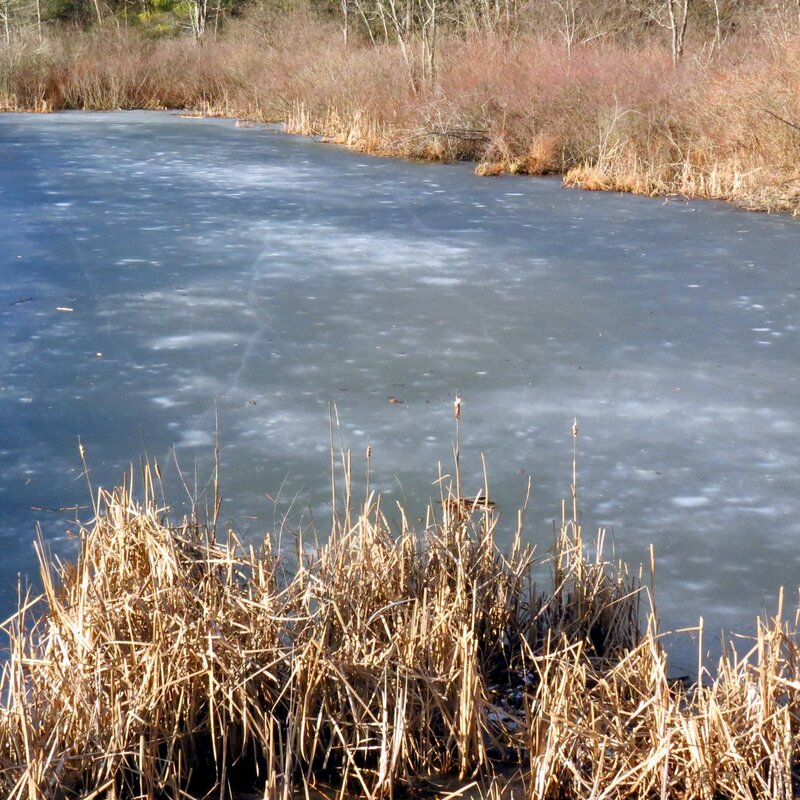 Thin ice causes problems every year and this year is no different. I’ve already heard of two boys and a snowmobiler having to be rescued, and a deer was rescued one night as well. They’re all lucky to be alive. I wonder how the deer get through a winter like this. They can’t stand on the ice very well and sometimes all 4 feet splay out from under them. 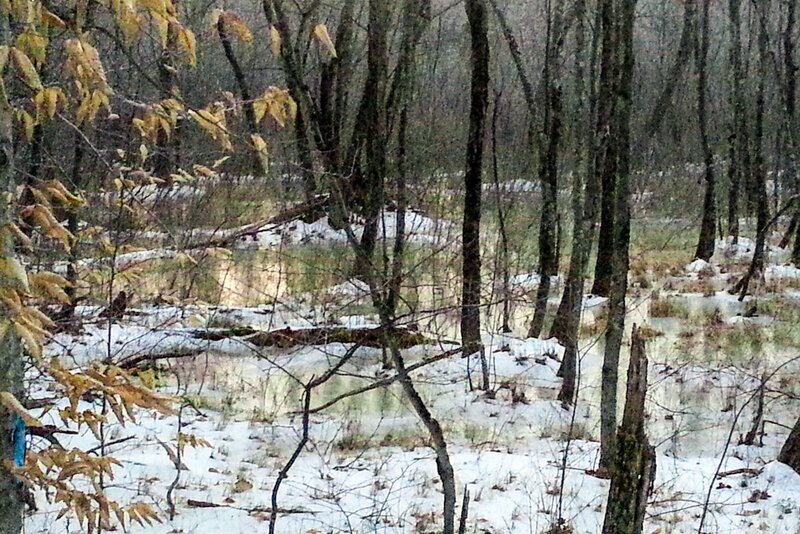 In some places the woods are full of ice as the above photo shows, so I think the deer are might be having a rough time of it. I saw a huge old maple tree that was hollowed out enough for me to have comfortably had a sit down in it if I had been so inclined. 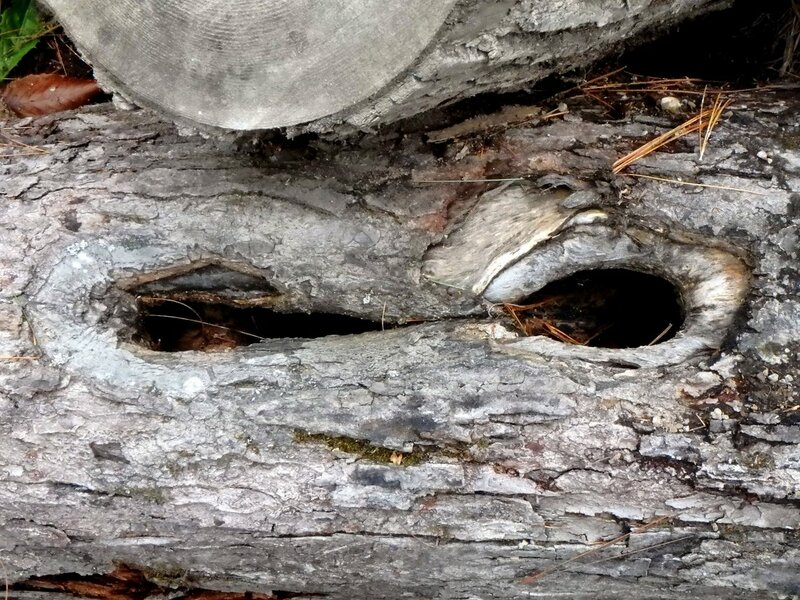 There are more hollow trees living in the forest than one would guess. Can you see the setting sun in this old pine tree? 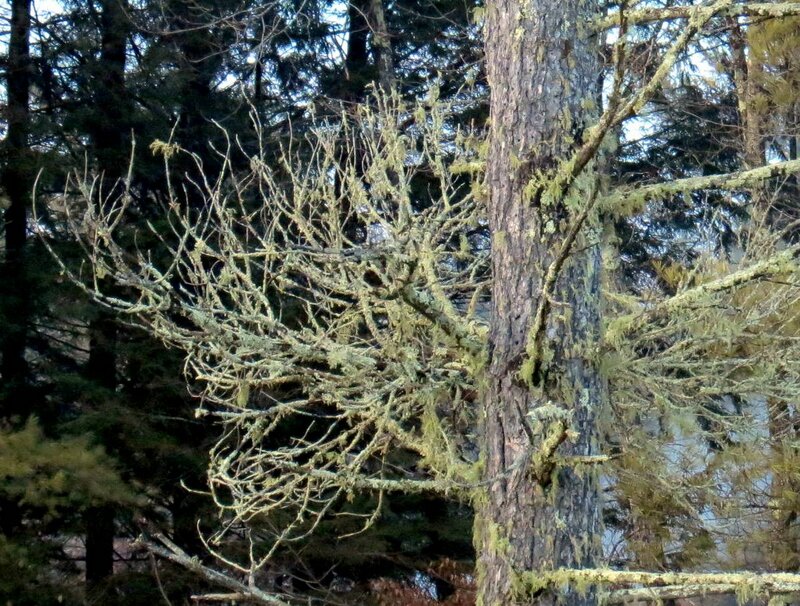 I took its photo because the setting sun lit up the lichens covering almost every bit of exposed branch. The branches themselves have grown into a witches’ broom, which I rarely see on trees, especially conifers. According to the Arnold Arboretum the English term witches’-broom translates directly from the German word Hexenbesen. Both parts of the German compound word are found in English as hex, meaning to bewitch, and besom, a bundle of twigs, meaning witches’ broom is a bewitched bundle of twigs. Even though that might be what it looks like it is actually a deformity caused by any number of things such as disease, fungi, insects or viruses. Many dwarf conifers have been propagated from witches’ brooms and collecting and growing new specimens is big business. 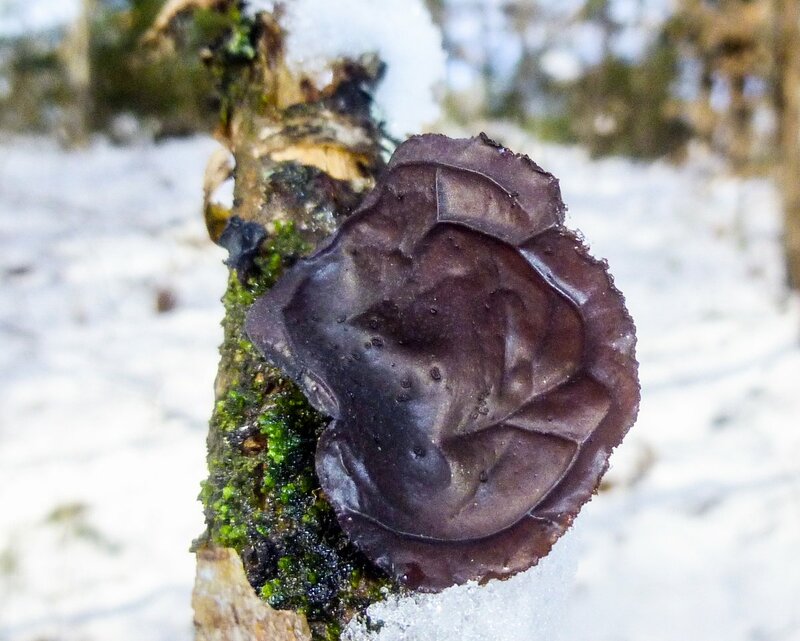 Winter is when jelly fungi appear and one of easiest to find is black jelly fungus (Exidia glandulosa.) 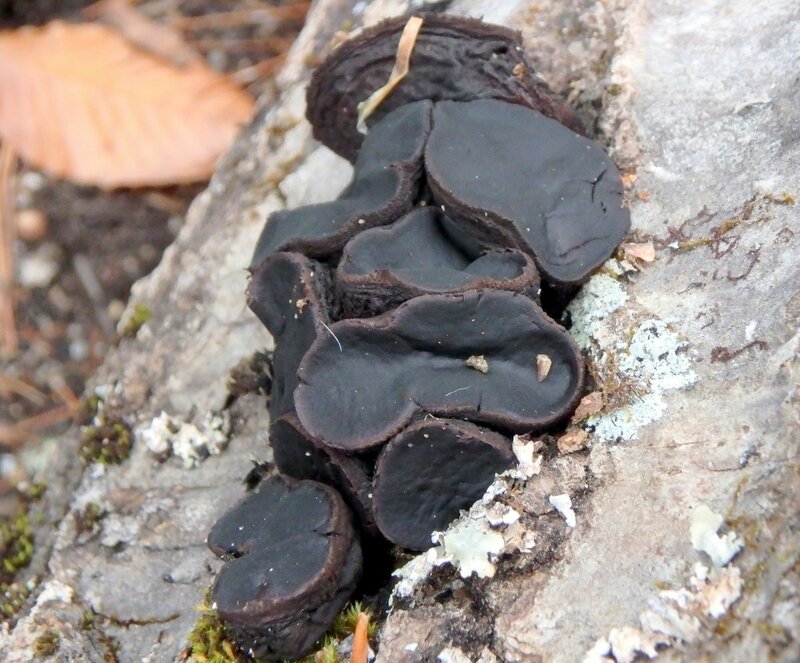 This pillow shaped, shiny black fungus is common on alders here. 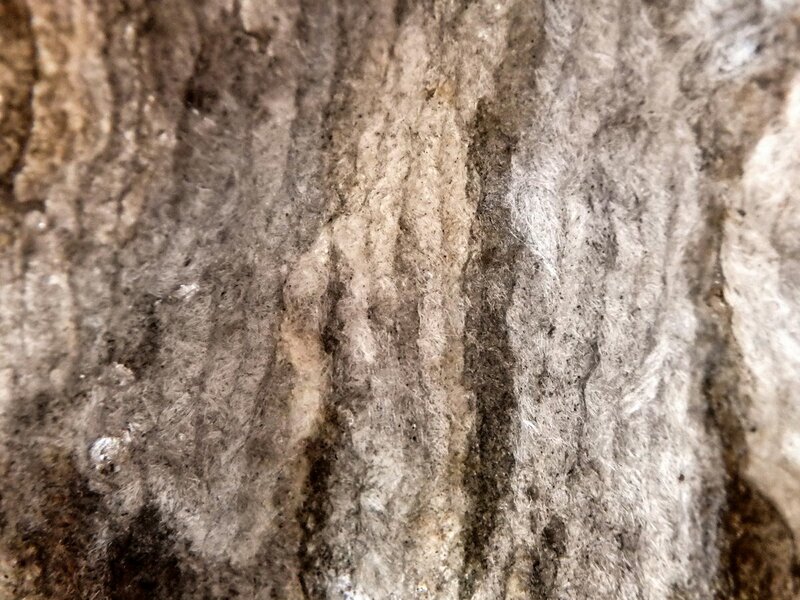 When it dries out it loses about 90% of its volume and shrinks down to small black flakes, and it looks like someone has smeared paint or tar on the limb that it grows on. This one shows well that jelly fungi are mostly water. 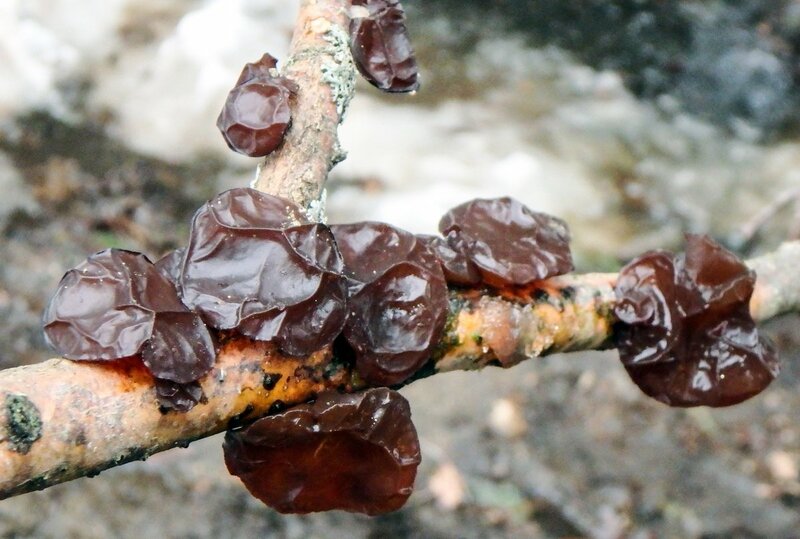 Amber jelly fungus (Exidia recisa) is also common and I find it on oak or poplar limbs. You can’t tell from this photo but it has a shiny side and a matte finish side. The spores are produced on the shiny side and if I understand what I’ve read correctly, this is true of most jelly fungi. This one has the color of jellied cranberry sauce. This is one of the biggest orange jelly fungi (Dacrymyces palmatus) that I’ve seen. Orange and yellow jelly fungi seem to appear earlier in the season than black or amber jellies do, so I see more of them. Jelly fungi are fun to see because they add beauty to the winter landscape, but people seem to have a hard time finding them. I think that they probably miss seeing them and many other things because they’re thinking more about where they’re going than where they are, and they walk too fast. To find the small beautiful things in nature I have to walk slowly and focus completely on right here, right now; just the immediate surroundings. If you’re in the woods thinking about what you’ll do when you get home you probably won’t see much, and you’ll remember less. 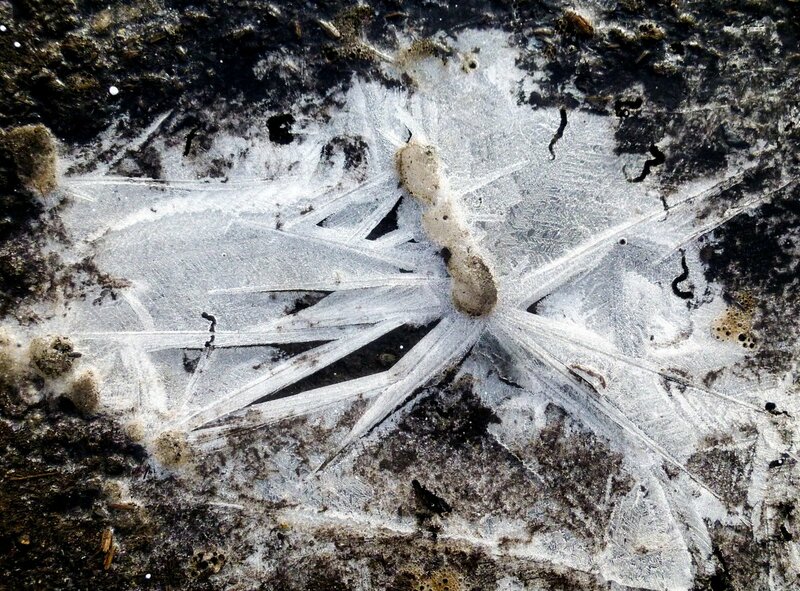 I’ve seen a lot of puddle ice this year that has grown long, sharp looking ice crystals. 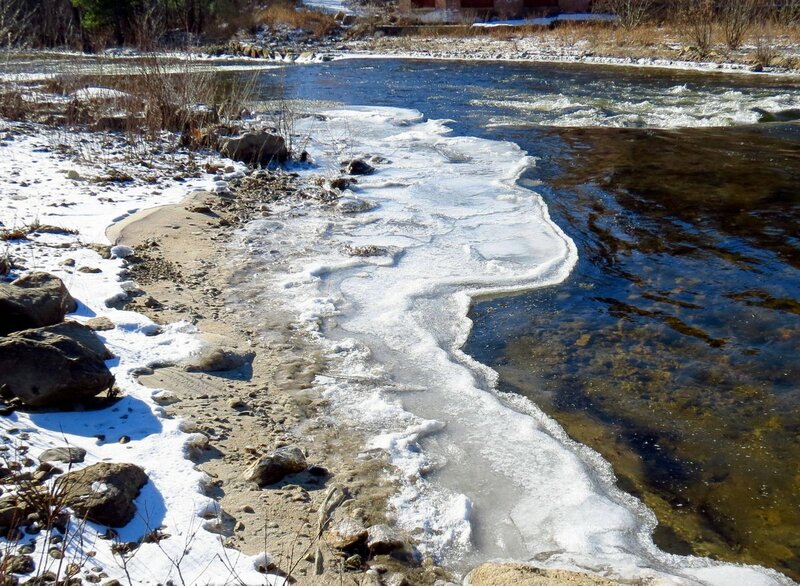 As you’ve seen so far this winter is more about ice than snow, but even that hasn’t approached anything near severe. Winter can’t seem to make up its mind and everyone wonders if it will be as severe as it has been for the last two years. Last year it all happened in February so it’s still a possibility, but I try to think about how each passing day means the sun stays out a little longer and brings us another day closer to March. From that point it’ll be doubtful that we’ll see any severe weather, but anything is possible.